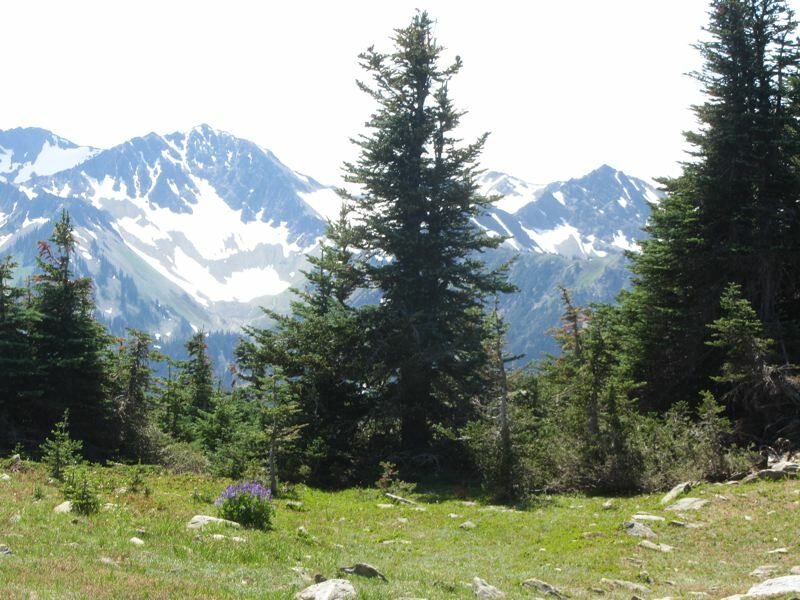 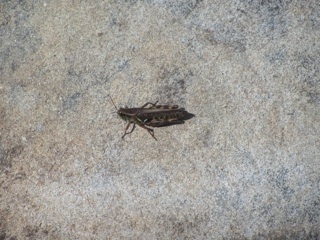 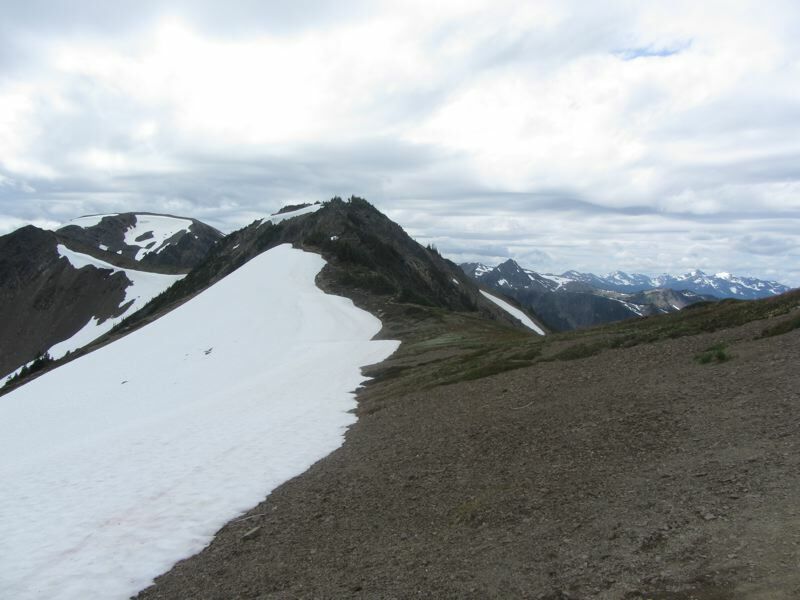 For more on Obstruction Point, see our Obstruction Point Trail web page. 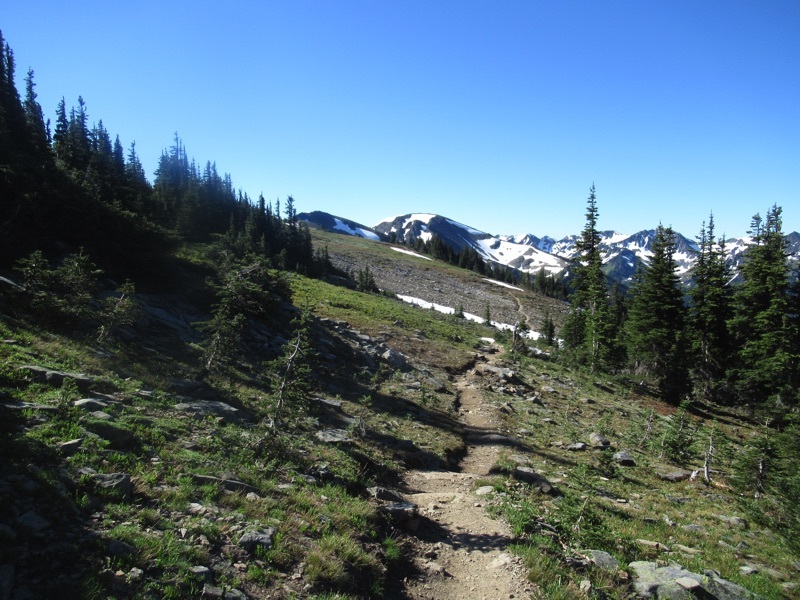 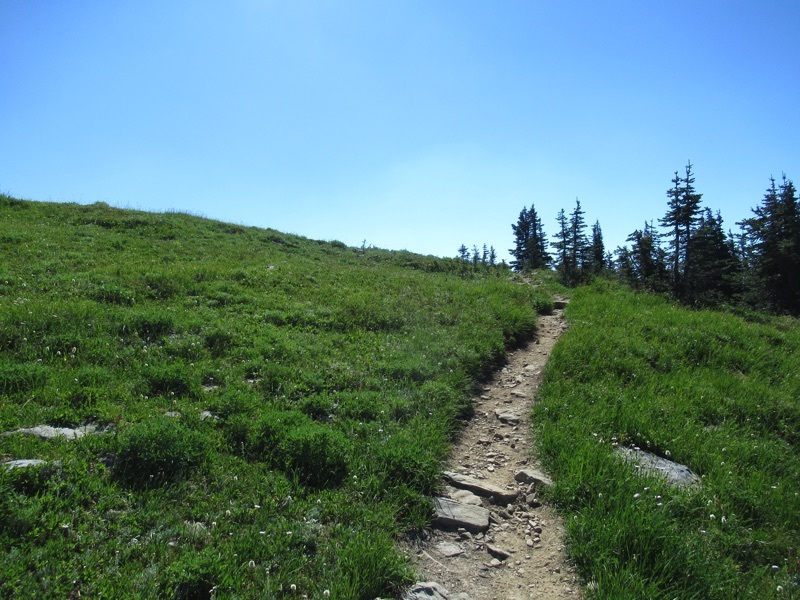 Hiking the trail out of Obstruction Point is a lot like walking through Venice. It is hard not to take a picture postcard perfect shot by just raising one's camera and pressing a button. 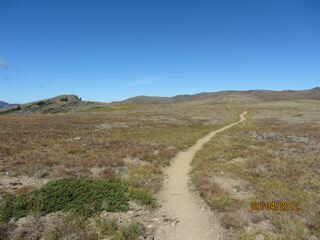 This time, we captured the brilliant sun, the late summer scene, some grice or grouses, or perhaps both. Instant picture postcard - It's instagrammable up there. 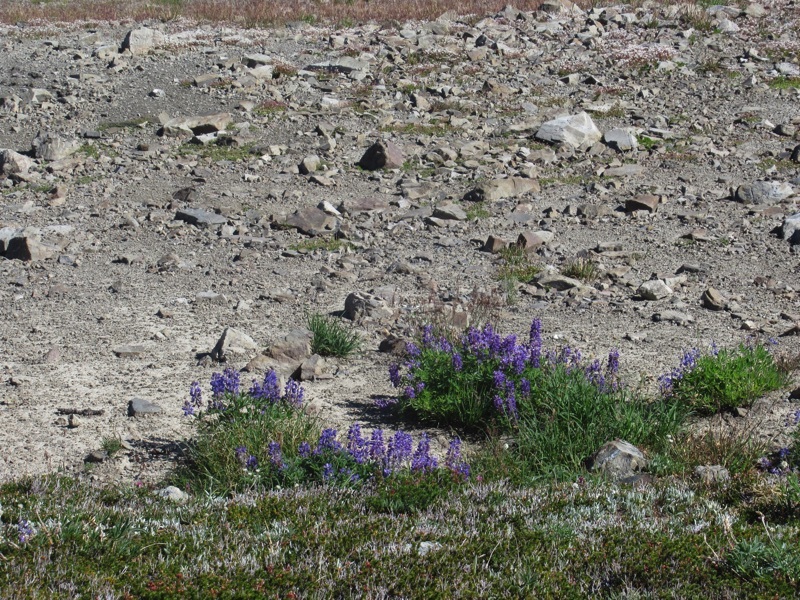 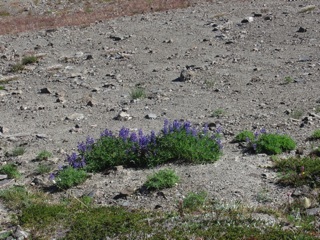 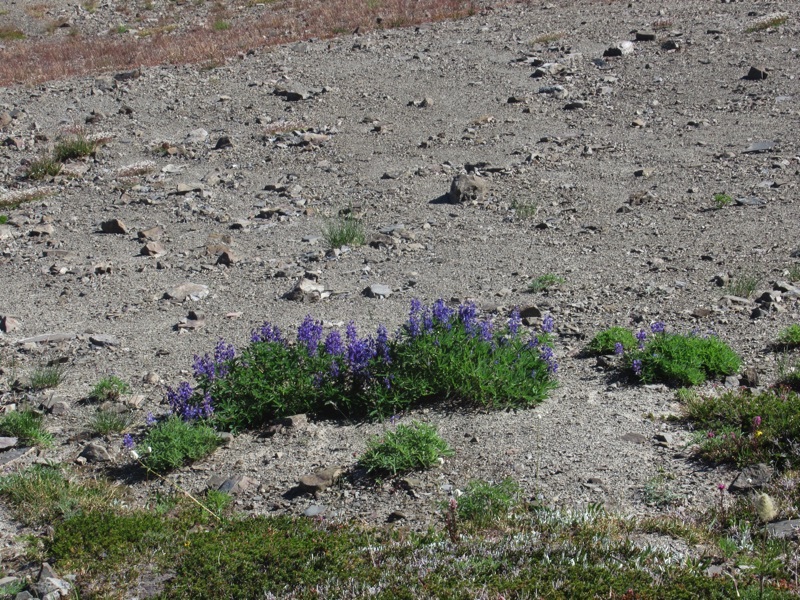 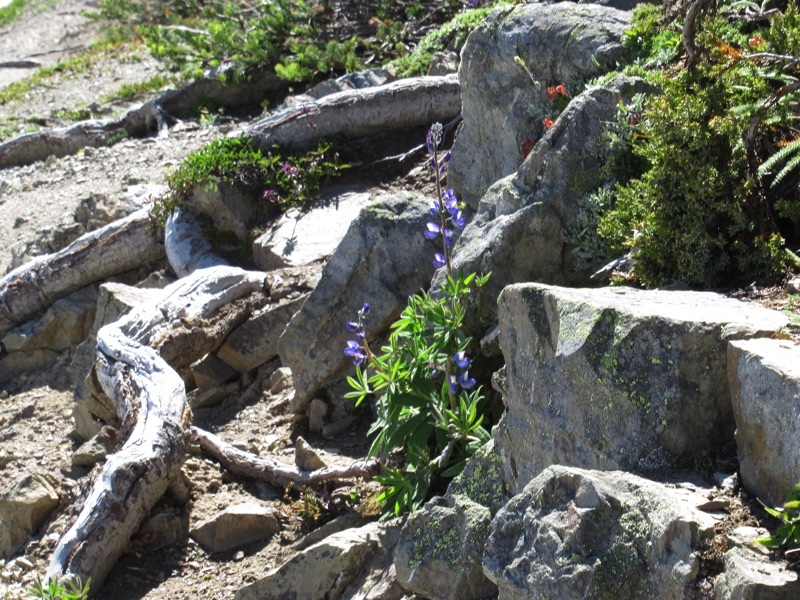 More lupines - This wasn't a great season for them, so we really appreciated these. 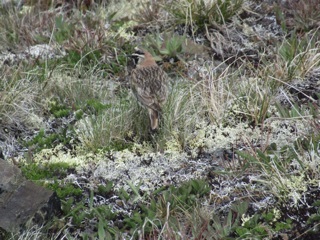 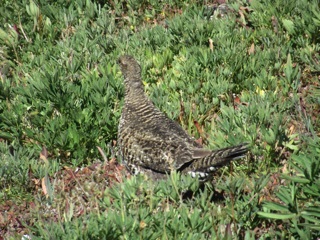 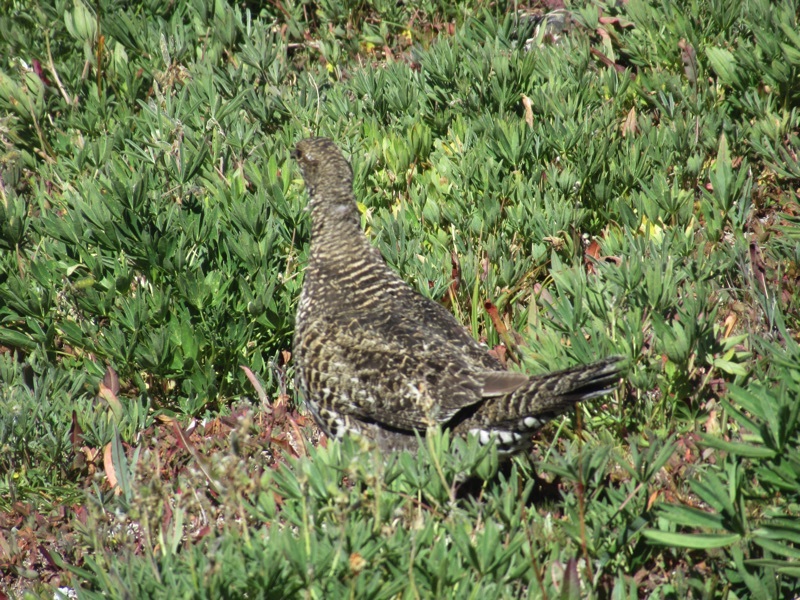 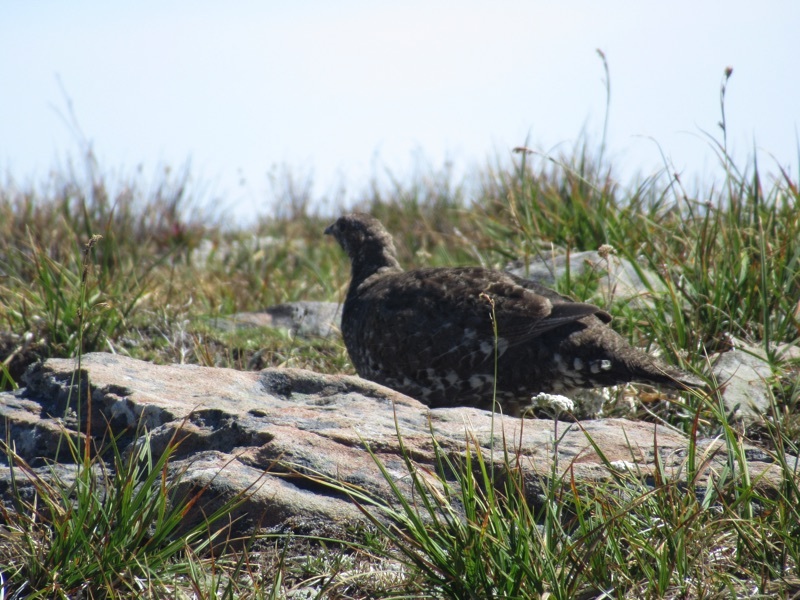 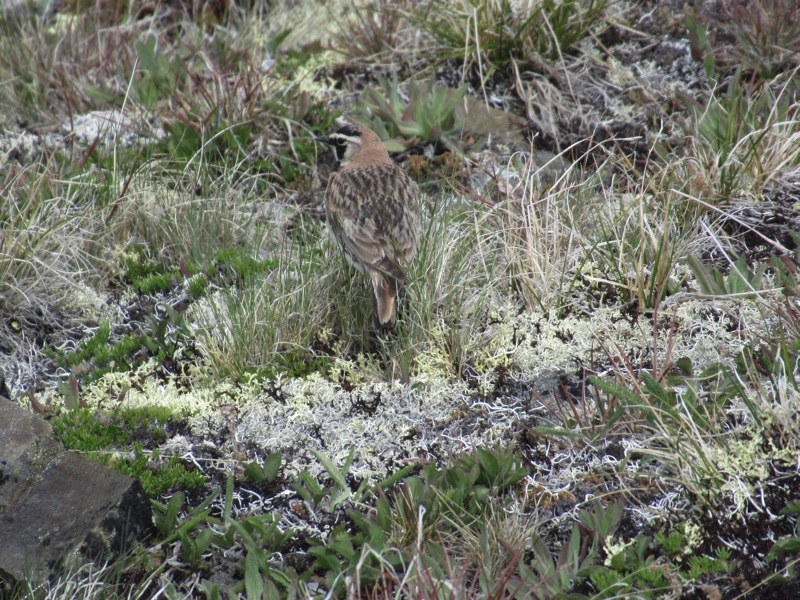 Another grouse - To paraphrase Walt Kelley, The grouse is a singular animal; no one can say two of them. 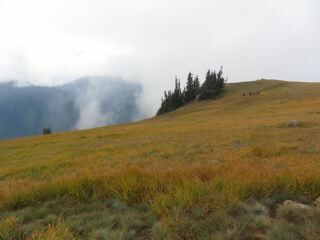 We've been getting up early to avoid the summer traffic to Hurricane Ridge. 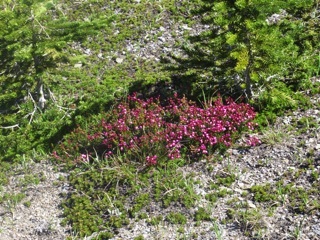 We drove out to Obstruction Point, and the early morning light gave everything an amazing glow with the bright colors set off by deep shadows. 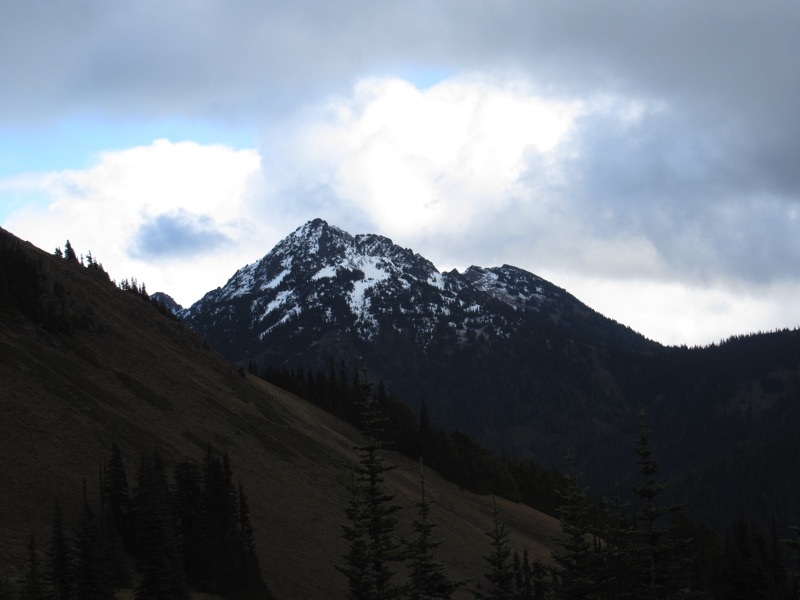 These pictures barely capture it. 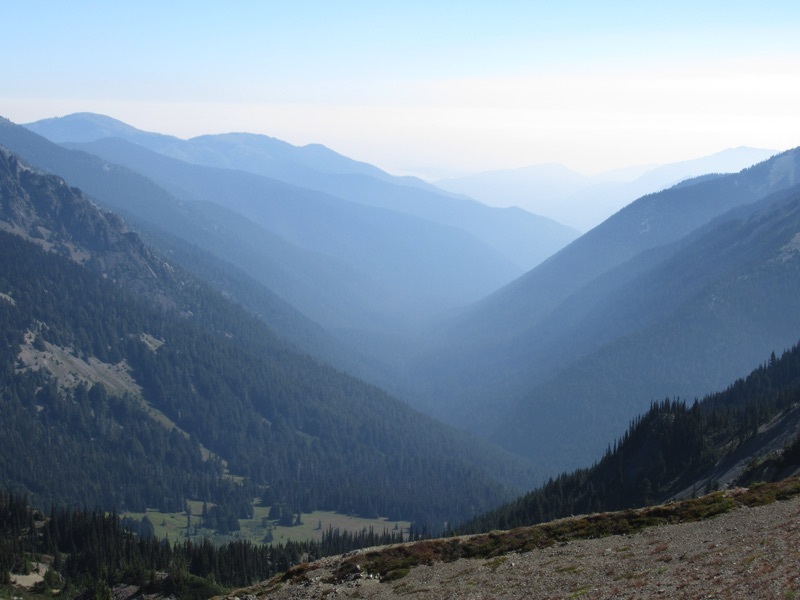 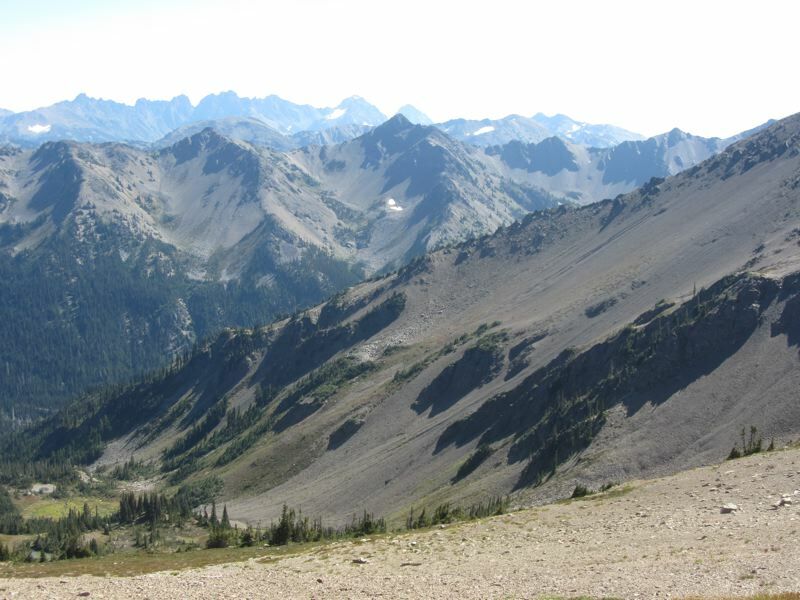 The drive to Obstruction Point has its hairy moments along with its spectacular scenery. 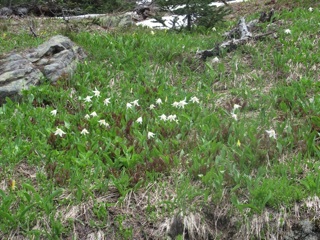 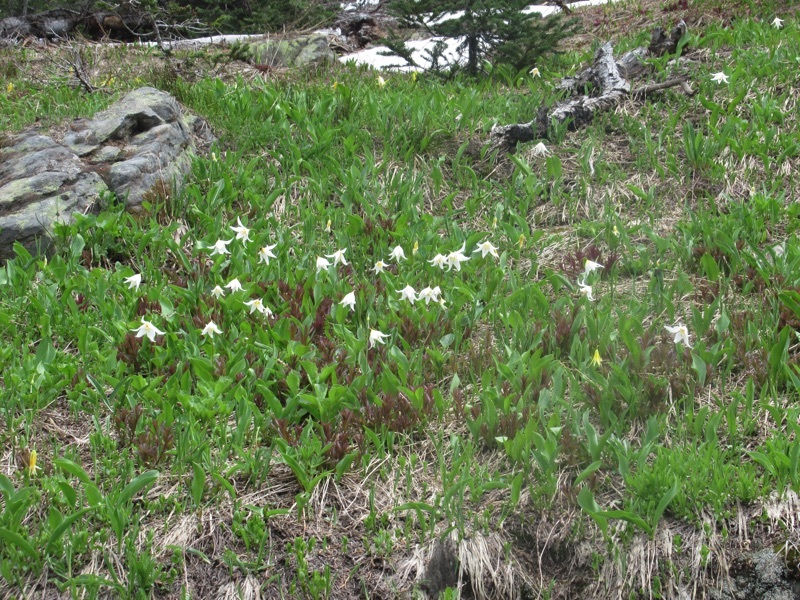 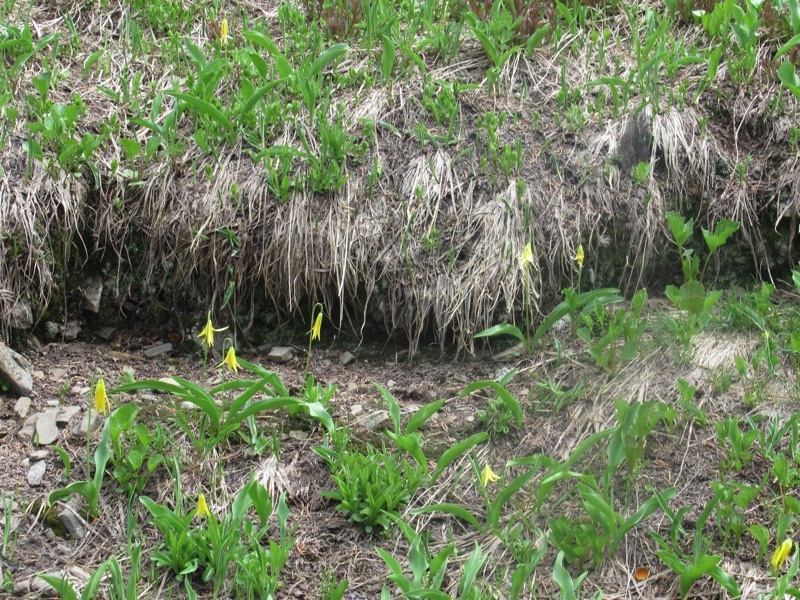 In the forested areas, where one cannot see the mountains, the forest floor is covered with avalanche lilies this time of year. In the fields as one approaches the point, there are marmots out foraging. 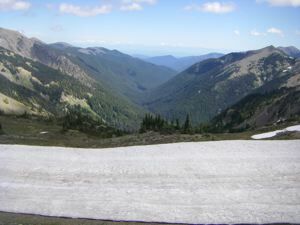 The road from Hurricane Ridge out to Obstruction Point is usually closed well into July, but this year it opened in mid-June.Despite all the road construction, we made our way out there a few days ago. 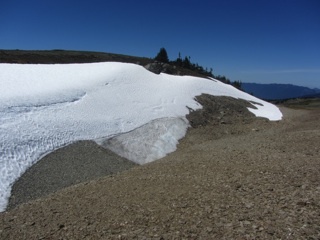 There was still a fair bit of snow, perhaps more than we have ever seen, but we ventured forth anyway. 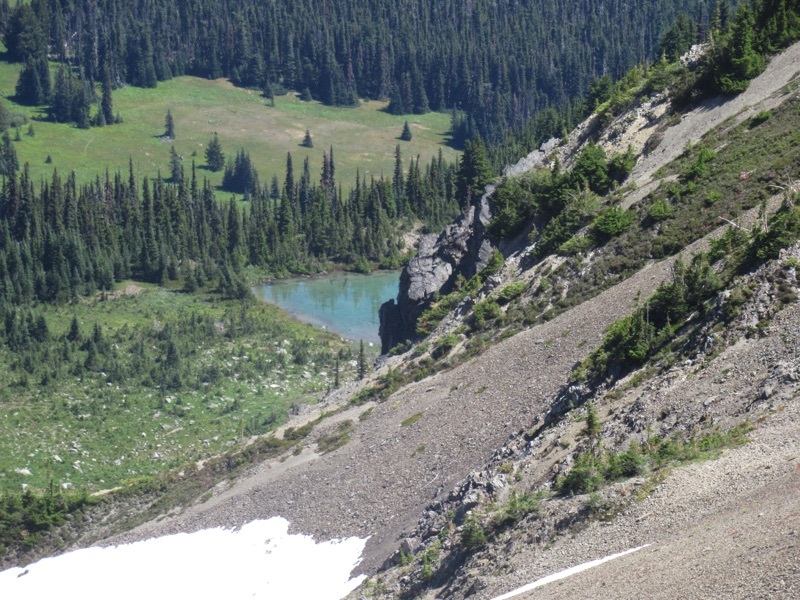 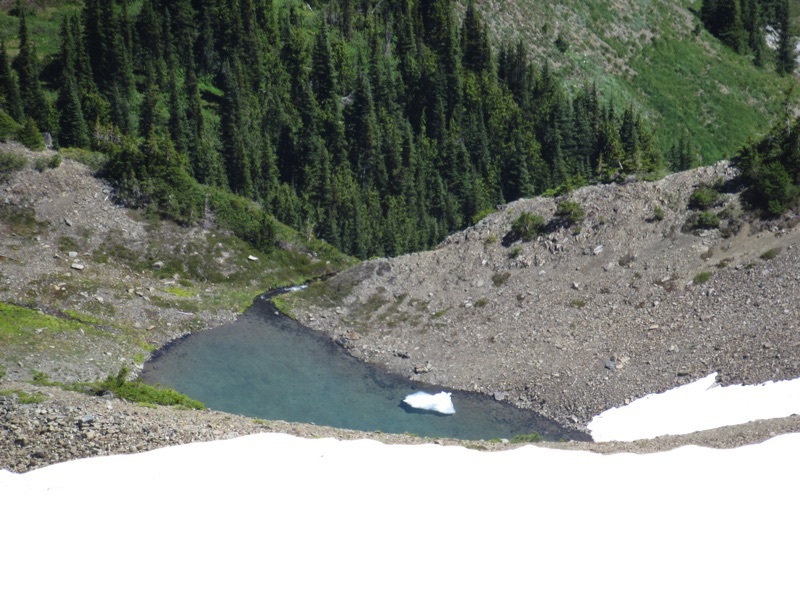 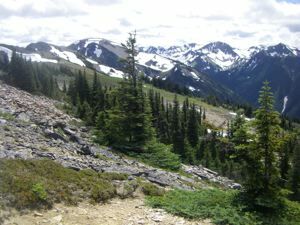 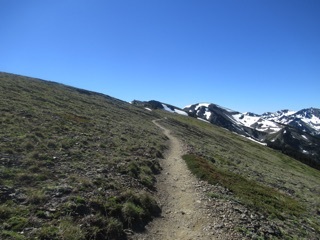 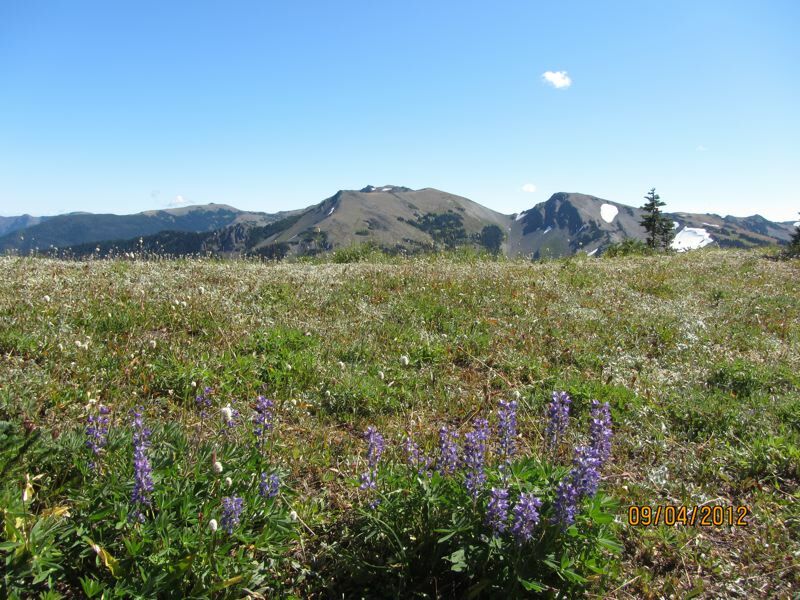 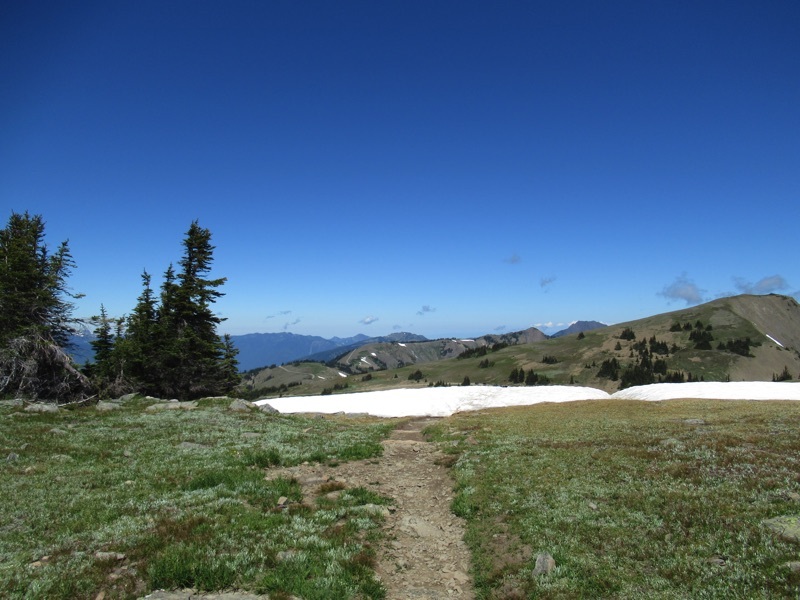 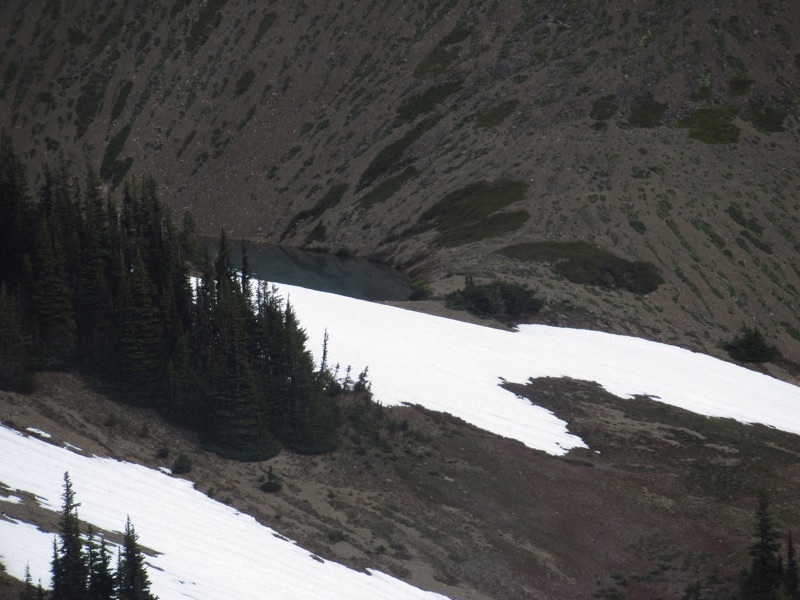 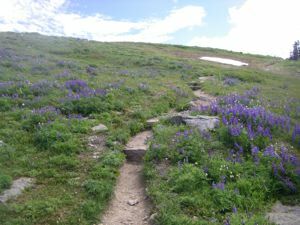 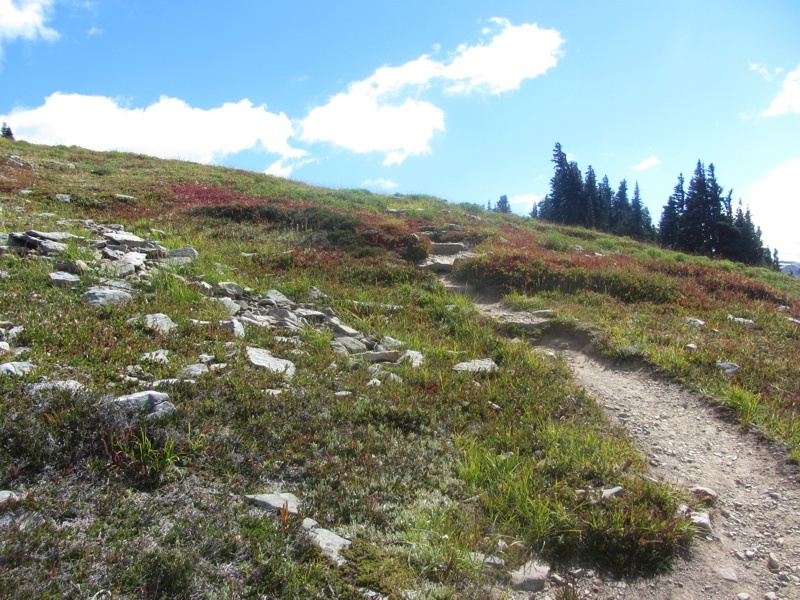 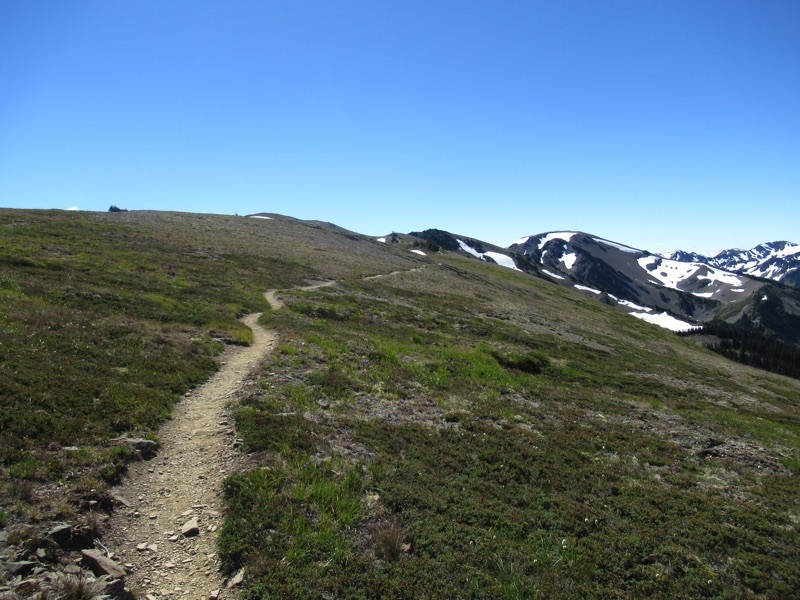 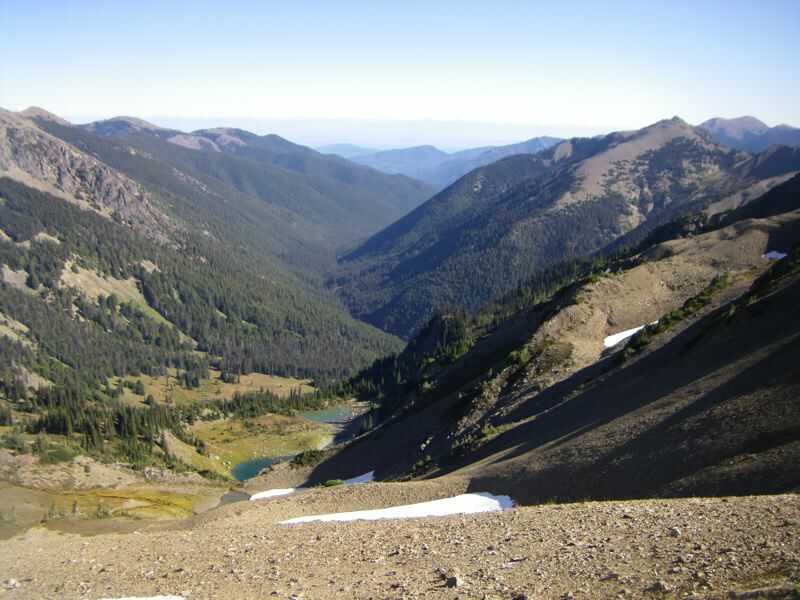 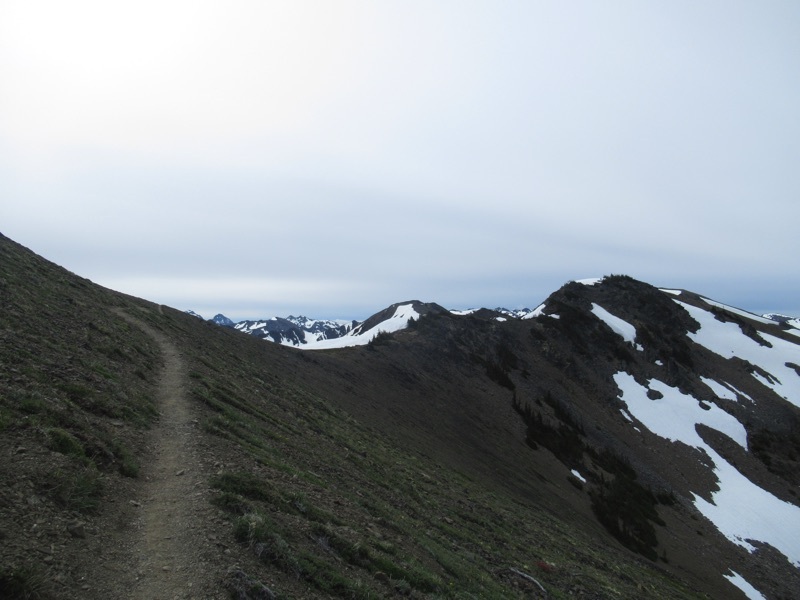 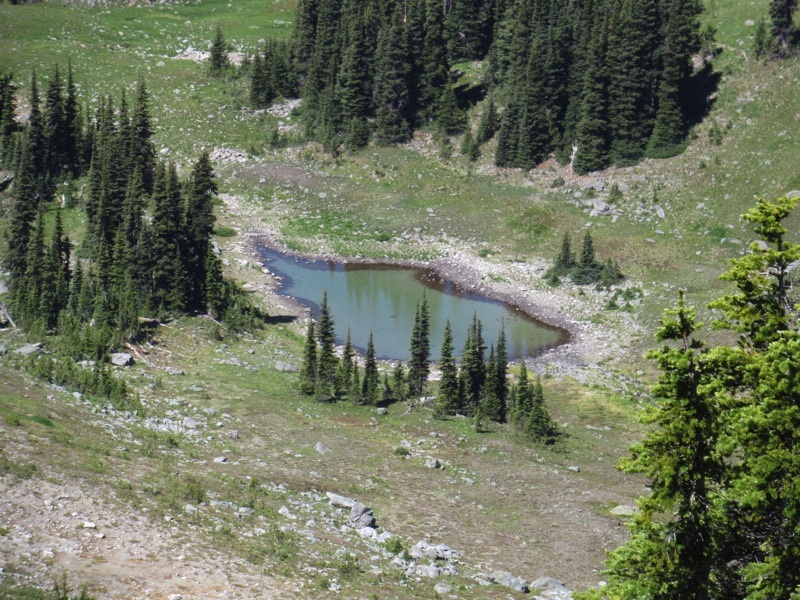 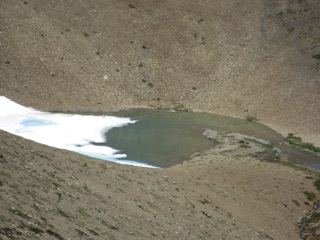 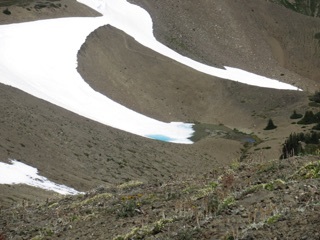 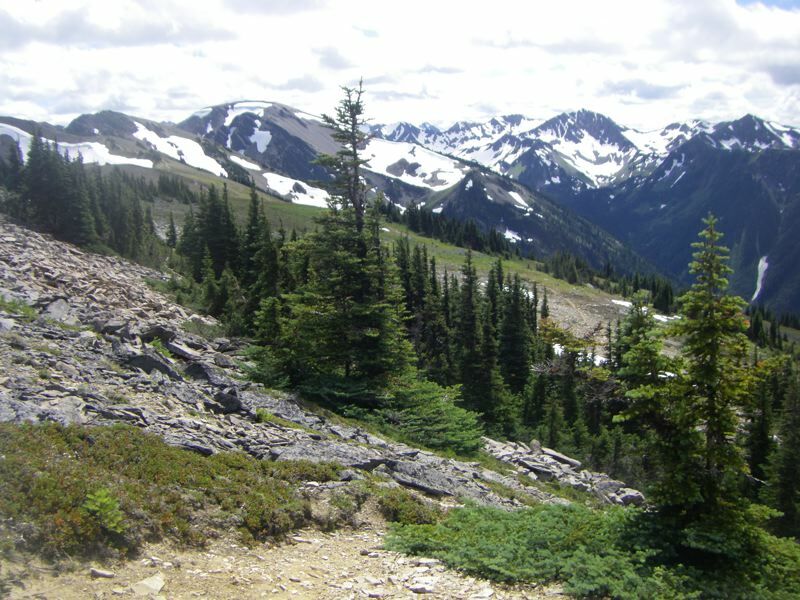 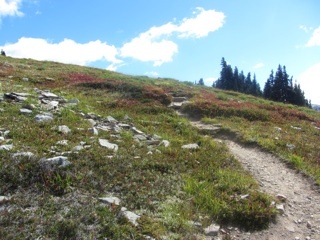 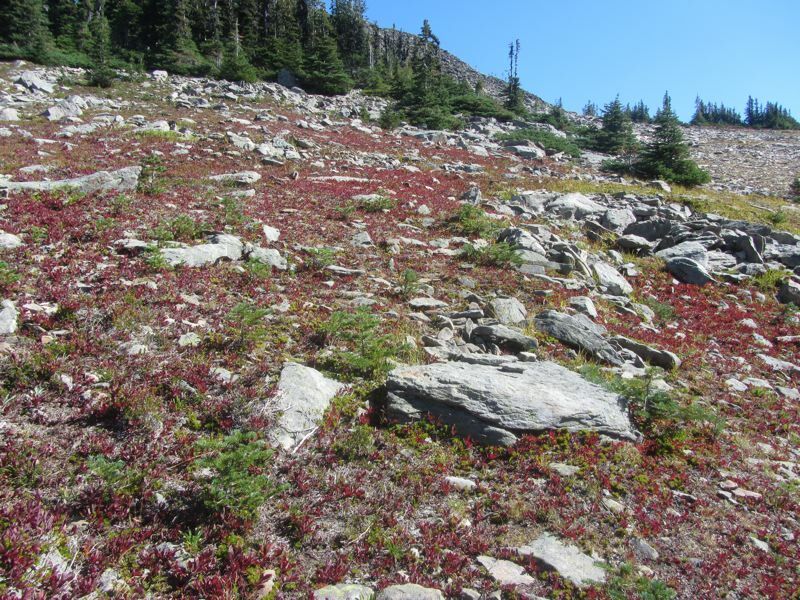 There were marmots and wildflowers and lakes melting from the snow and ice. 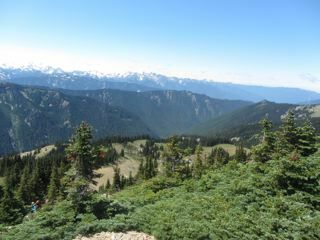 We made our way down the staircase and followed the trails to the overlook with its view of Grand Lake. 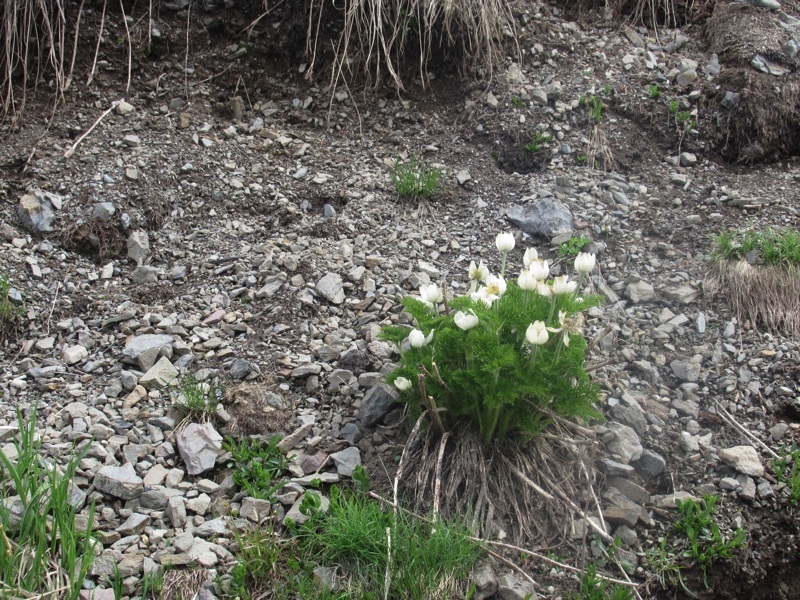 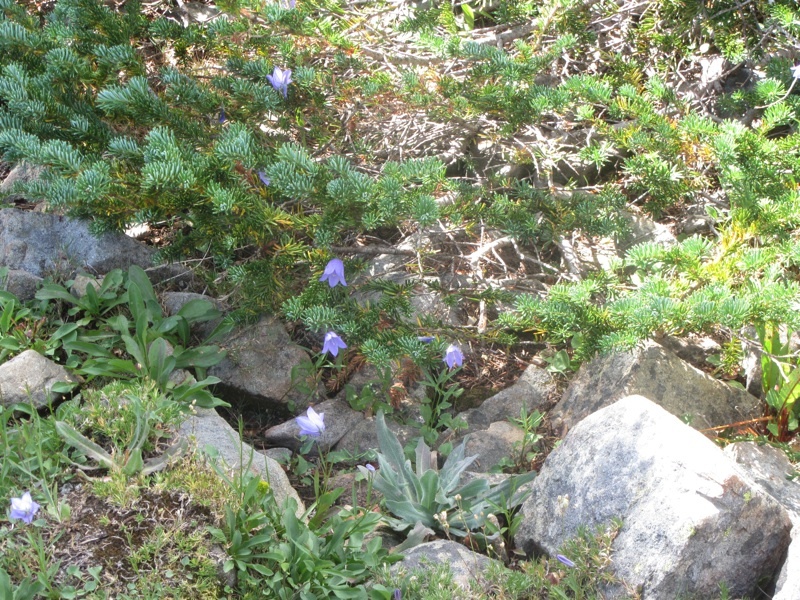 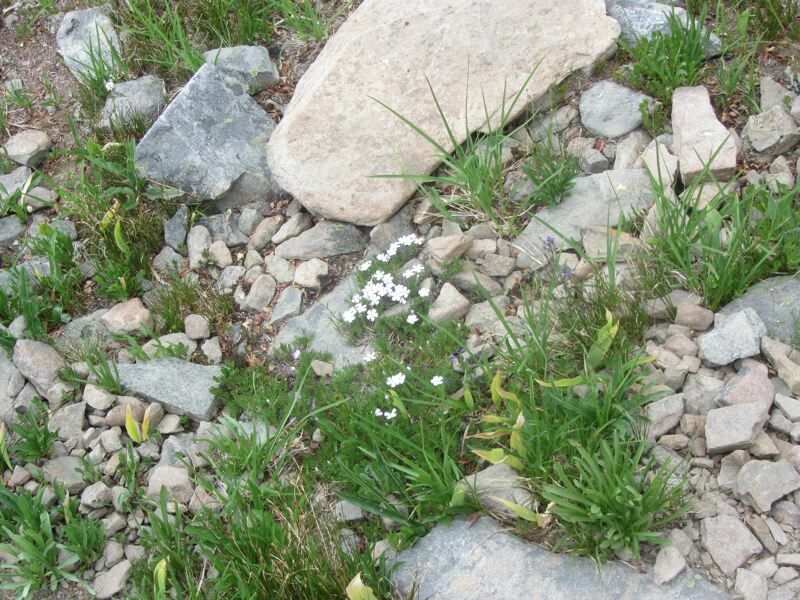 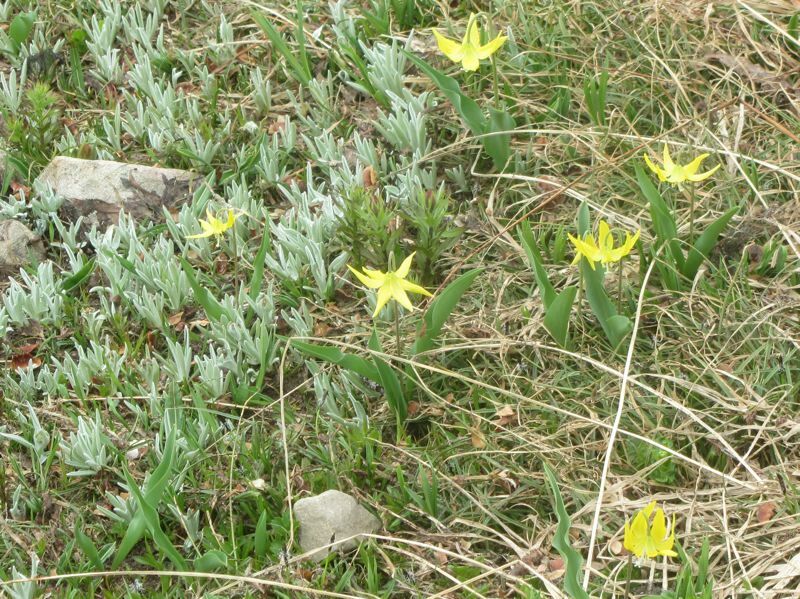 It was still early in the season with phlox and glacier lilies here and there. 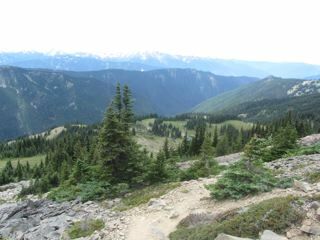 There are amazing views from this trail. 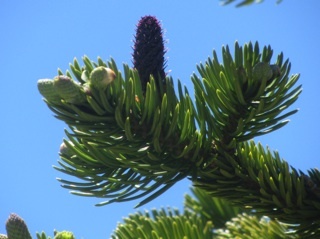 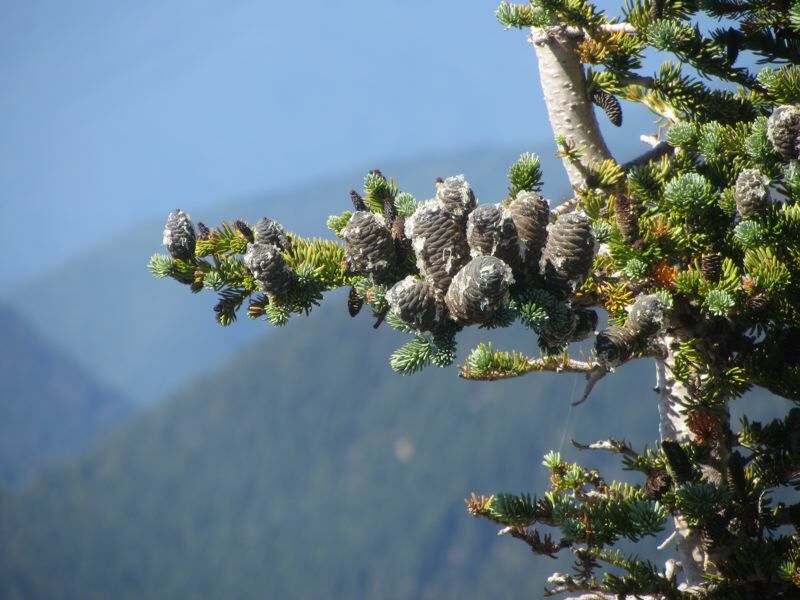 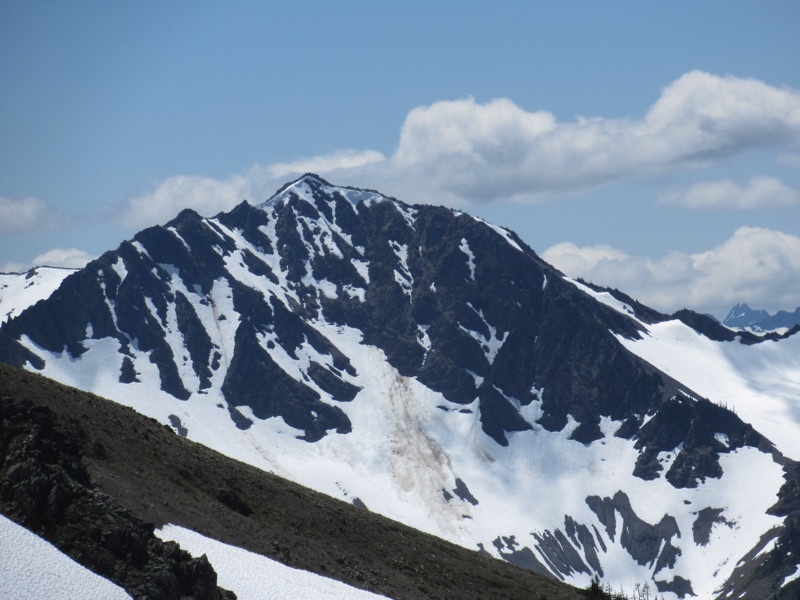 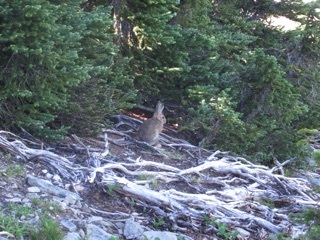 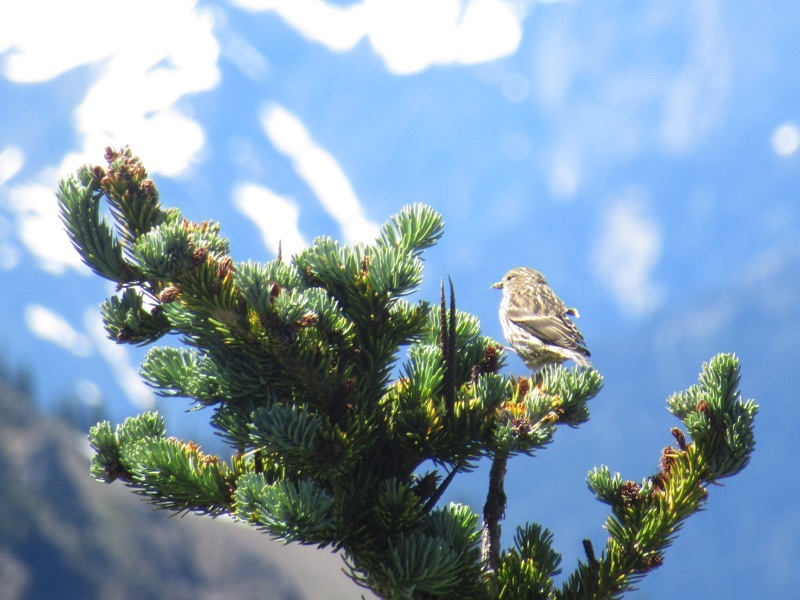 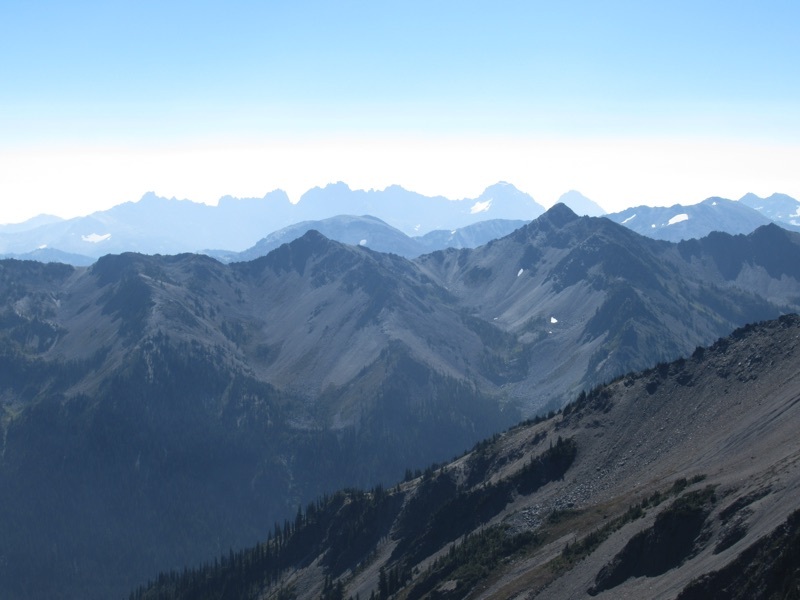 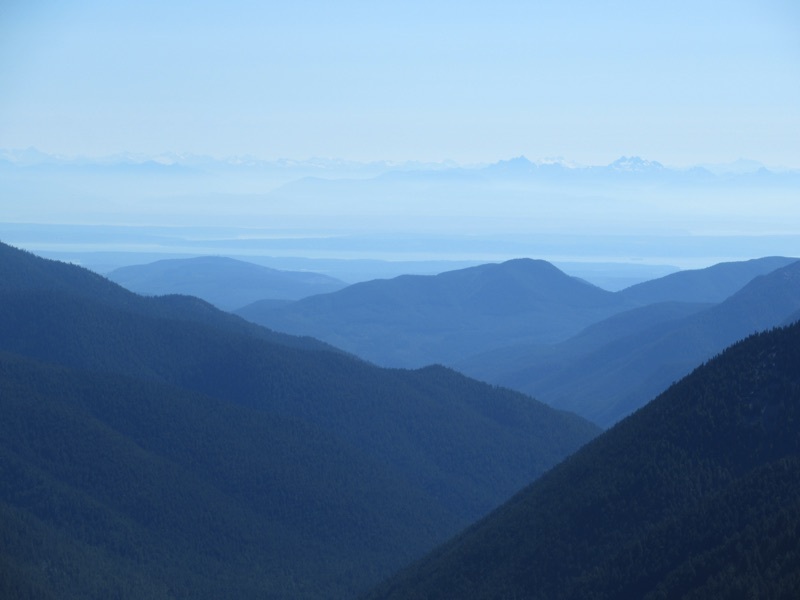 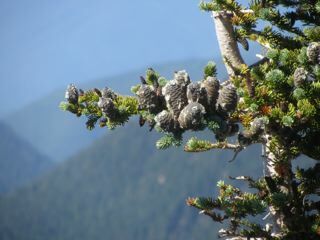 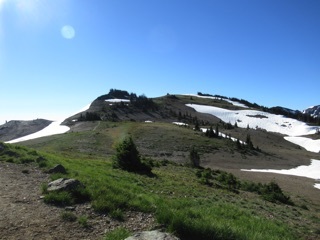 We made another visit to Obstruction Point to see how the season has been progressing. 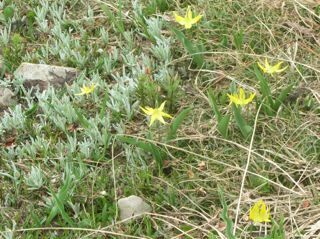 The snows have continued to melt and more flowers have come into bloom. 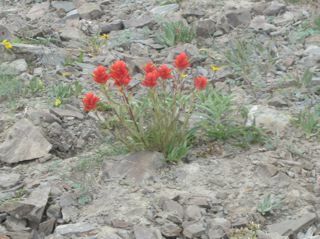 Flowers and mountains - That's why we come out here. 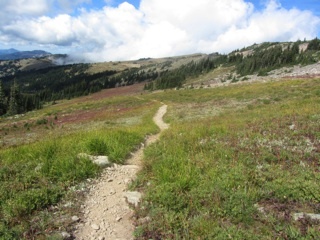 All of Obstruction Point Road is now open, so we drove out to the end and took a little stroll. The air was high and thin. 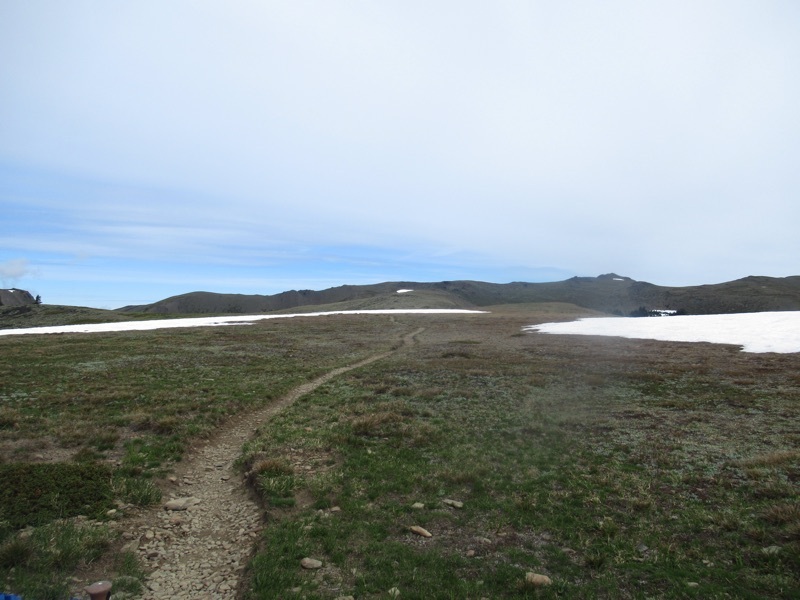 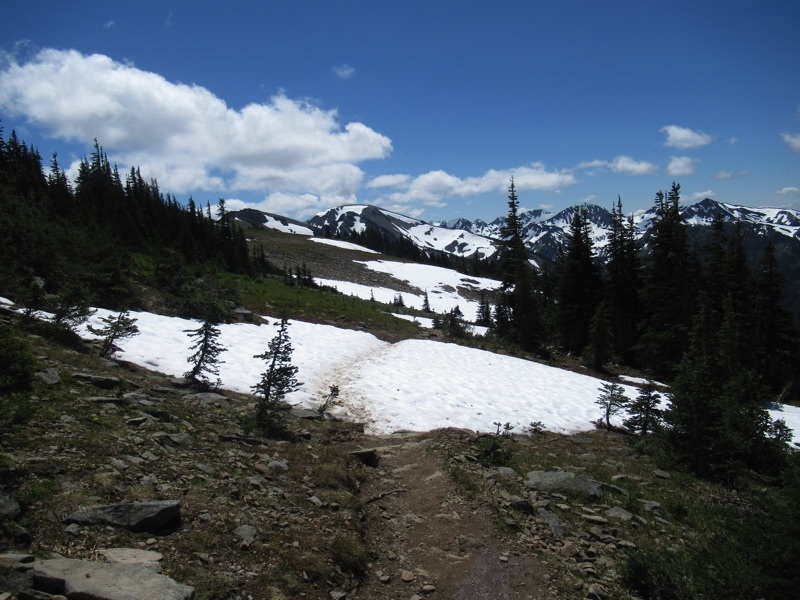 There was still a little snow to deal with on the trail, but otherwise the going was easy. 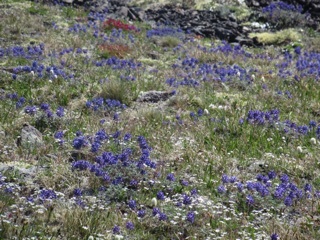 The fields and hillsides are full of flowers. 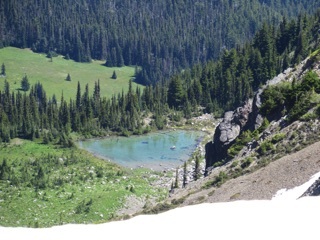 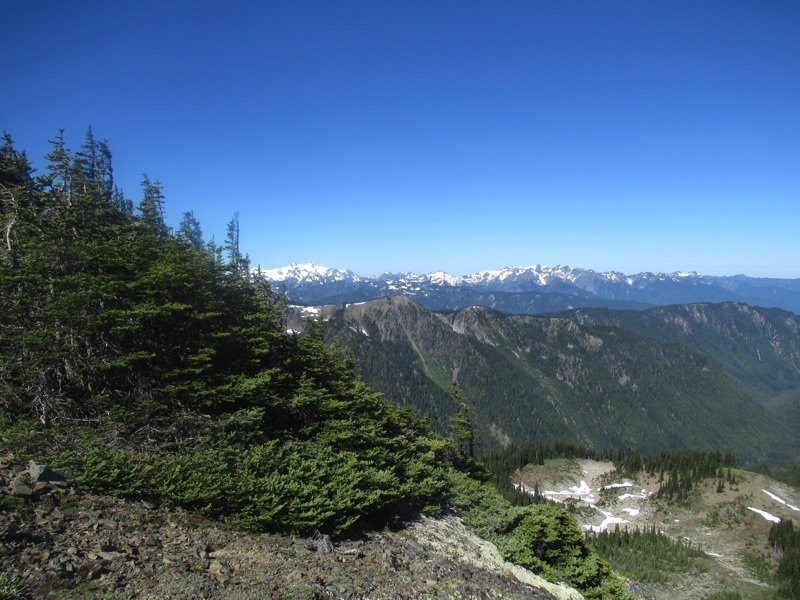 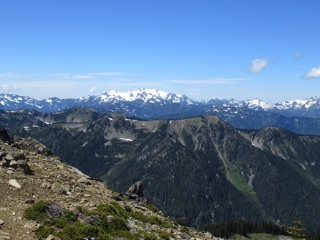 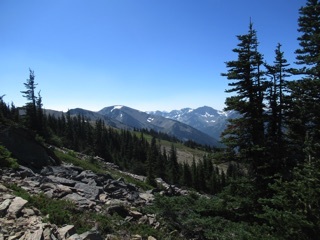 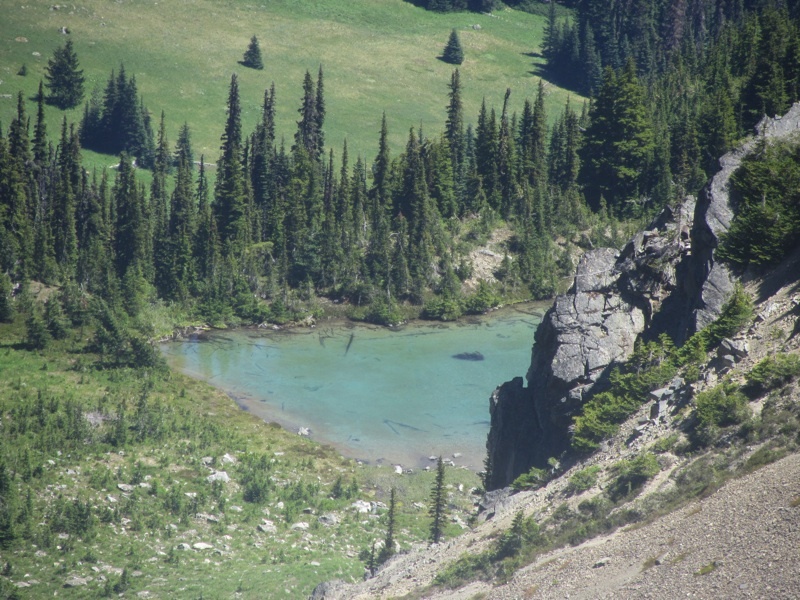 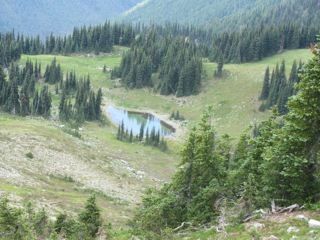 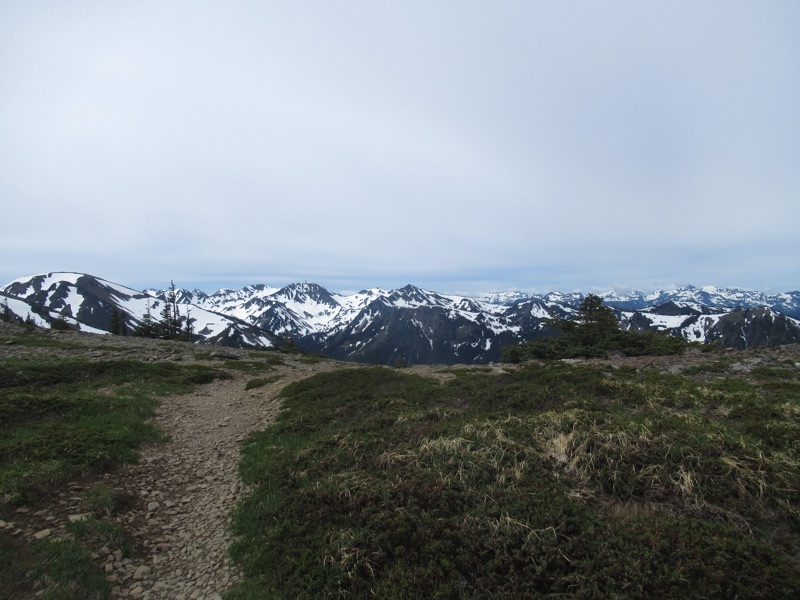 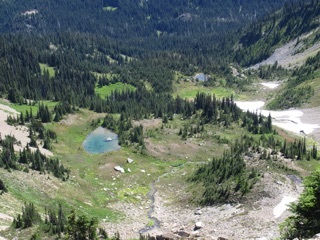 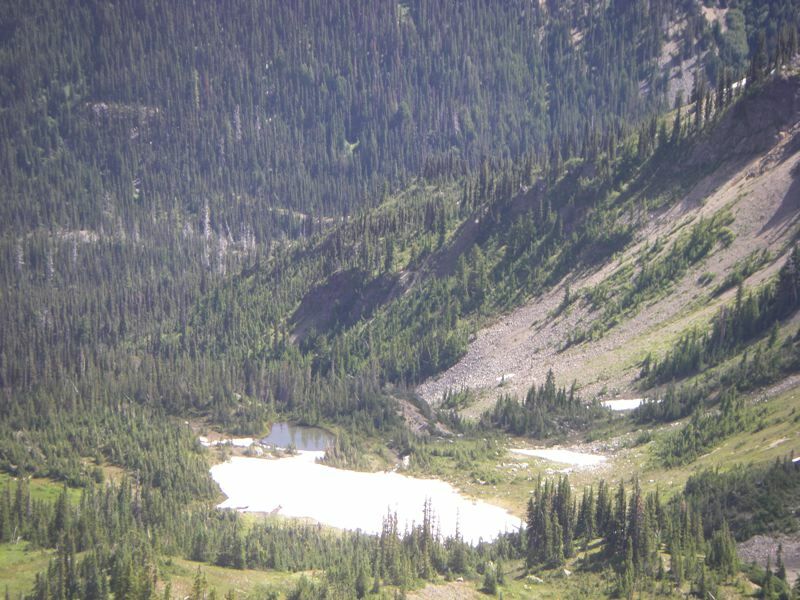 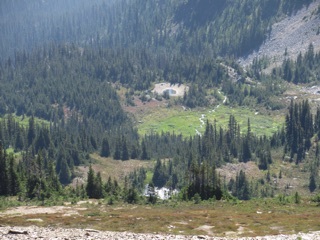 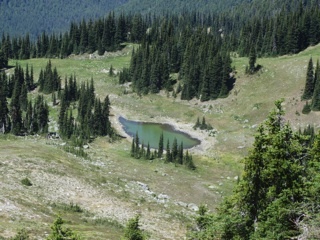 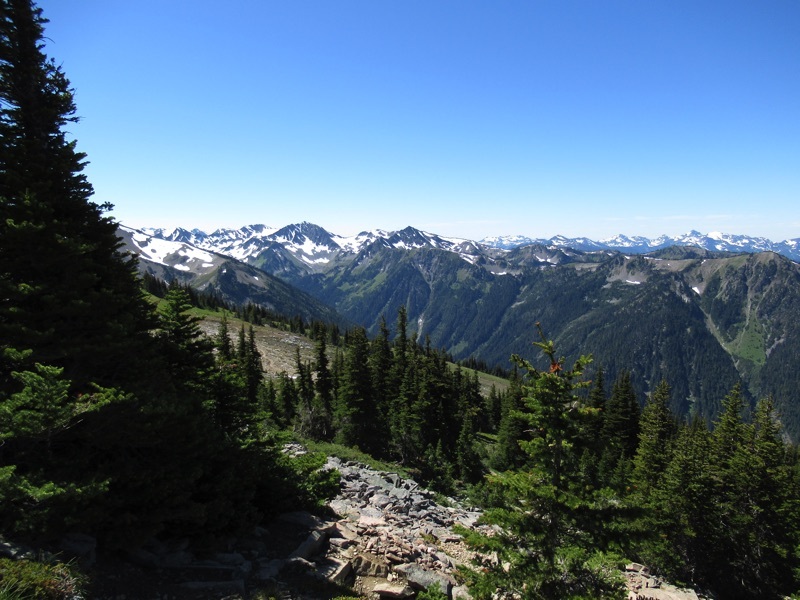 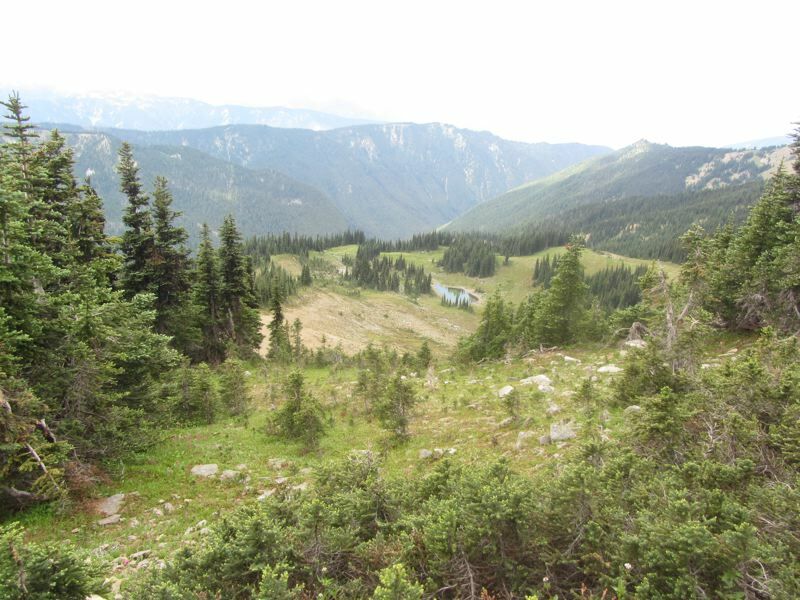 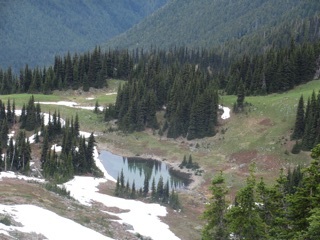 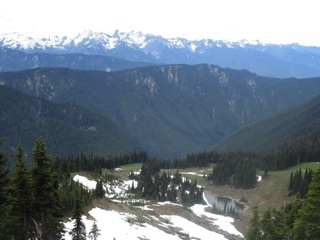 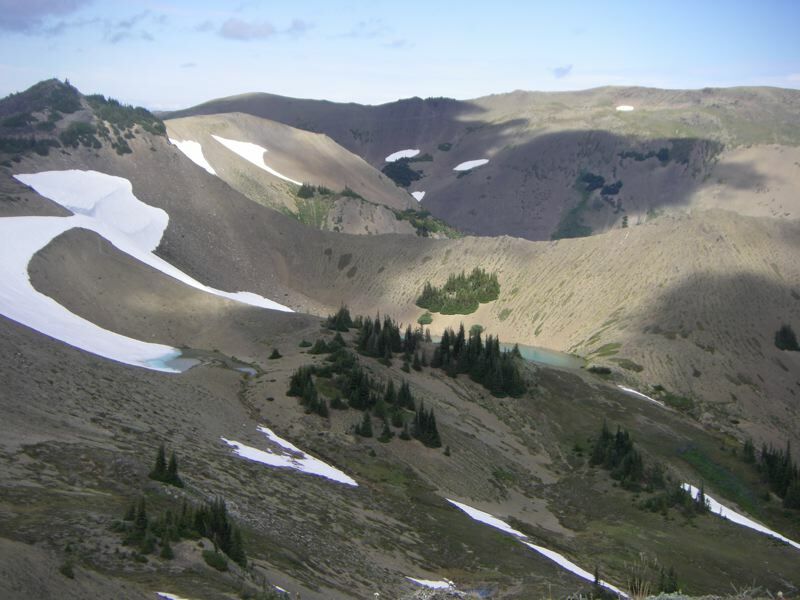 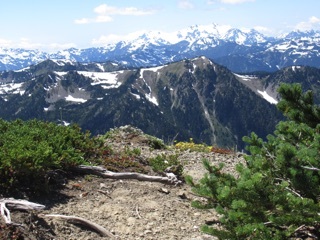 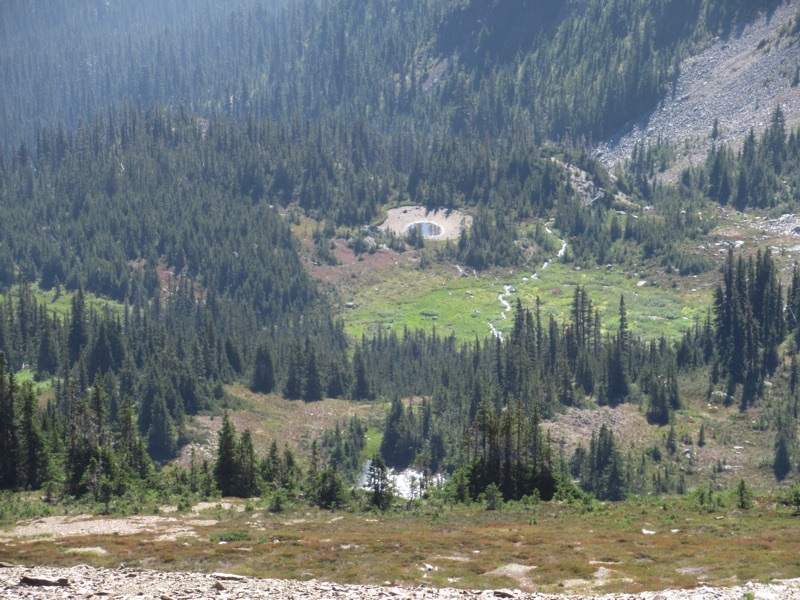 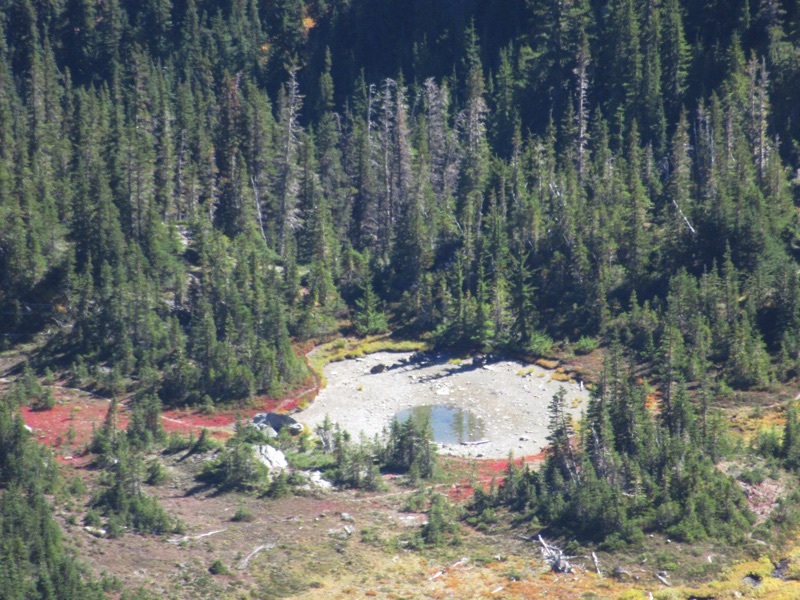 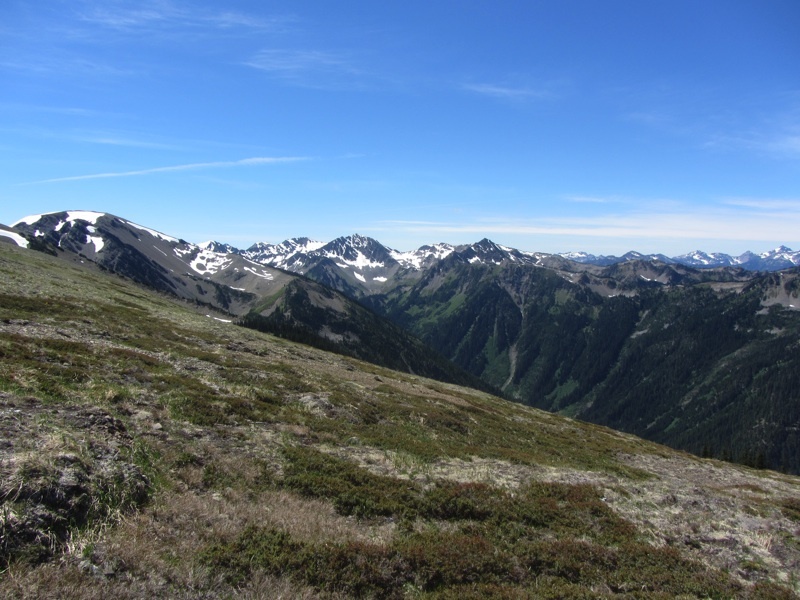 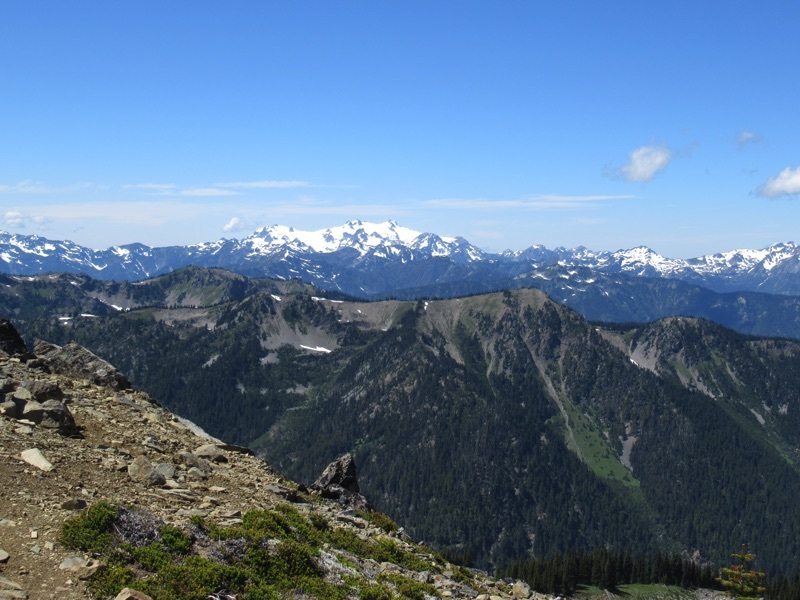 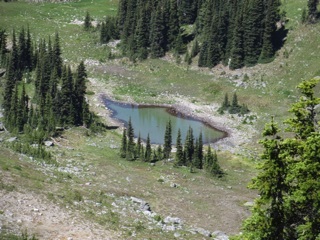 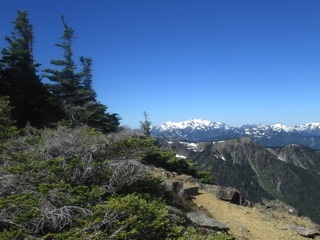 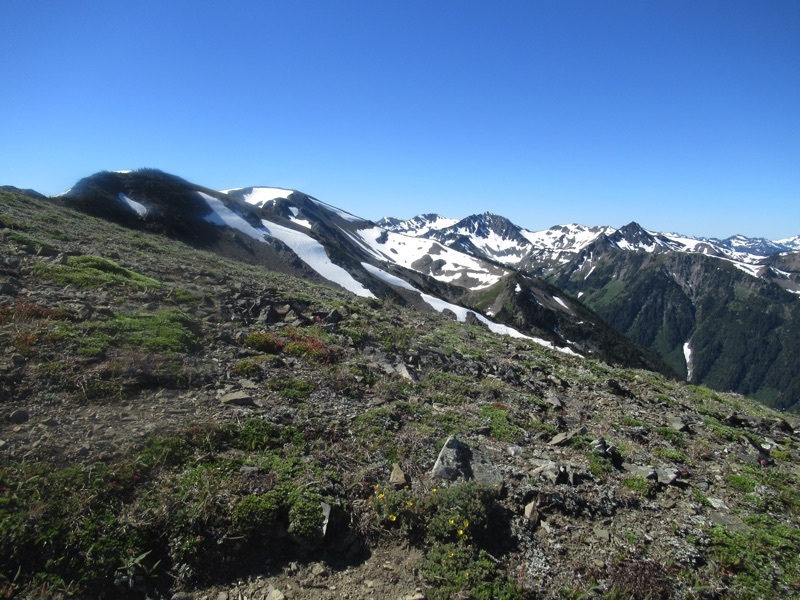 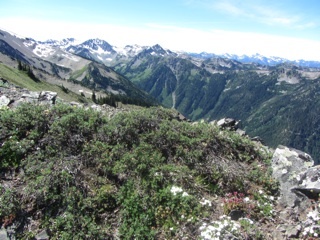 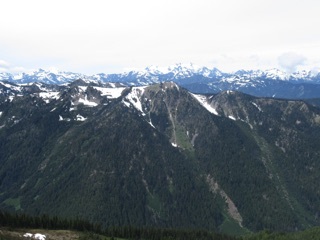 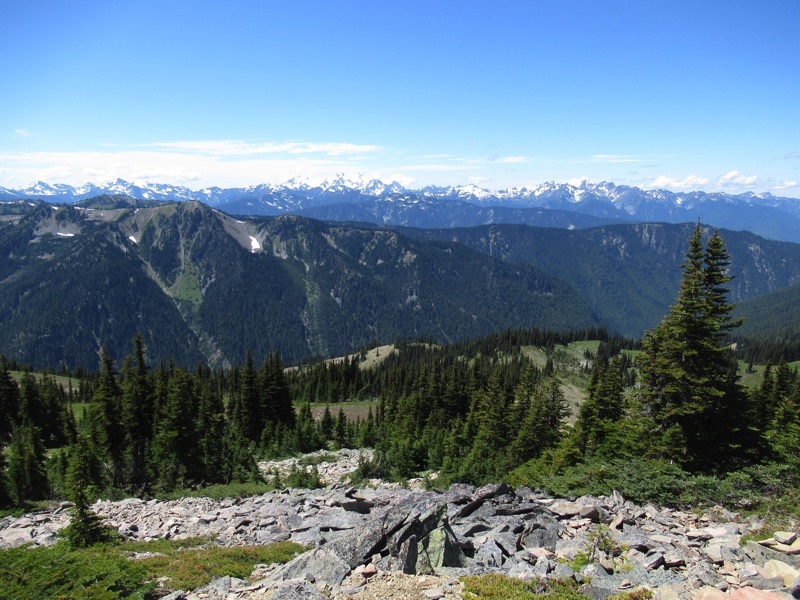 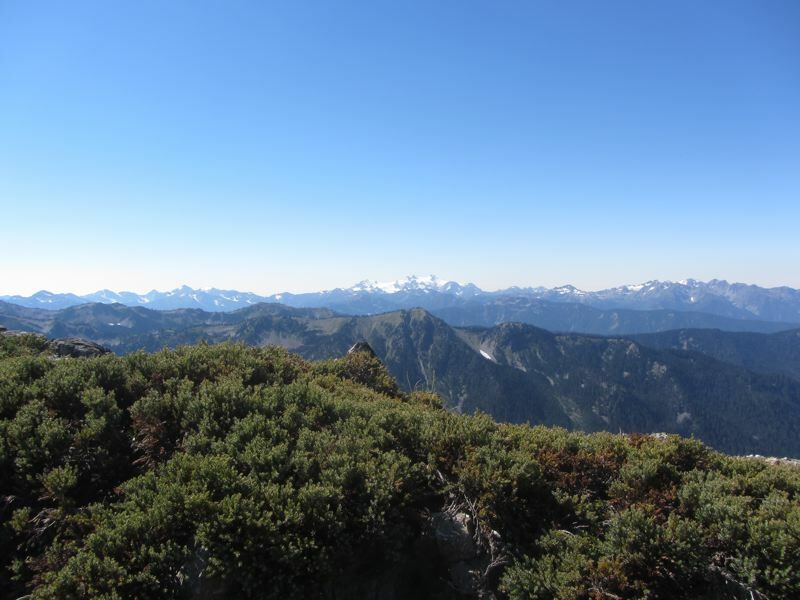 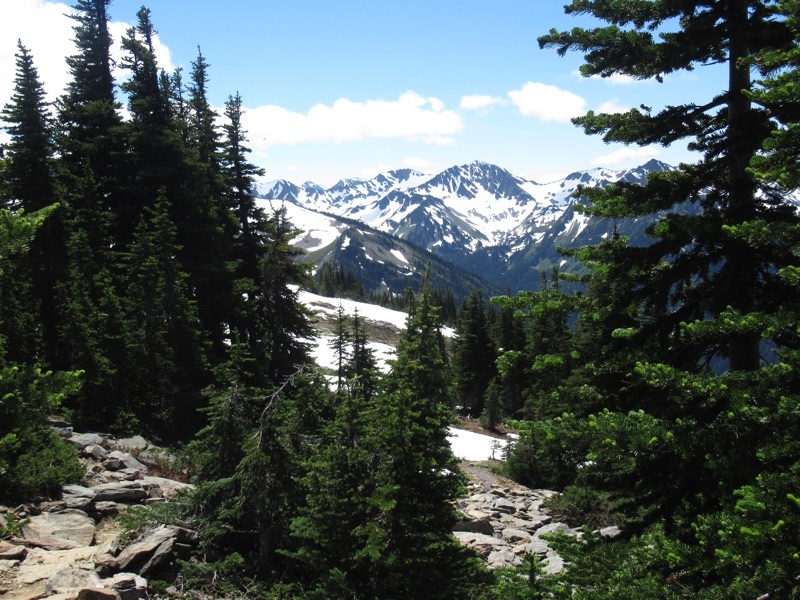 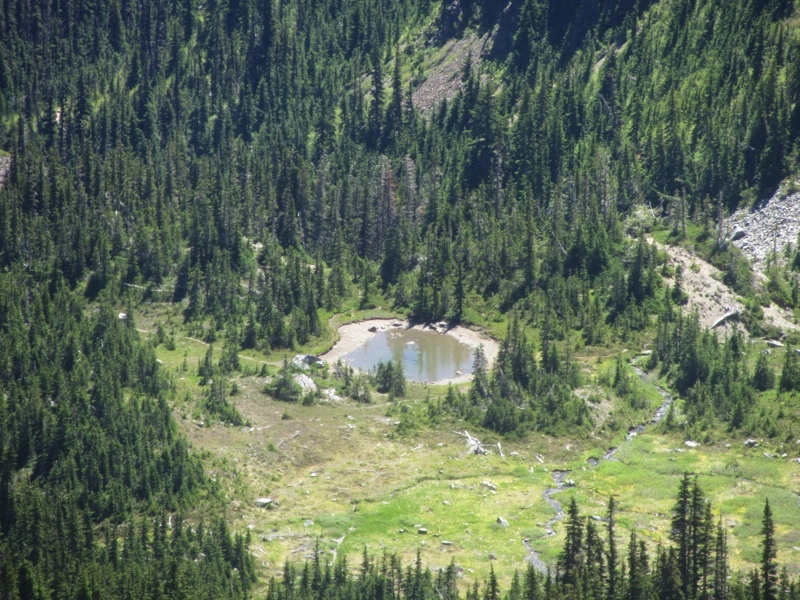 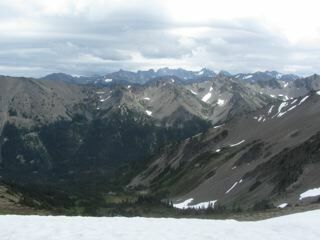 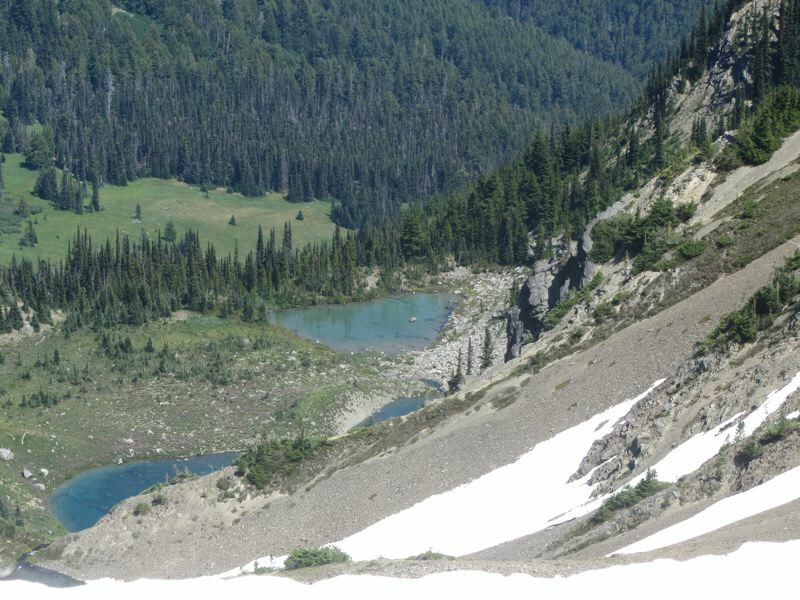 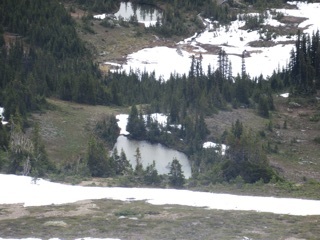 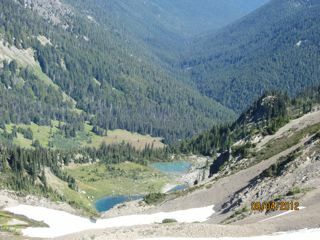 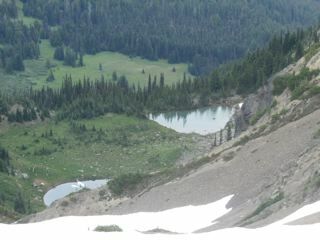 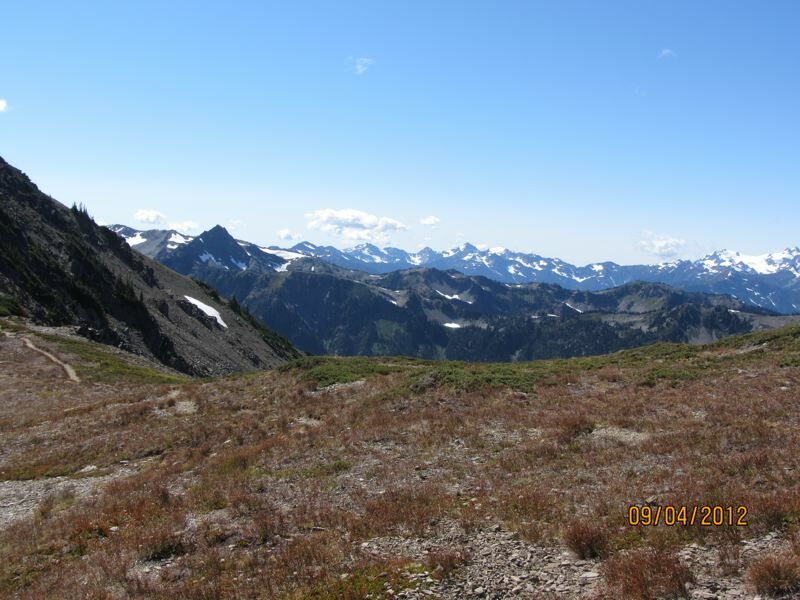 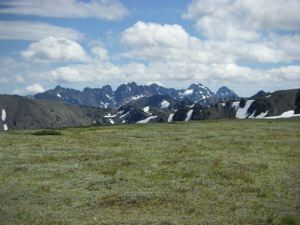 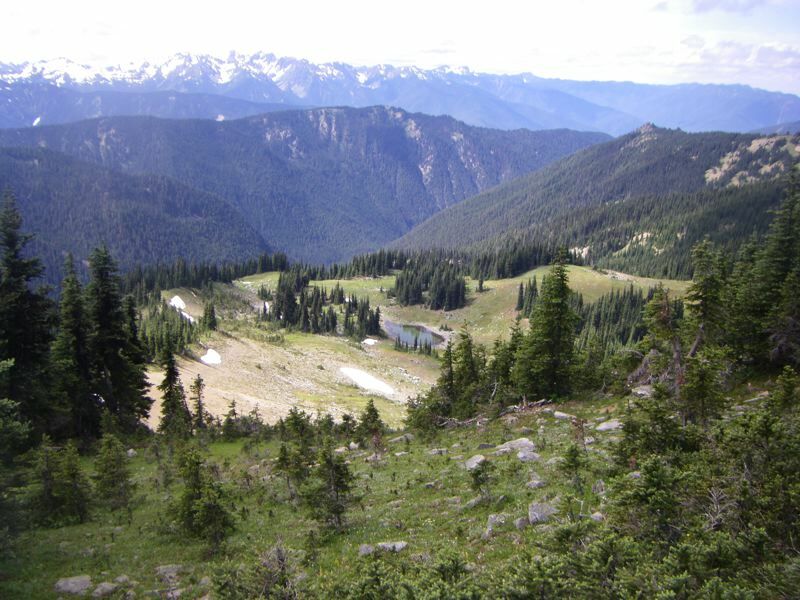 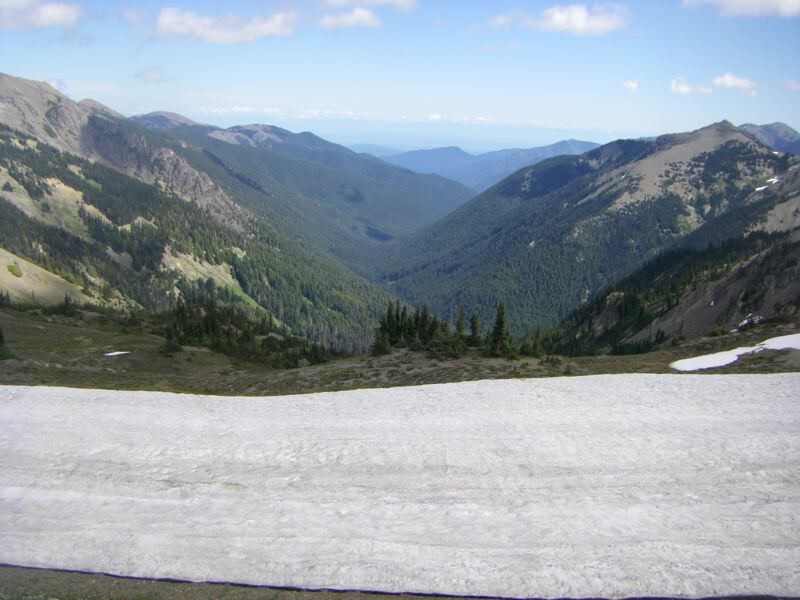 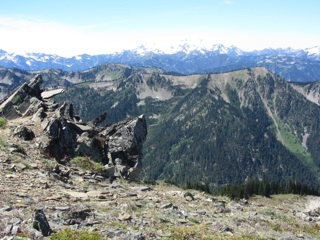 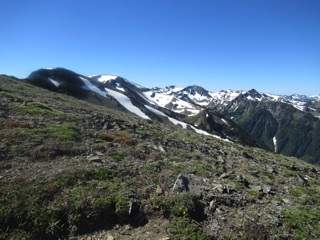 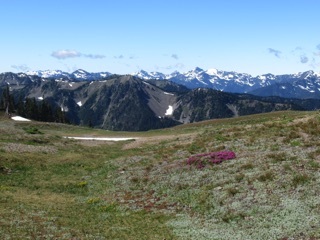 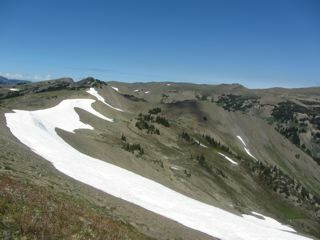 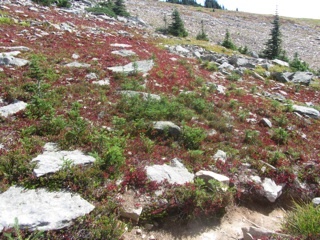 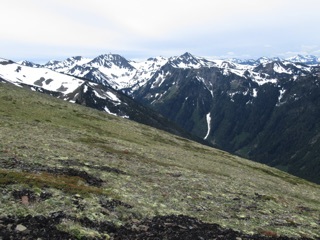 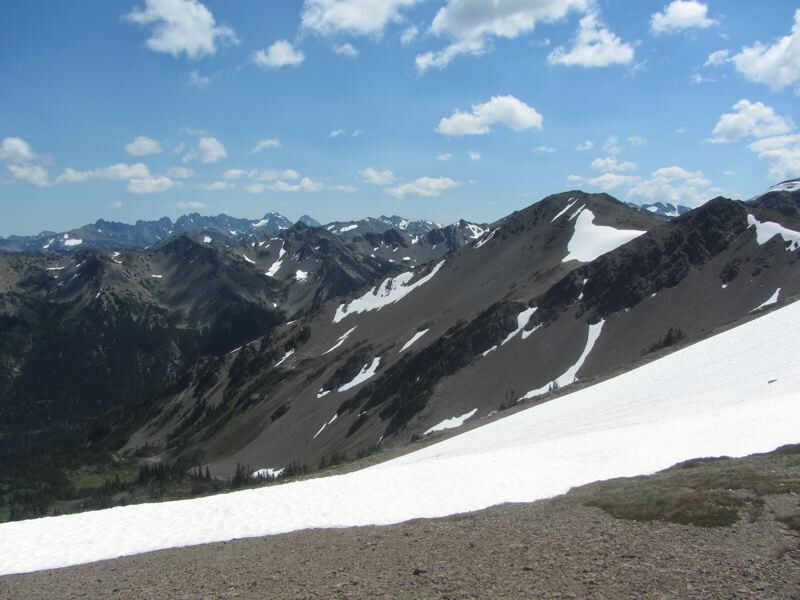 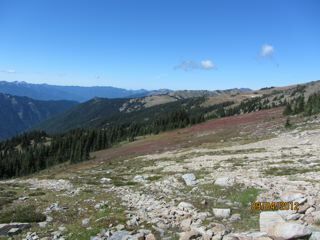 The distant mountains are covered with snow, but it is melting and the seasonal alpine lakes are forming. 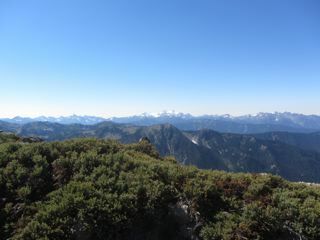 It was a magnificent hike, one we hope to repeat soon. 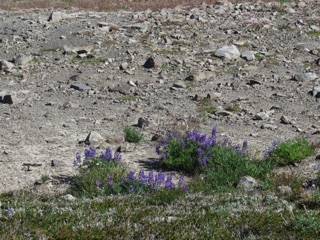 There were lots of lupines this year. Hurricane Hill was windy and cold, and the first snow has fallen. 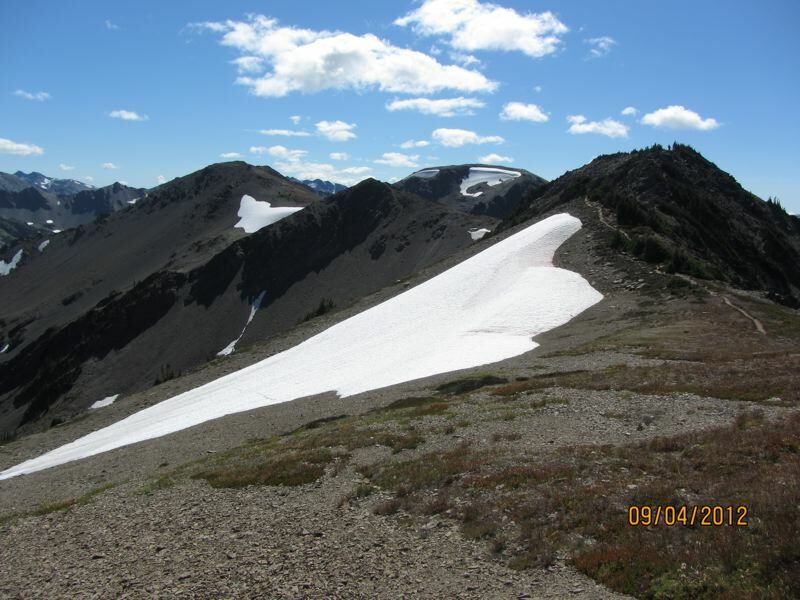 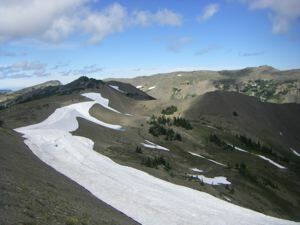 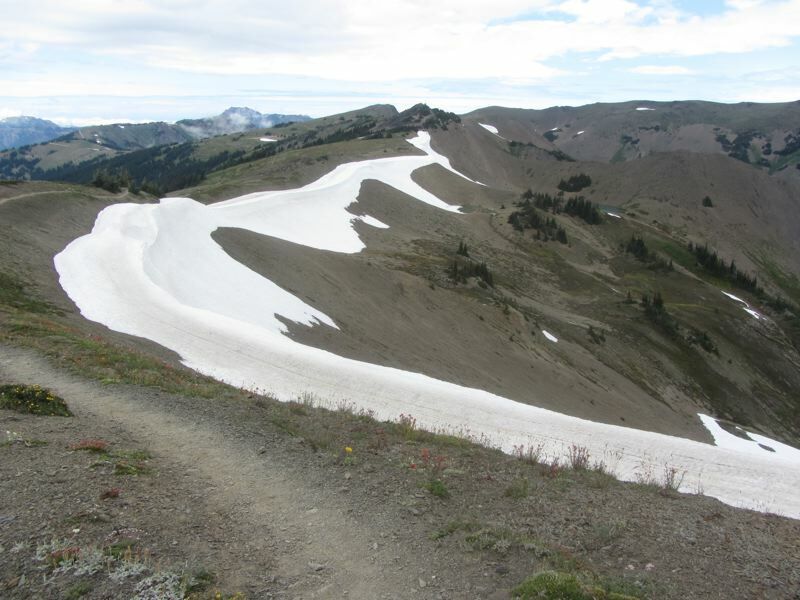 Obstruction Point Road is already closed, and it looks like we are having an early winter. 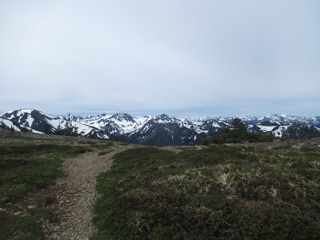 The Hurricane Hill Trail started below the snow line, but we could see a lot more snow on the Olympic Mountains and snow on Mount Angeles early on. 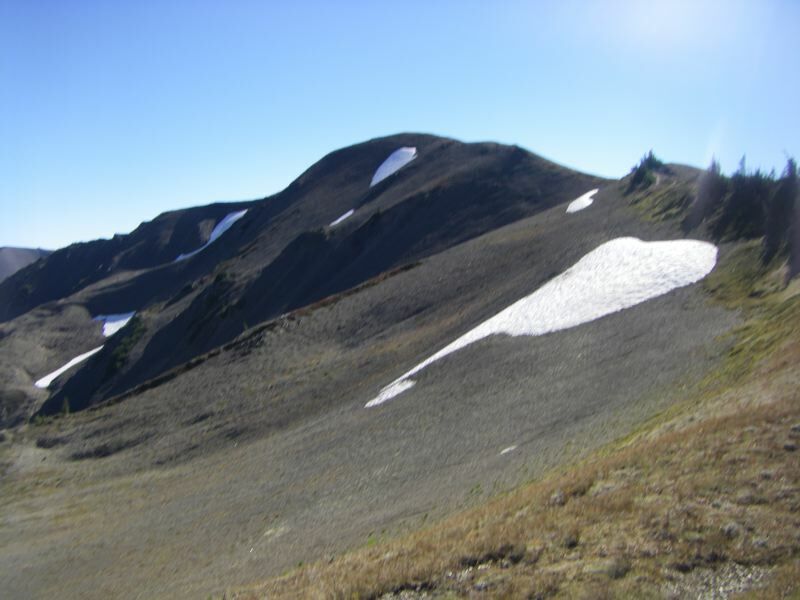 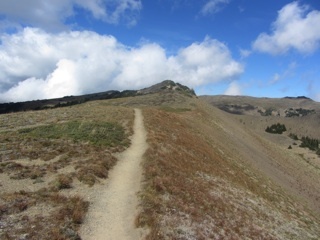 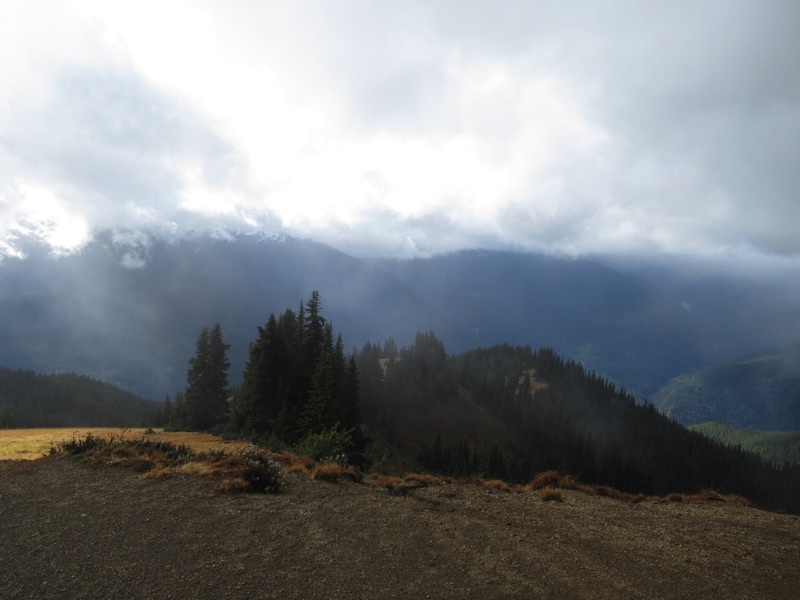 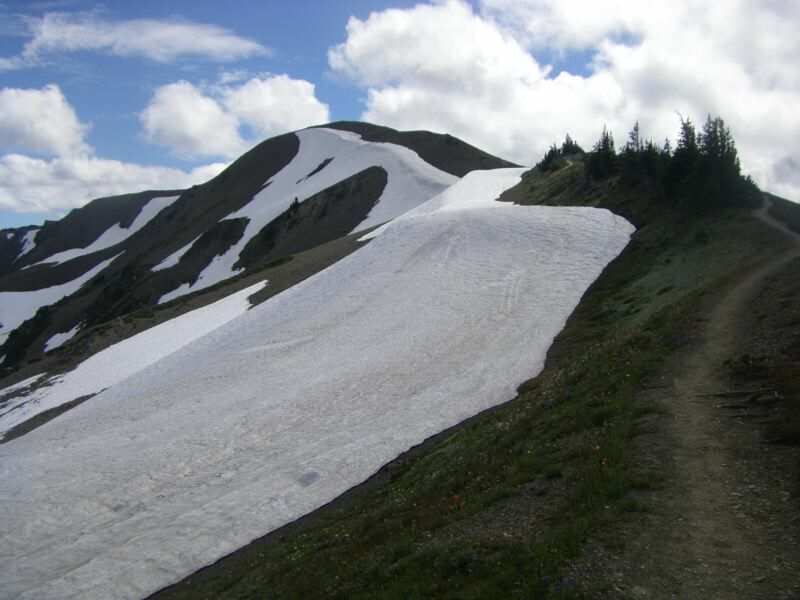 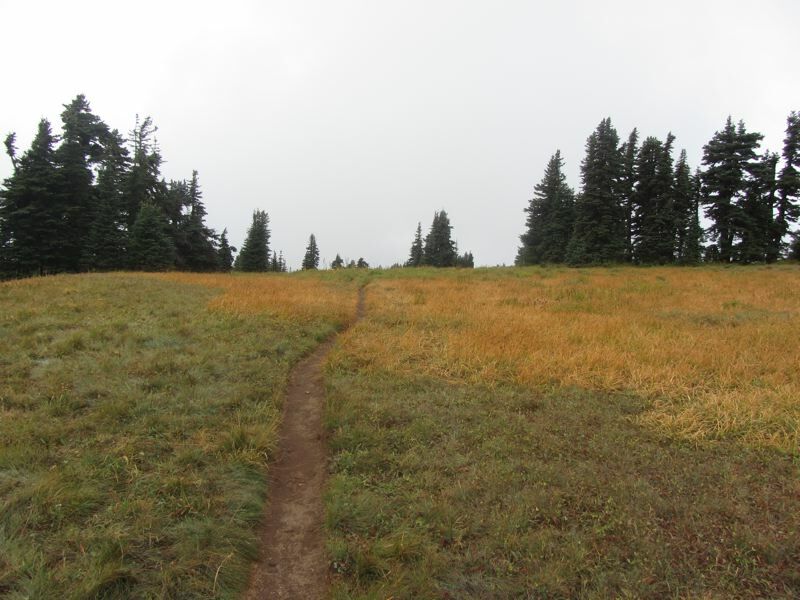 As we neared the summit, we saw the first snow by the trail. There wasn’t all that much snow, but this part of the mountain faces south. 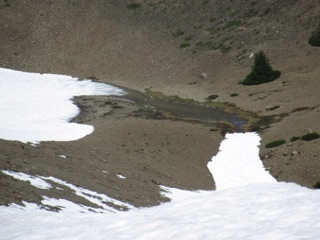 We could see a lot more snow on the north face, and the little seasonal lake has reformed after having dried out this summer. 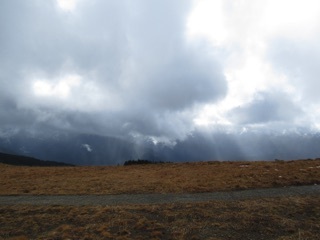 The wintry air and clouds played tricks with the light. 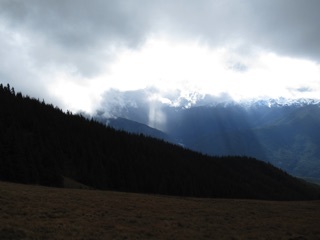 There were bands of crepuscular light as the sun shone through gaps in the clouds. 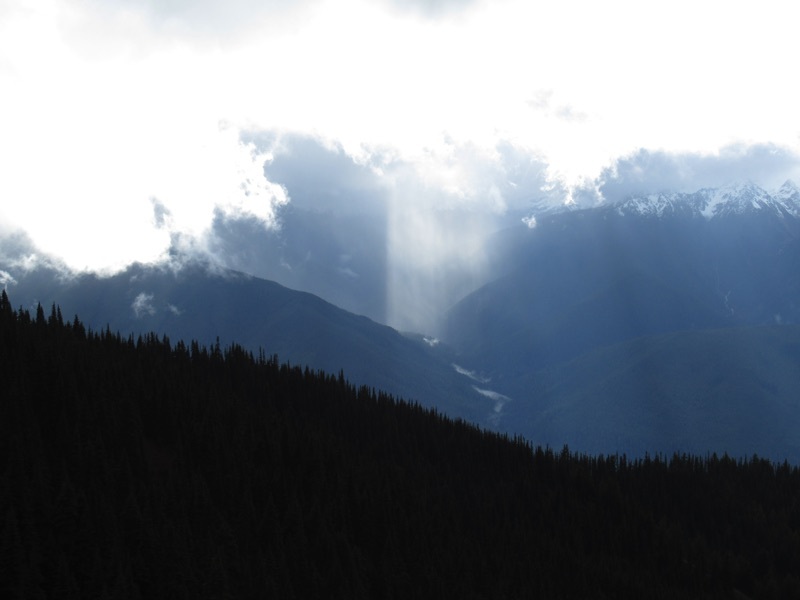 There was even a bit of a light column glowing brightly with the sunlight reflected and concentrated by ice crystals. 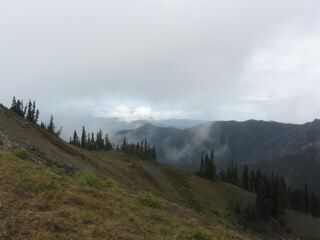 There wasn’t much of a view as we made our ascent, but at the summit the clouds blew past, so we had great views on our walk down. 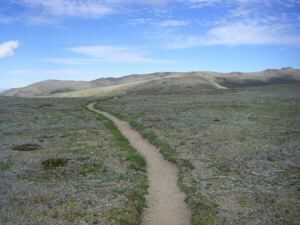 We often tell people to take the trail even when visibility is limited as things are likely to change. We were well rewarded for taking our own advice, but by the time we returned to our car, the clouds had started to close in again. 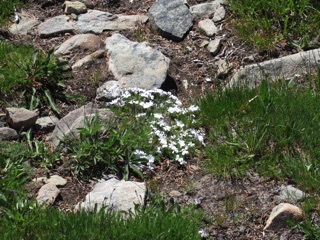 Snow on the trail - Doesn’t that look like winter? Winter is coming to the high country. 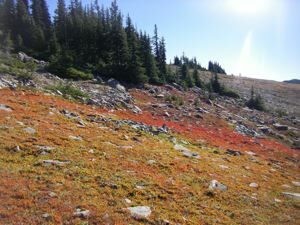 The greens are turning into browns and reds and golds. 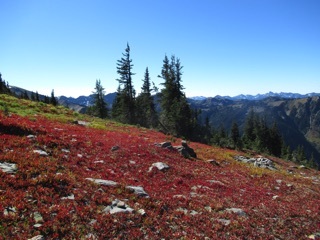 At Obstruction Point the colors are brilliant, and the fields of bright red foliage remind us of the plains of Mars. 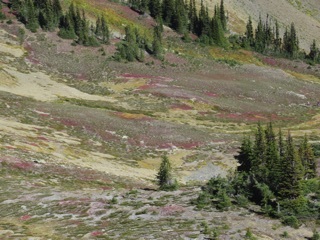 Of course, thanks to NASA we now know that Mars looks nothing at all like Lilian Ridge, but the colors still evoke the fantastic Mars of Edgar Rice Burroughs. The high country is always a bit otherworldly, but it is at its most spectacular and alien when the colors start to change. We waited for a sunny day before heading out to Obstruction Point. 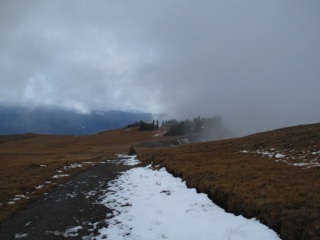 We really did not want to be caught on the road out in the fog. 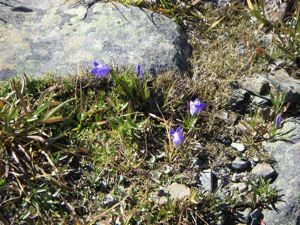 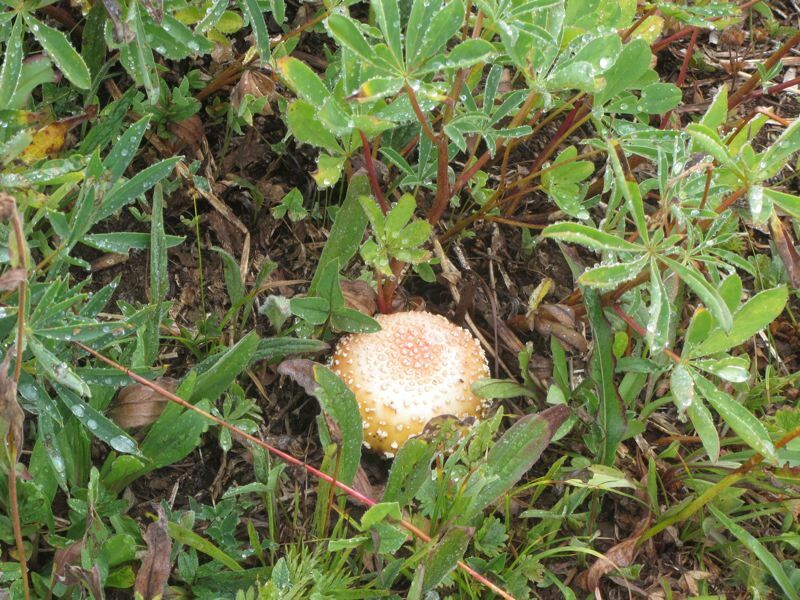 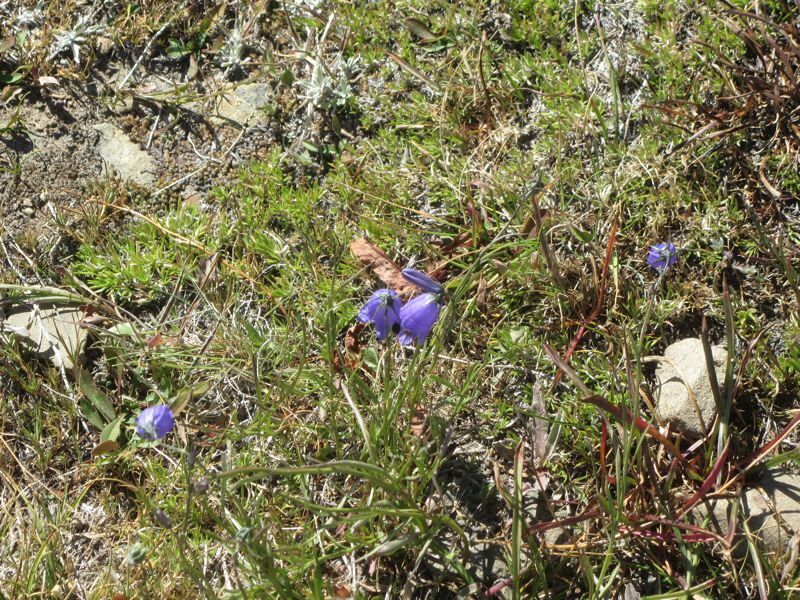 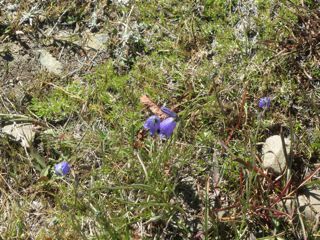 We were well rewarded with spectacular high country views, alpine flowers and the return of the alpine lakes, even now filling with melting snow. It is always an otherworldly experience, a journey to the top of the world and another clime. 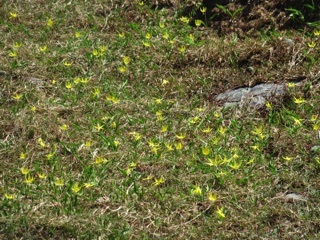 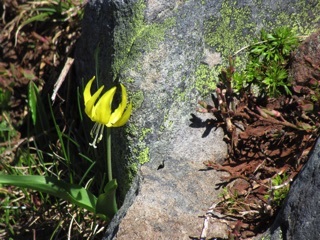 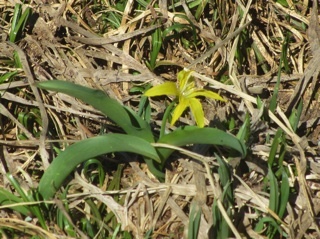 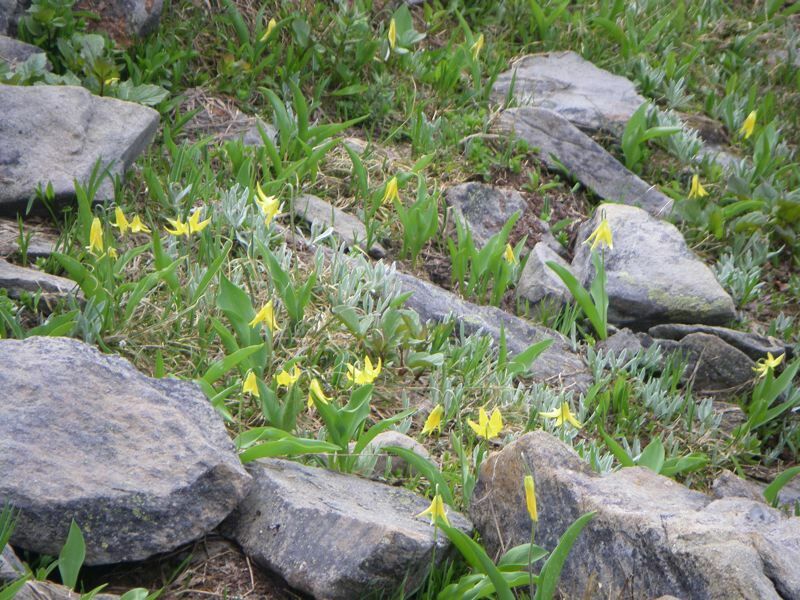 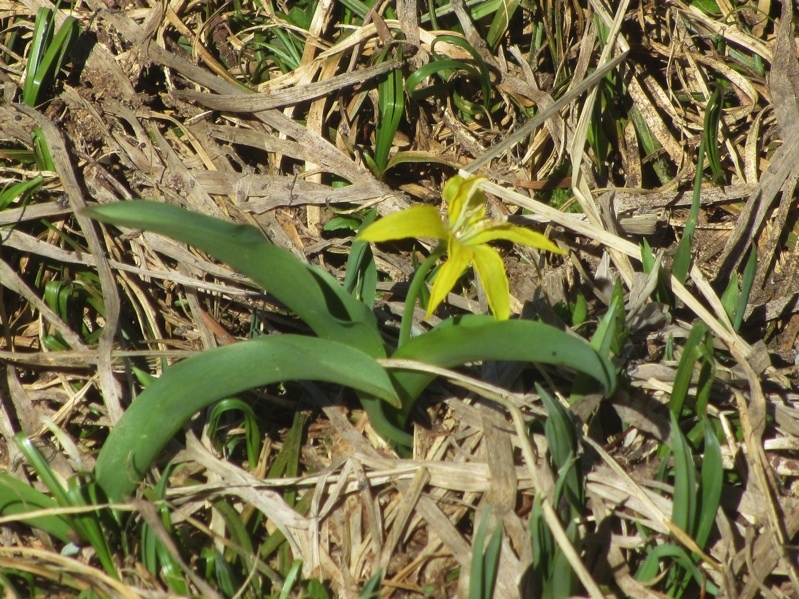 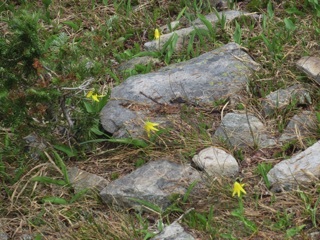 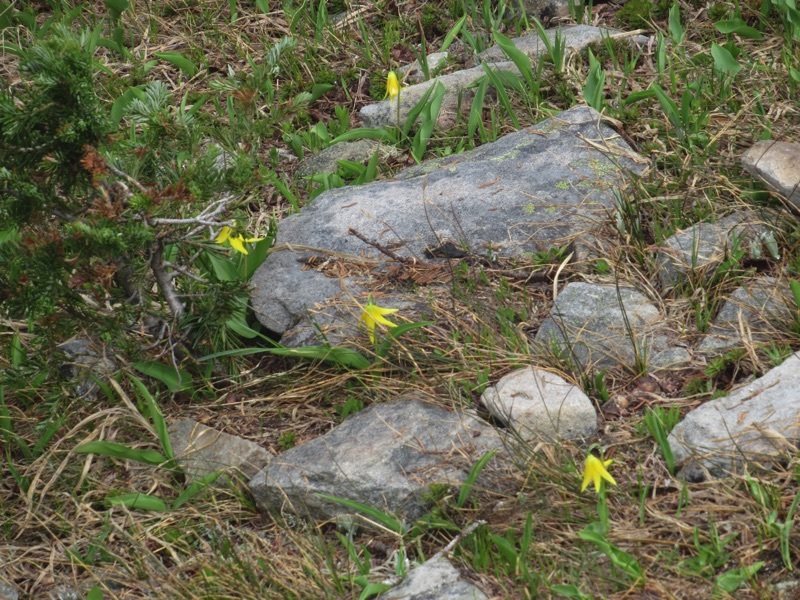 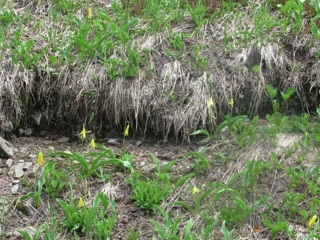 Glacier lily - It’s still early spring out there. 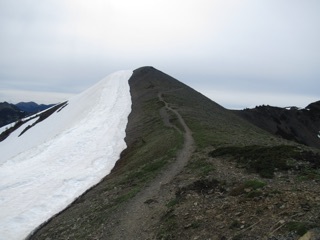 Obstruction Point Road has been open to the end for some weeks now. We've been recovering from our colds, so we weren't too keen on a big dose of dry, thin air. 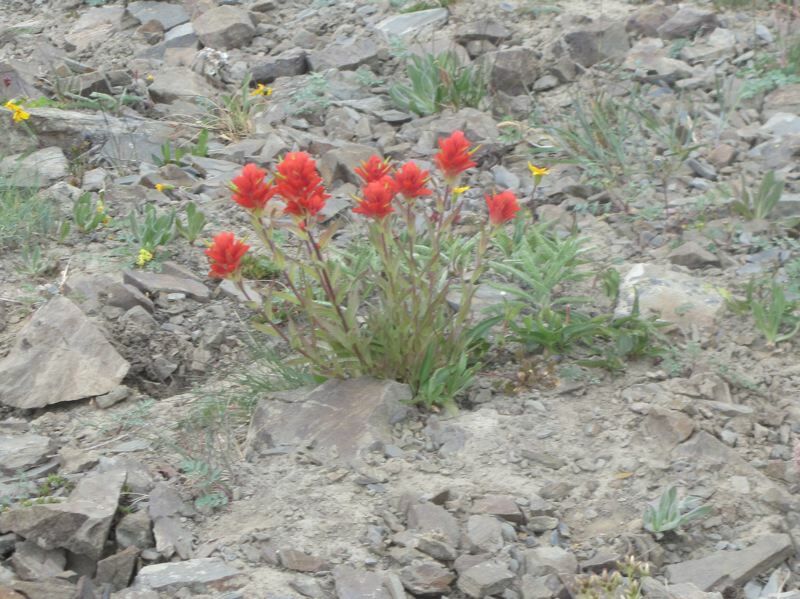 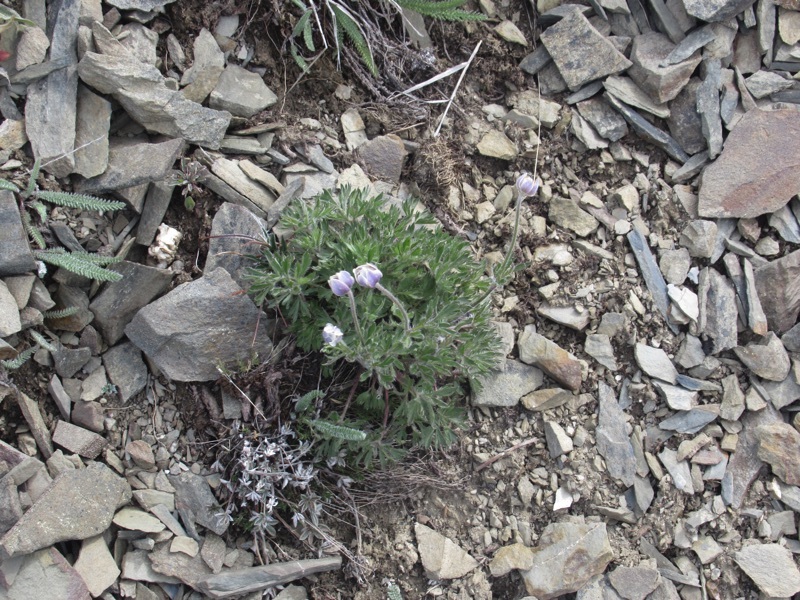 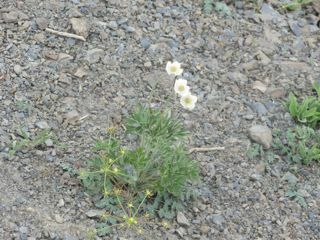 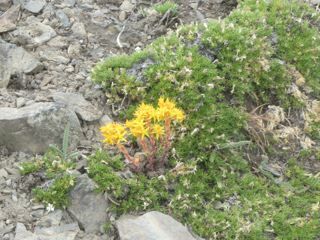 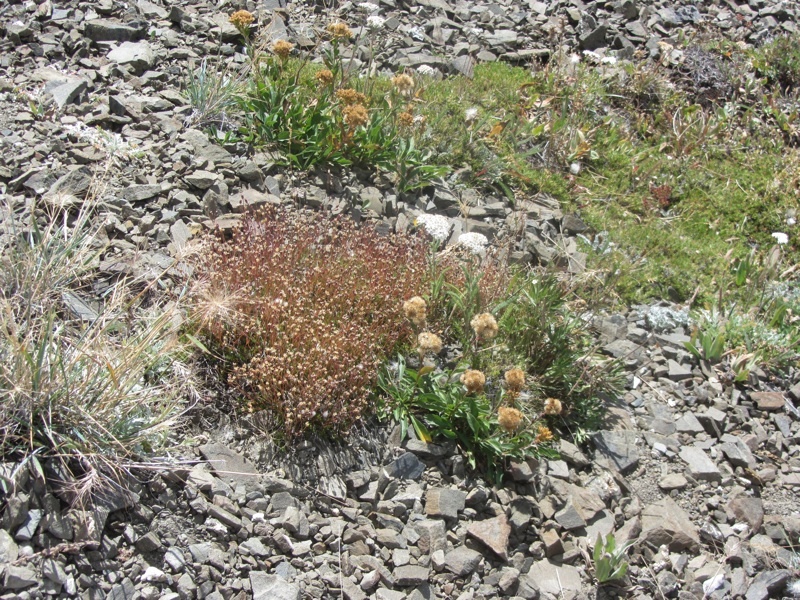 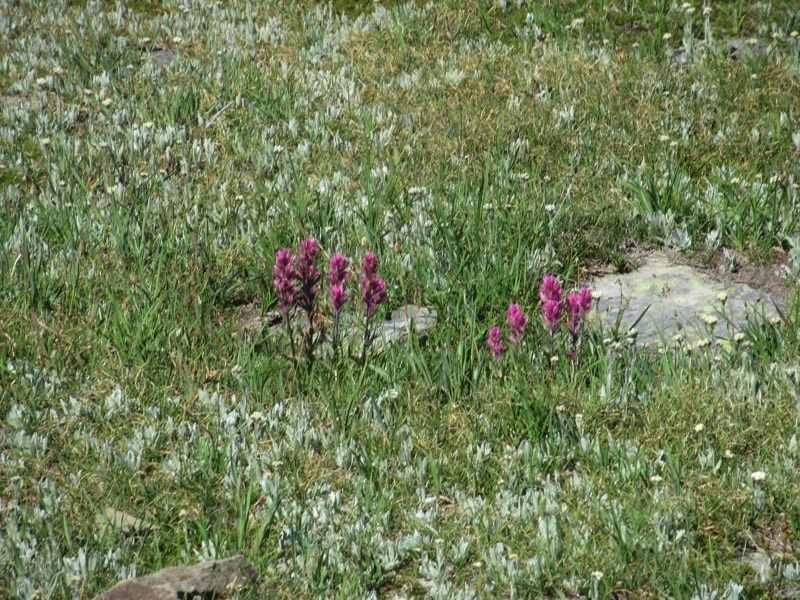 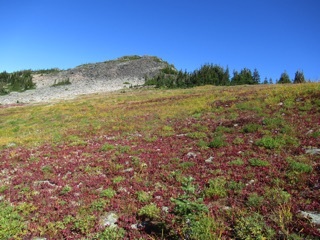 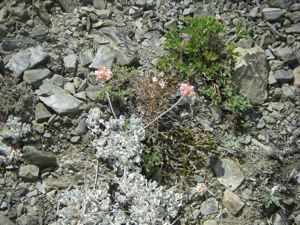 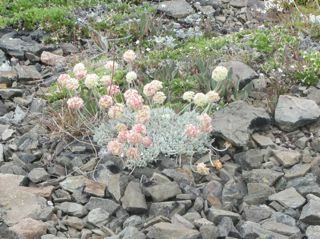 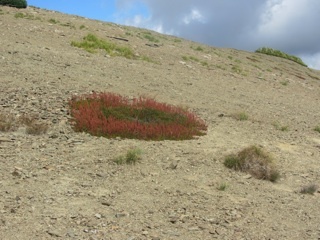 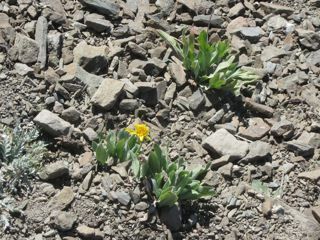 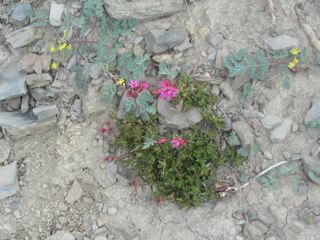 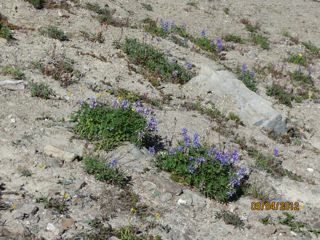 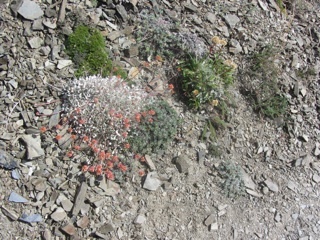 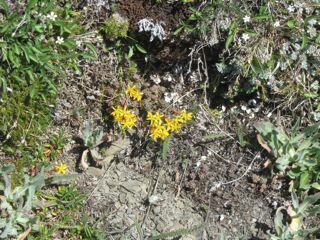 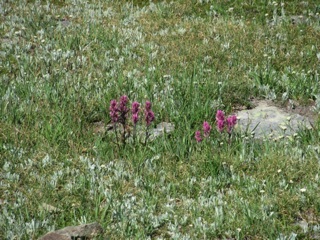 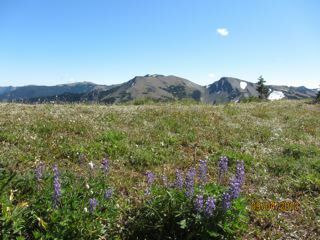 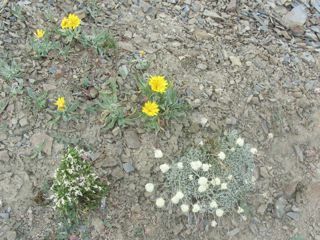 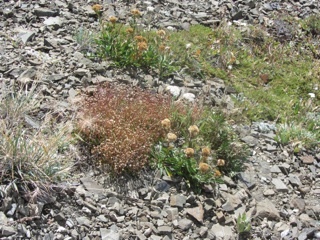 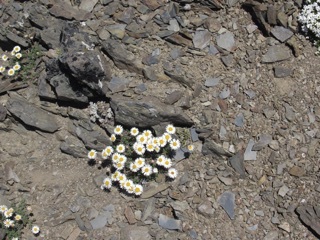 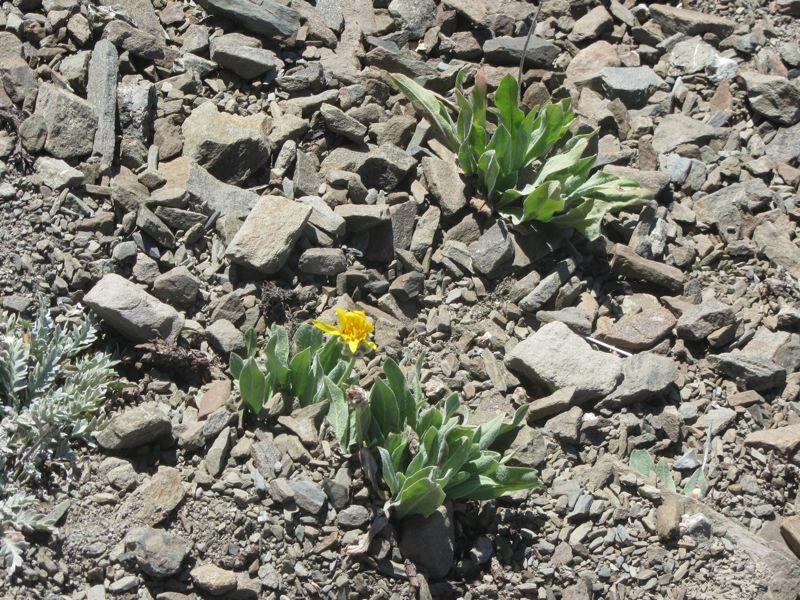 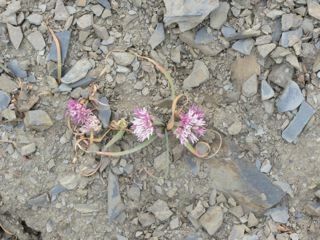 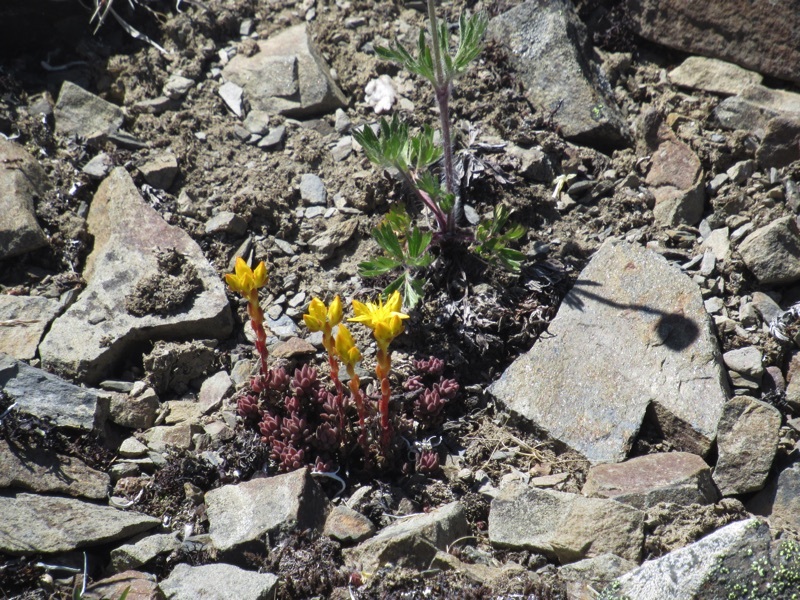 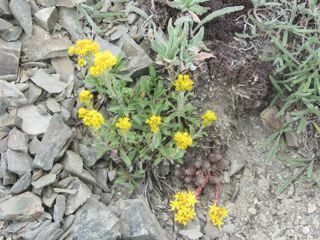 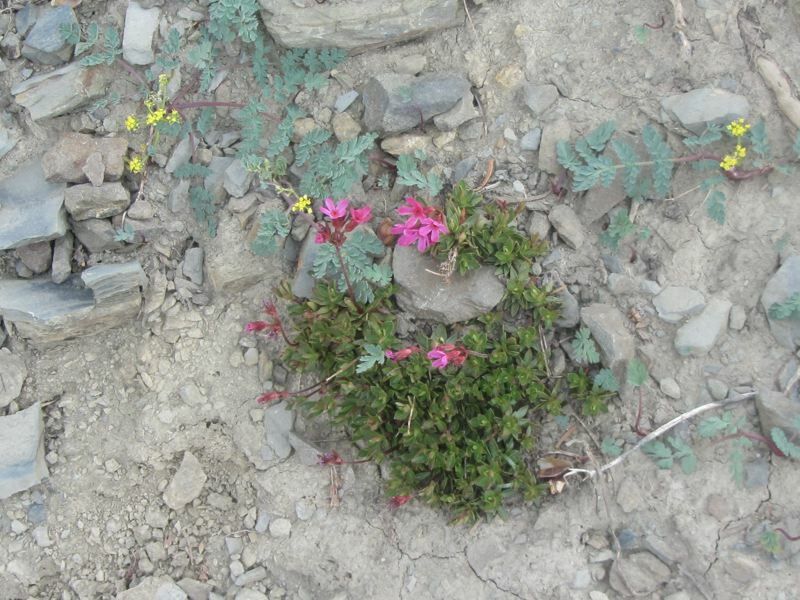 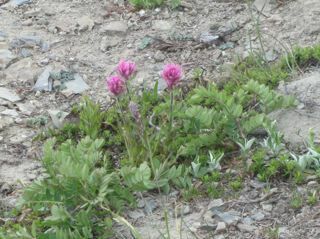 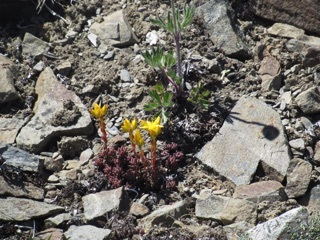 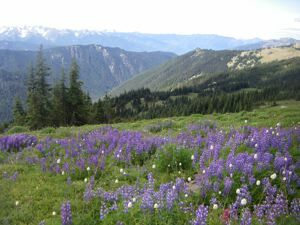 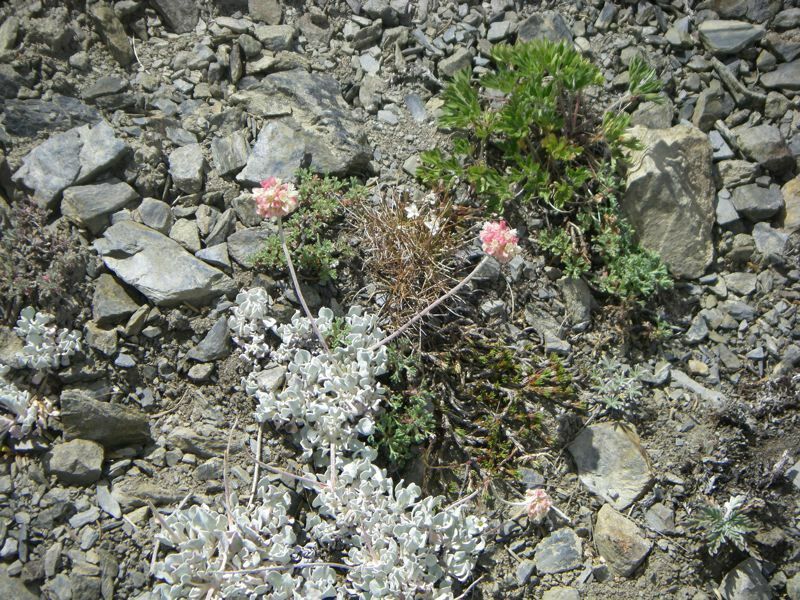 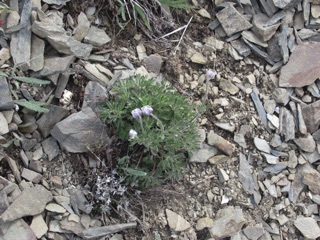 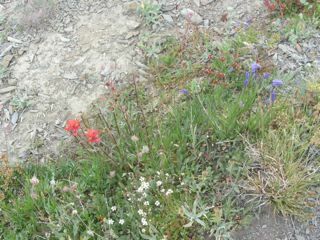 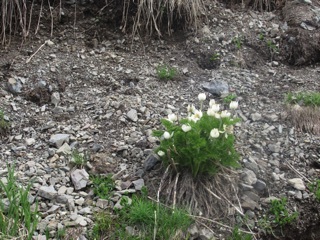 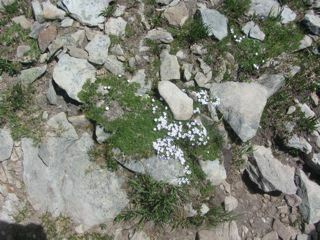 Then we hiked up Hurricane Hill and realized that this year's flowers are well along. 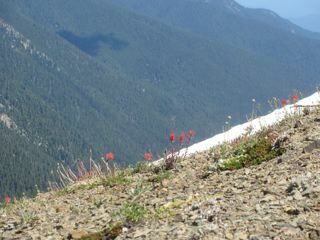 If we hoped to see the blossoms at Obstruction Point, we would be ill served by delay. 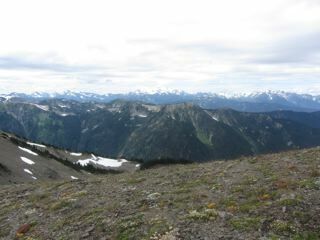 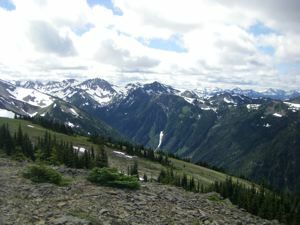 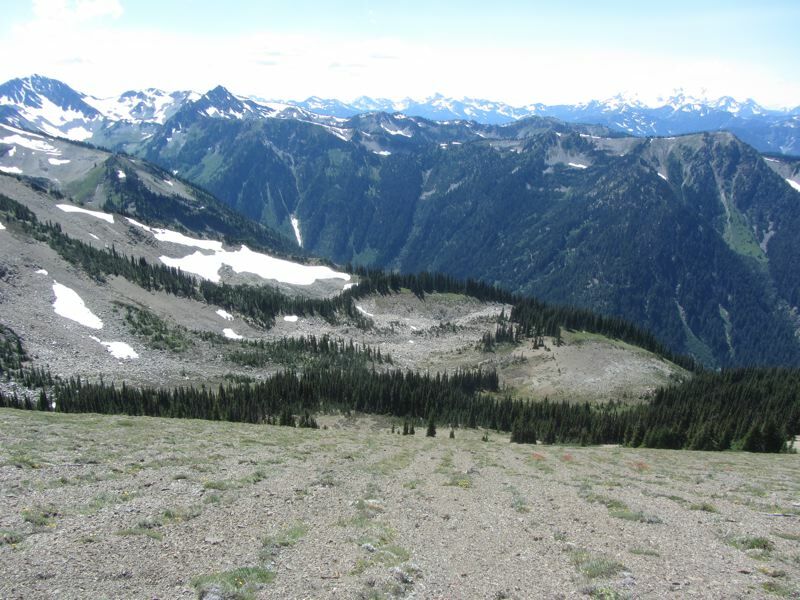 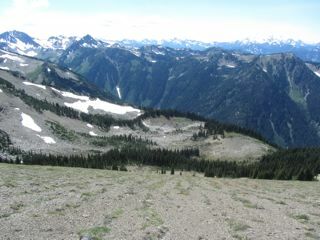 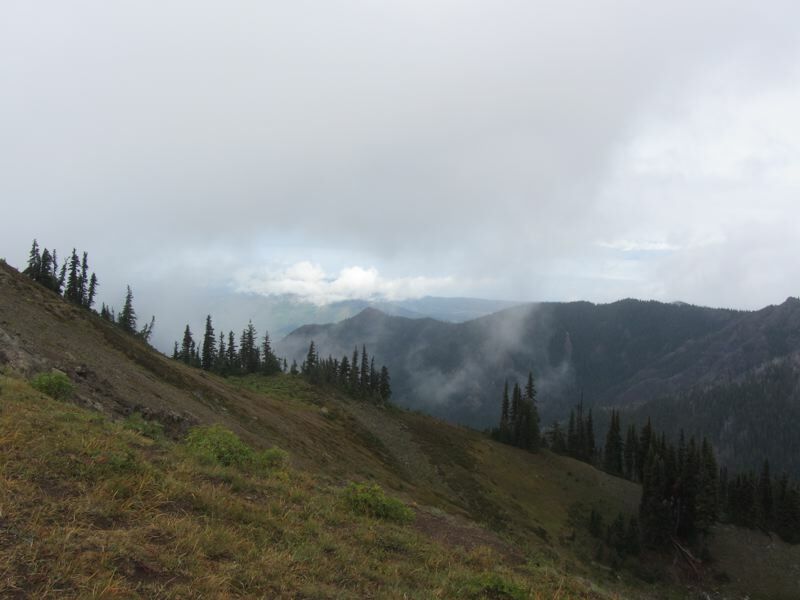 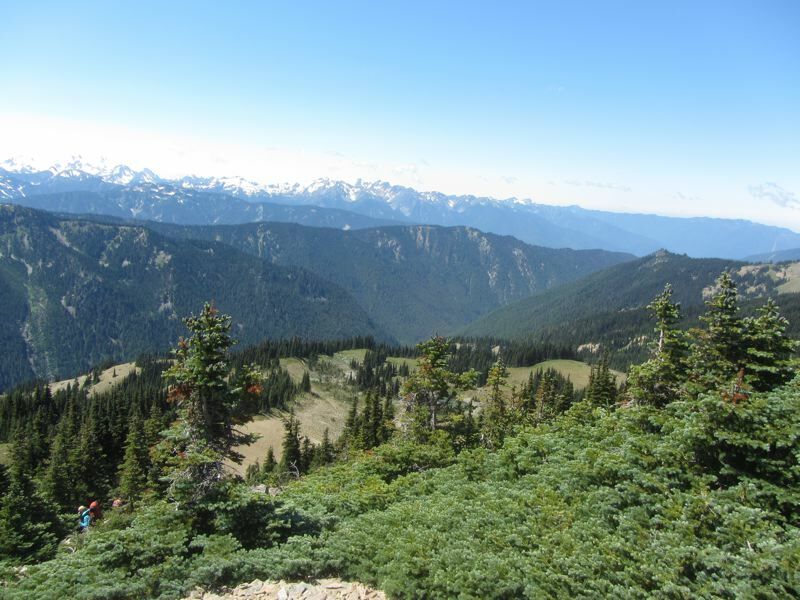 So, we drove out from the Hurricane Ridge parking lot and were soon on the top of the world. 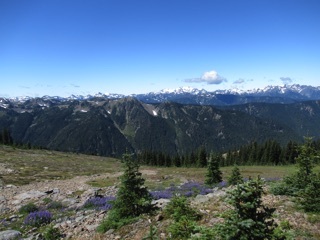 The Olympic Range was gloriously visible across the valley, there were still a few patches of snow, and there were flowers in bloom. 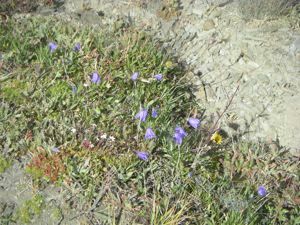 The air was dry and thin, but it was great to see the seasonal lakes, some already vanishing, and enjoy the tapestry of alpine plants and flowers. 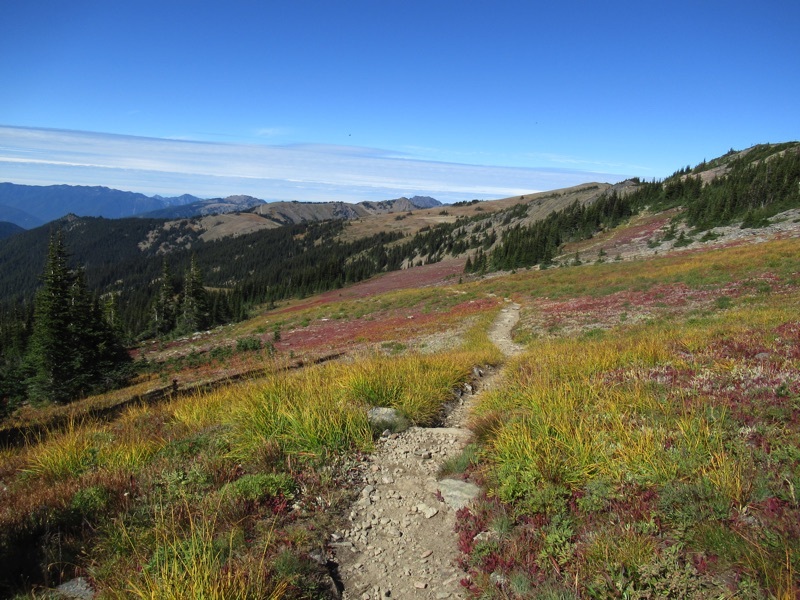 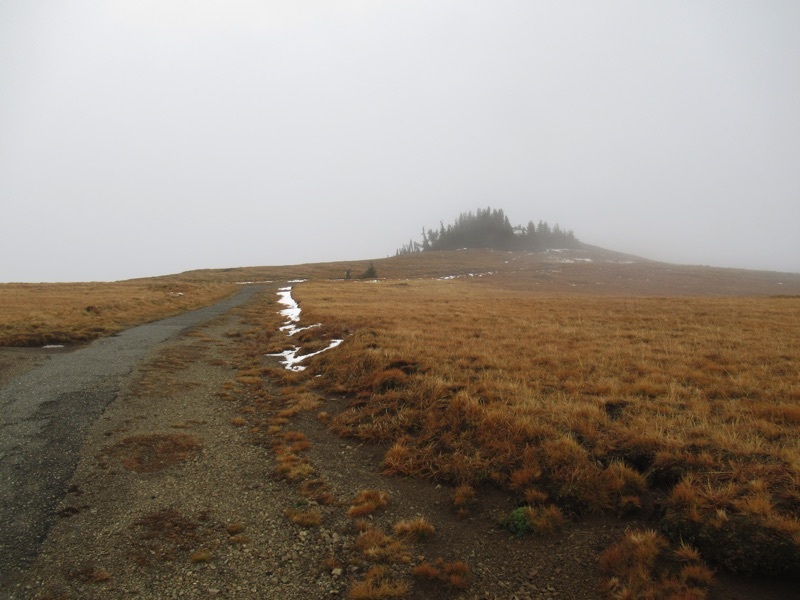 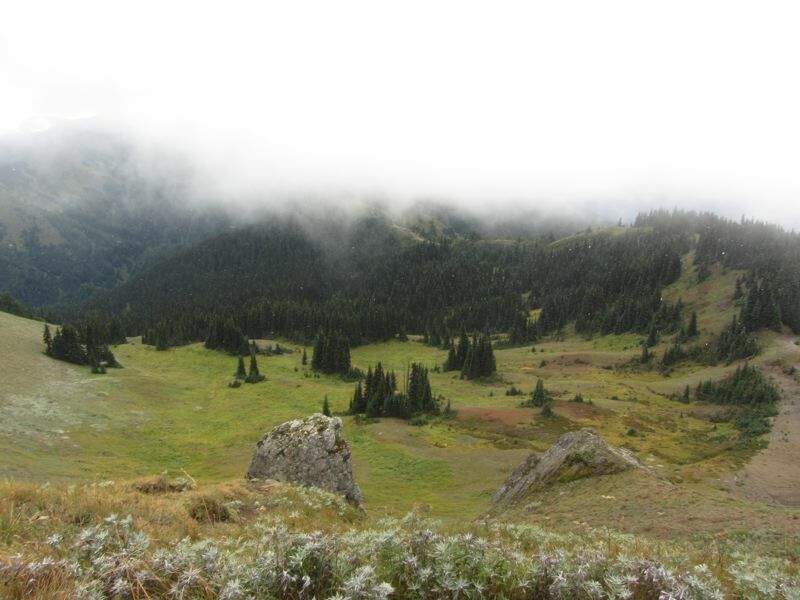 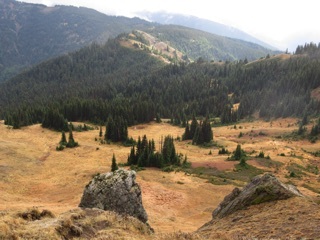 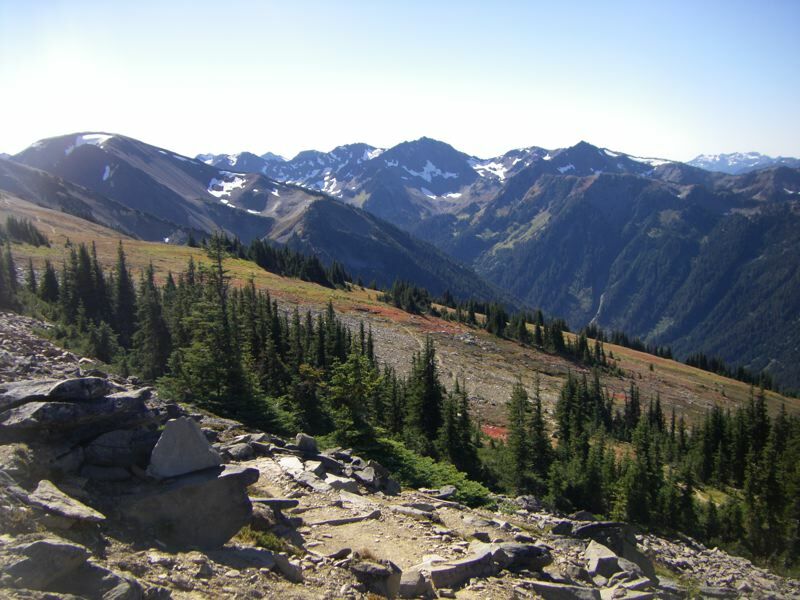 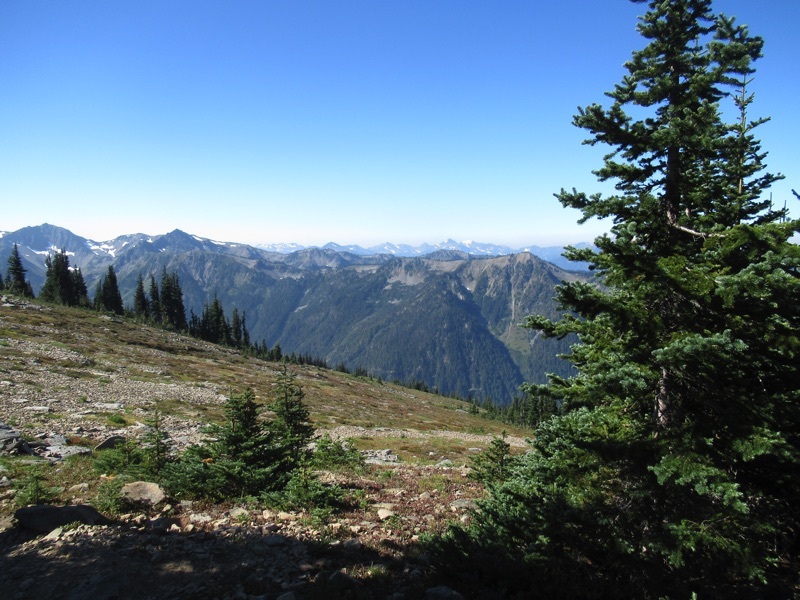 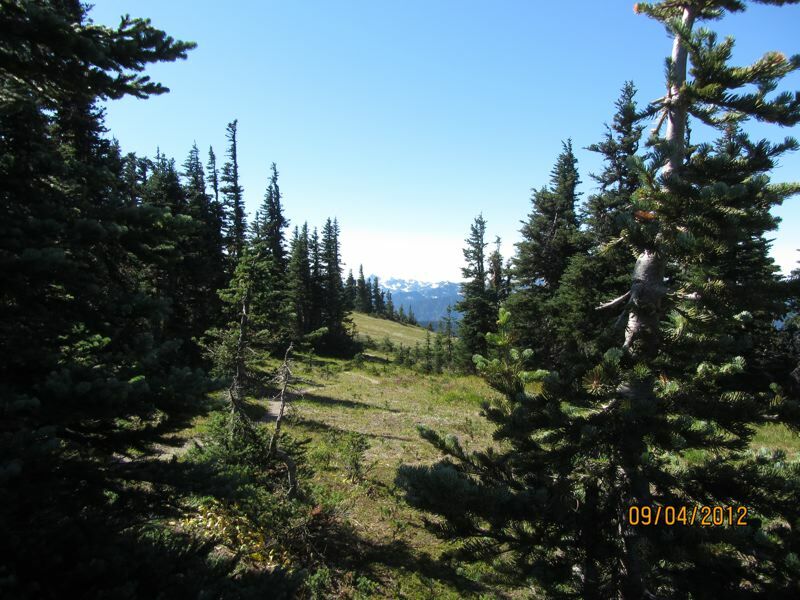 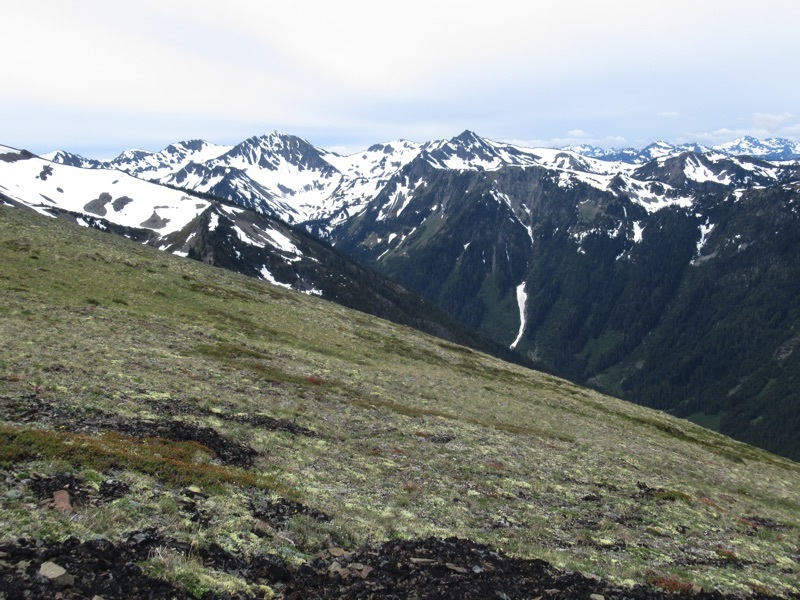 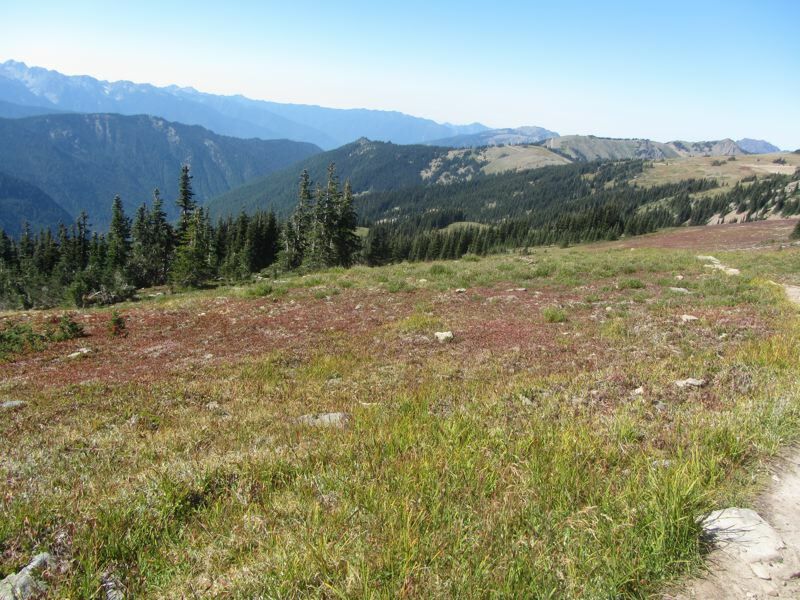 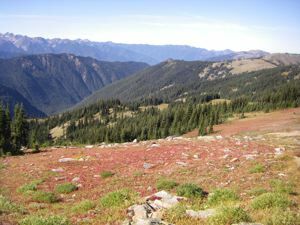 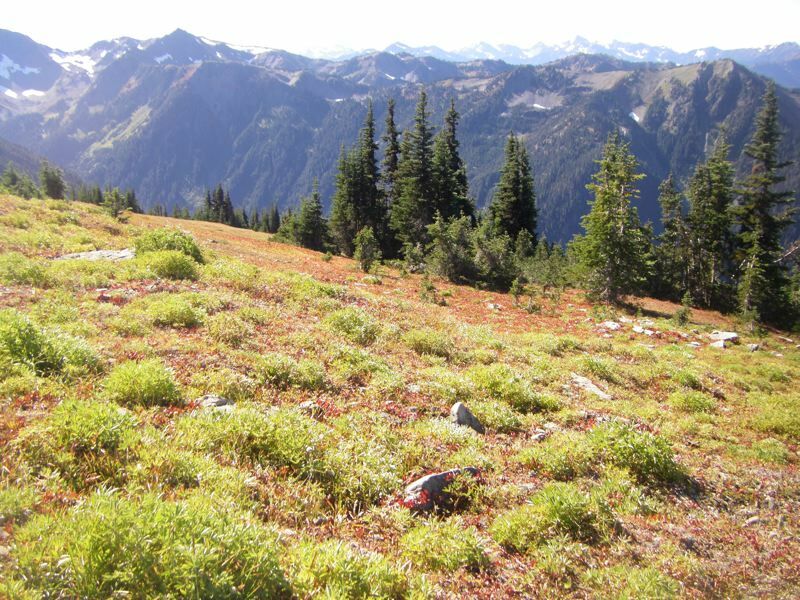 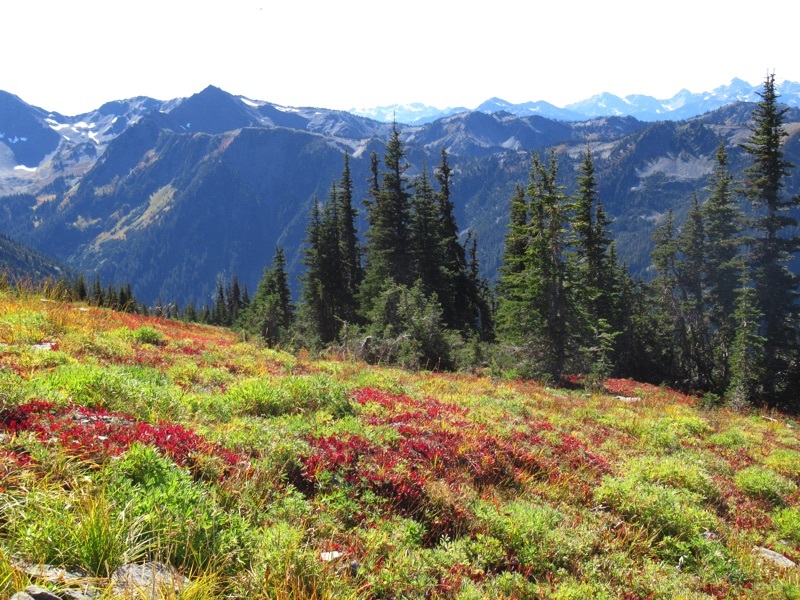 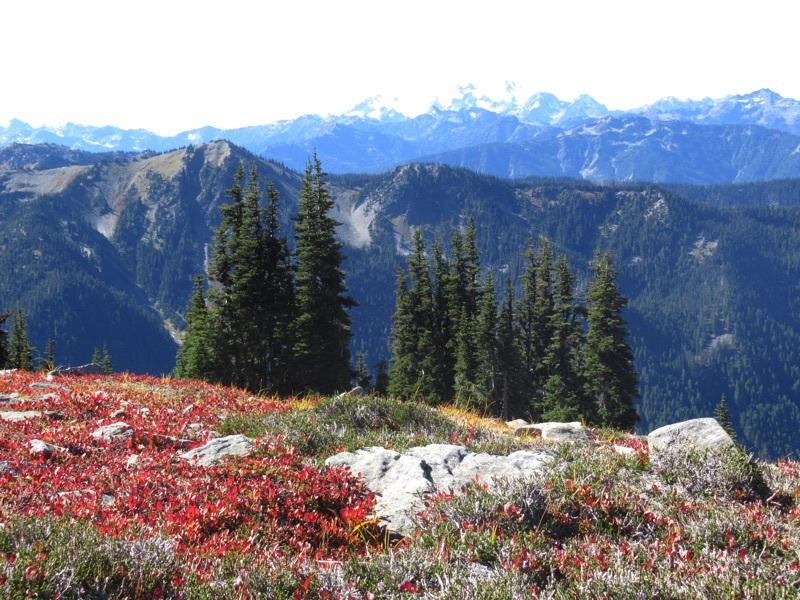 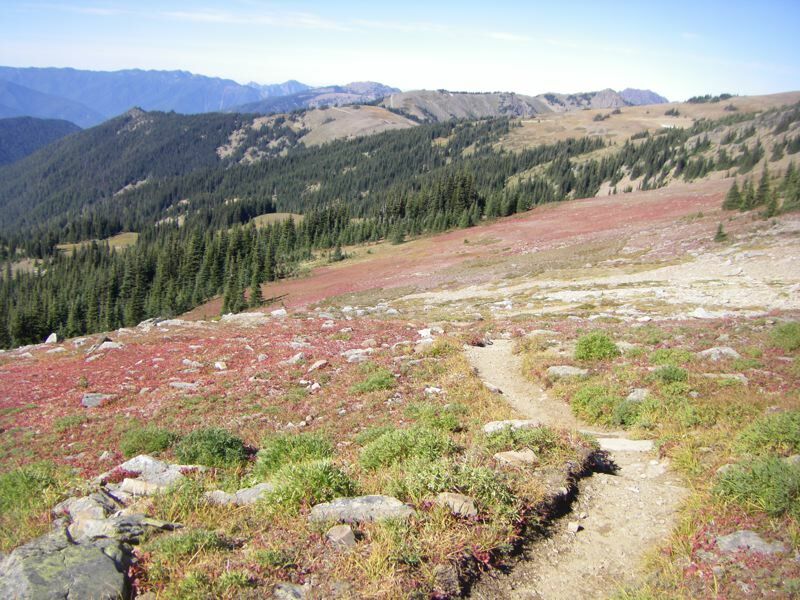 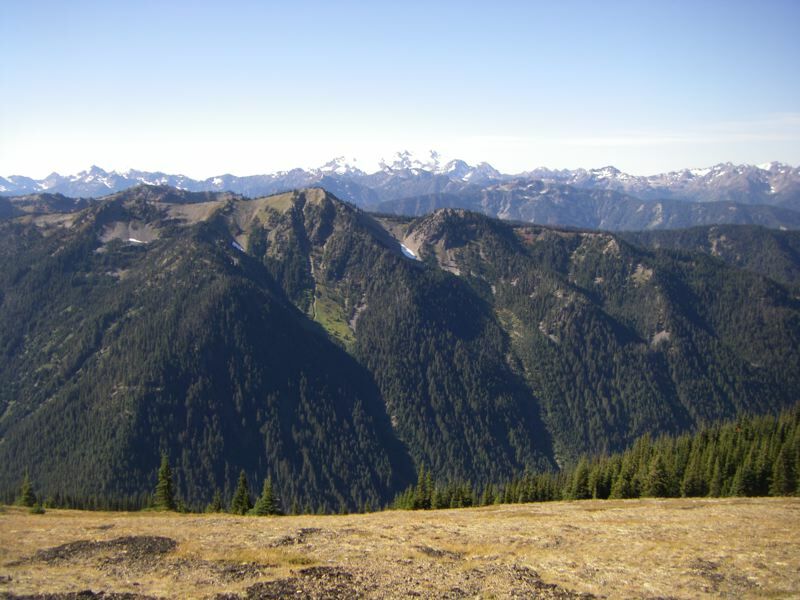 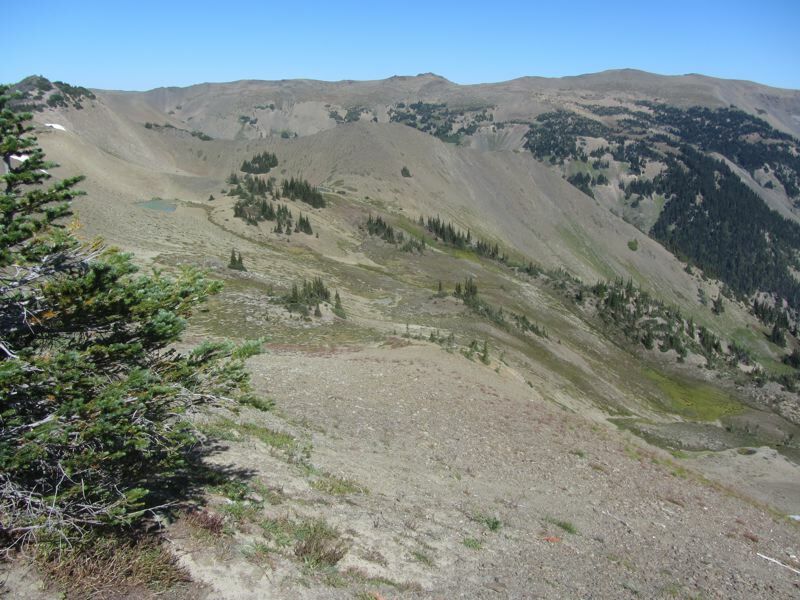 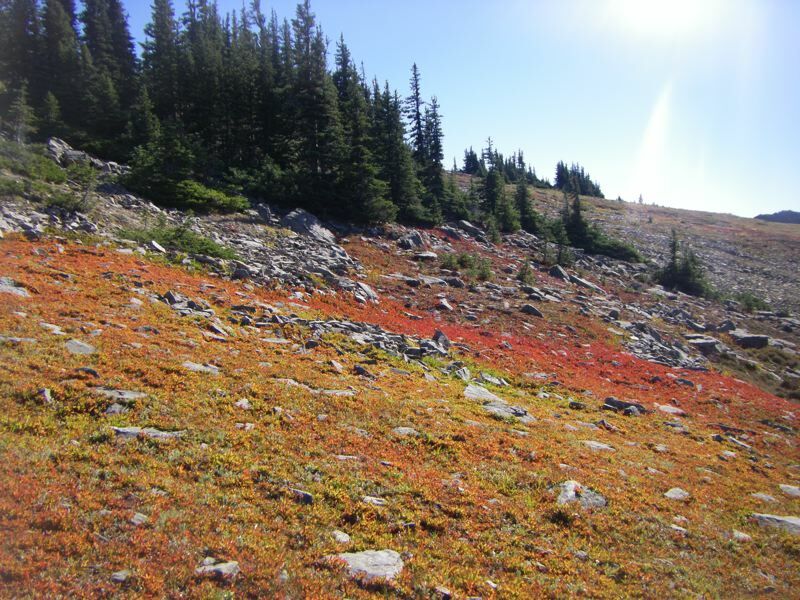 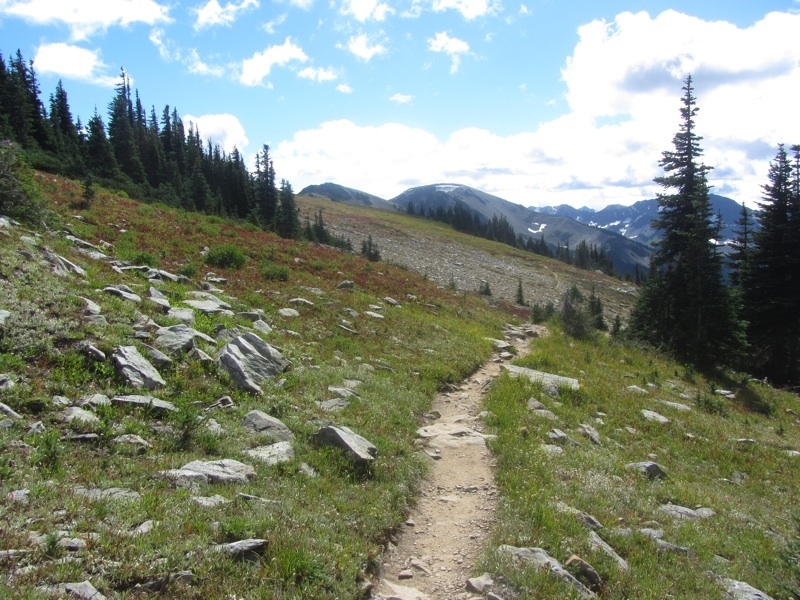 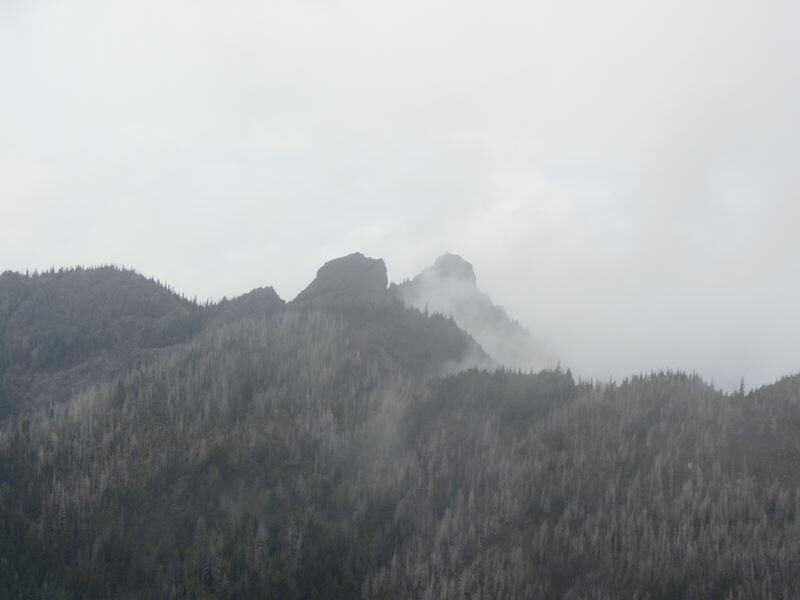 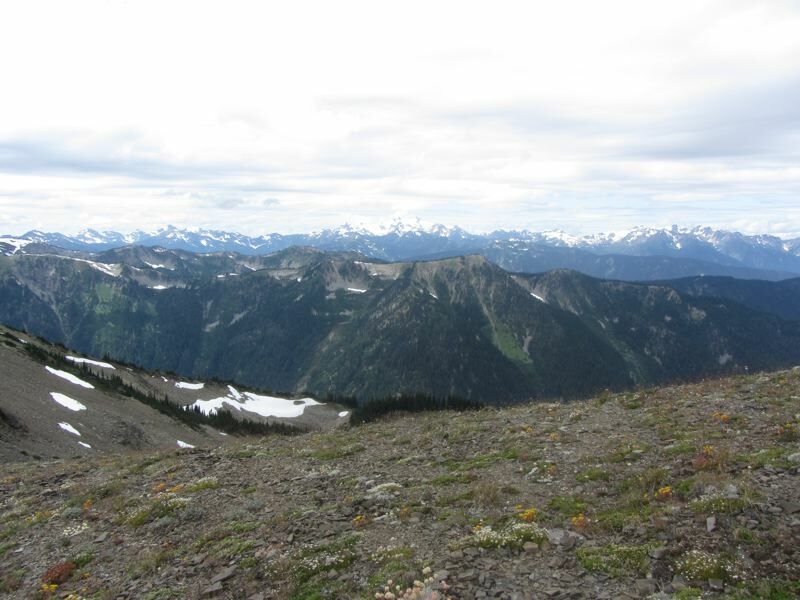 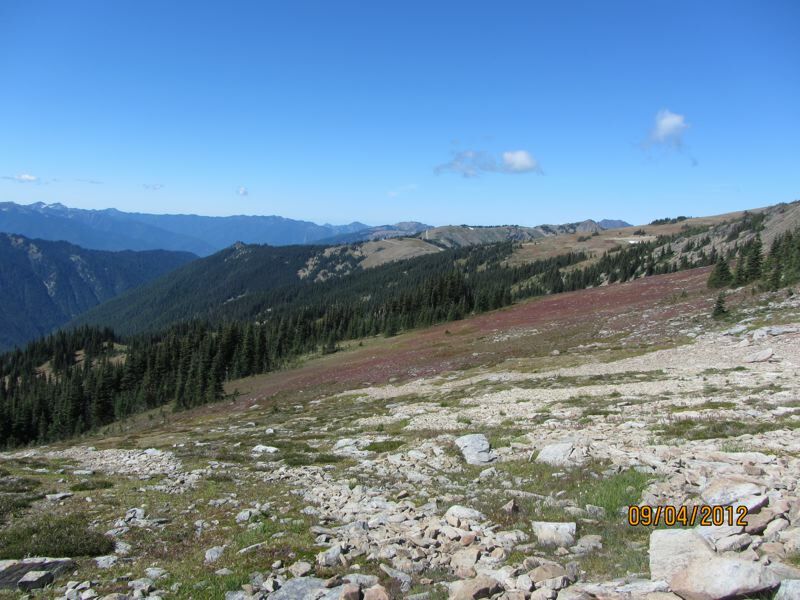 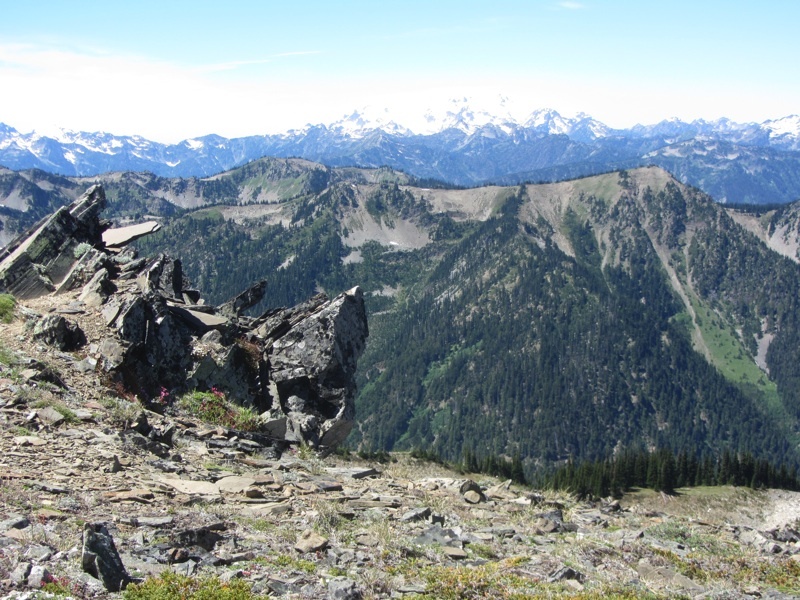 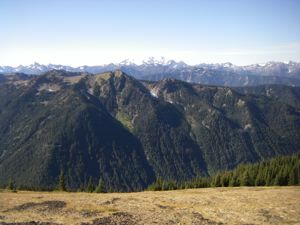 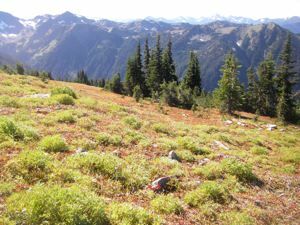 We always like the Lilian Ridge hike out of Obstruction Point in the autumn. 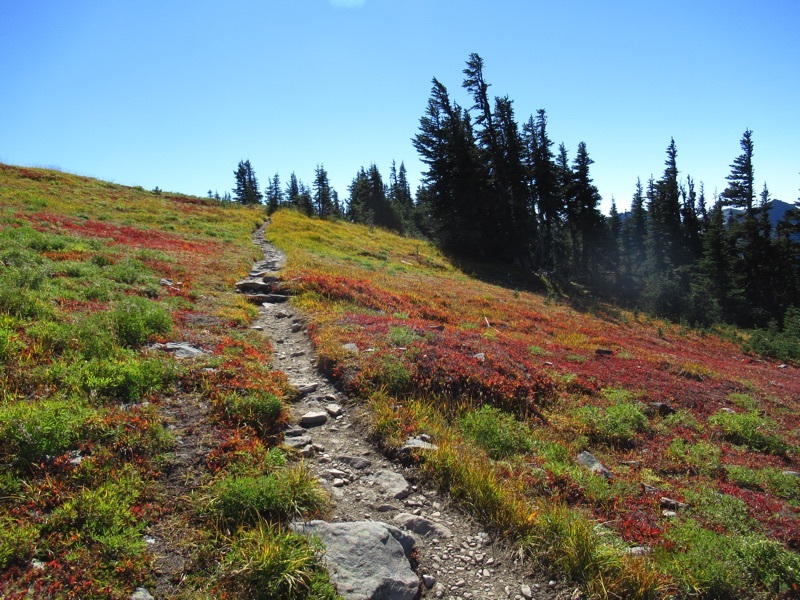 In truth, this hike has its charms in every season, but in the fall the wild, high country foliage starts changing color. There are bright yellows, pale silvers, and some amazing brilliant reds. 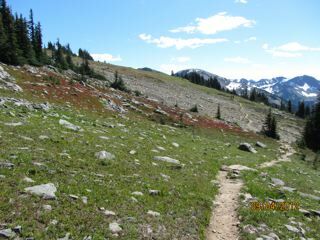 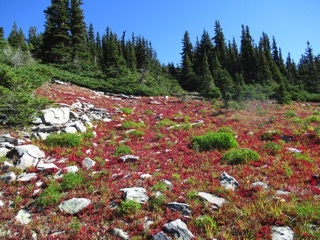 The high country is exotic enough, but sometimes we feel like we are on another world, hiking the bright red plains of Mars. 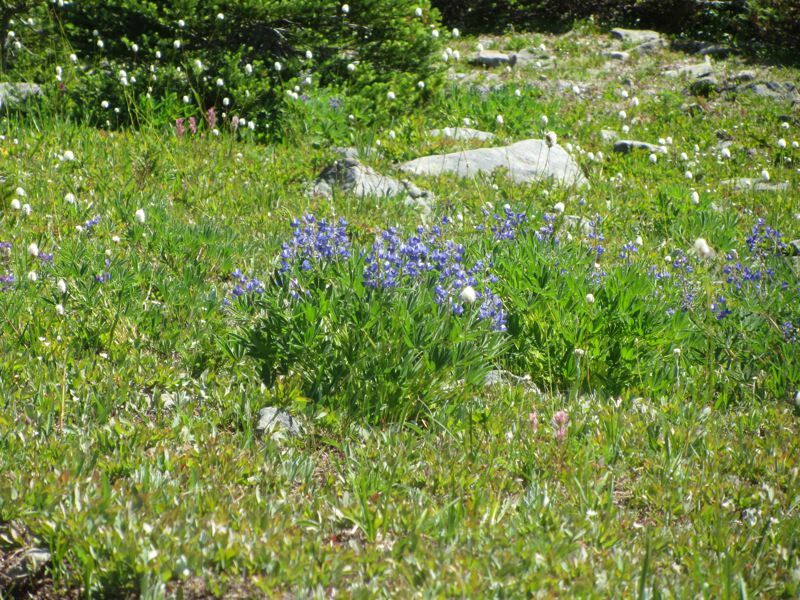 The glacier lilies and phlox may be passing, and the lupine a bit off their peak, but otherwise, this has been the most amazing year for high country flowers. 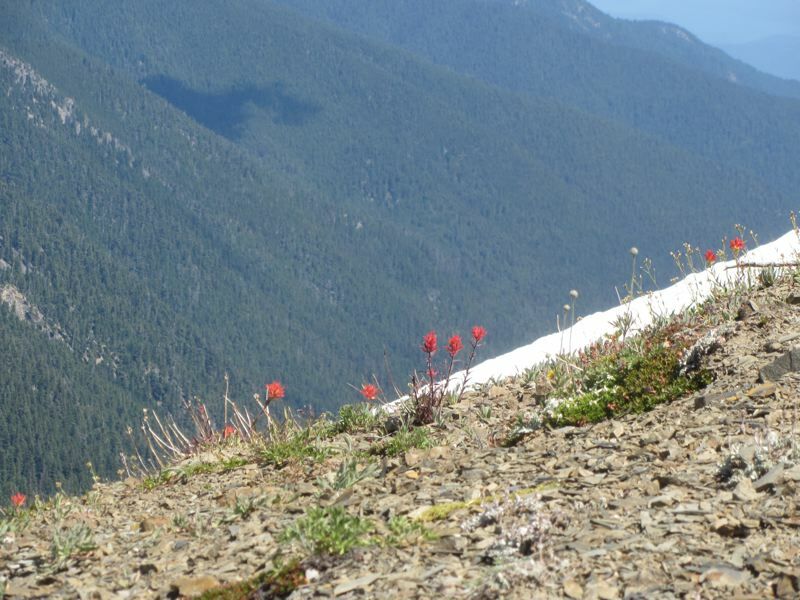 We won't even bother with captions; we don't even know the names of most of these. They're just beautiful. 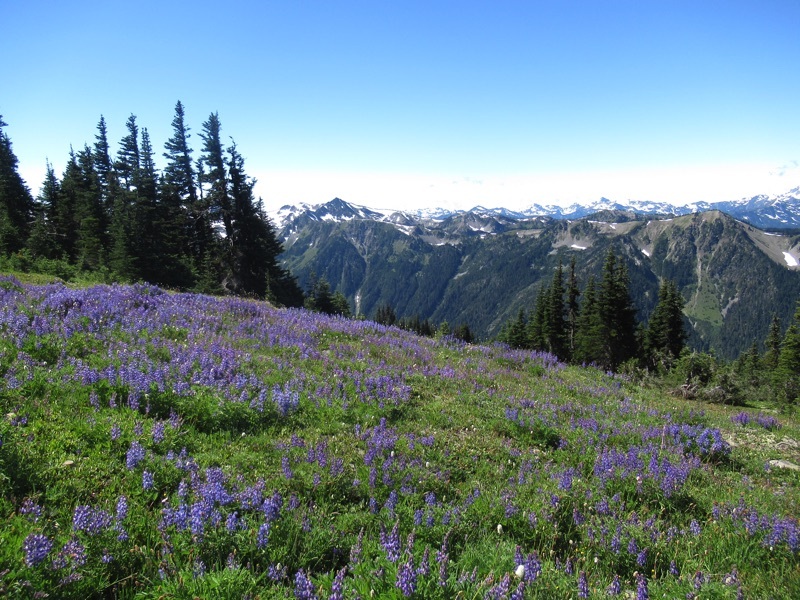 We'll let the pictures do the talking. 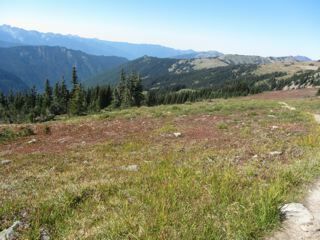 Obstruction Point Road opened a bit over a week ago, so we ventured out from Hurricane Ridge. It's a one and a half lane unpaved road, so we drove carefully to the parking lot at the edge of the high wilderness. 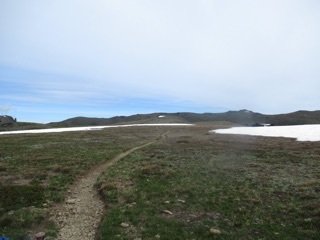 Most of the snow on the trail had melted, so we made it all the way to where the trail drops off for the descent towards Grand Lake. Here, there was some snow on the trail, but otherwise, it was easy going. 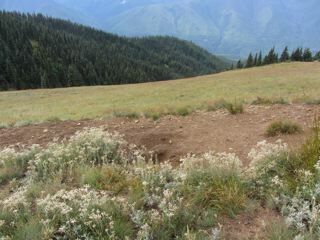 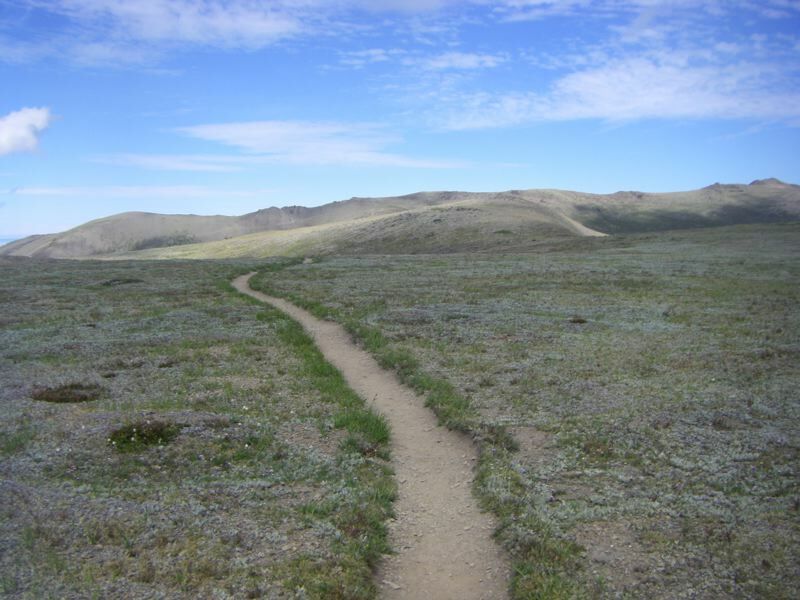 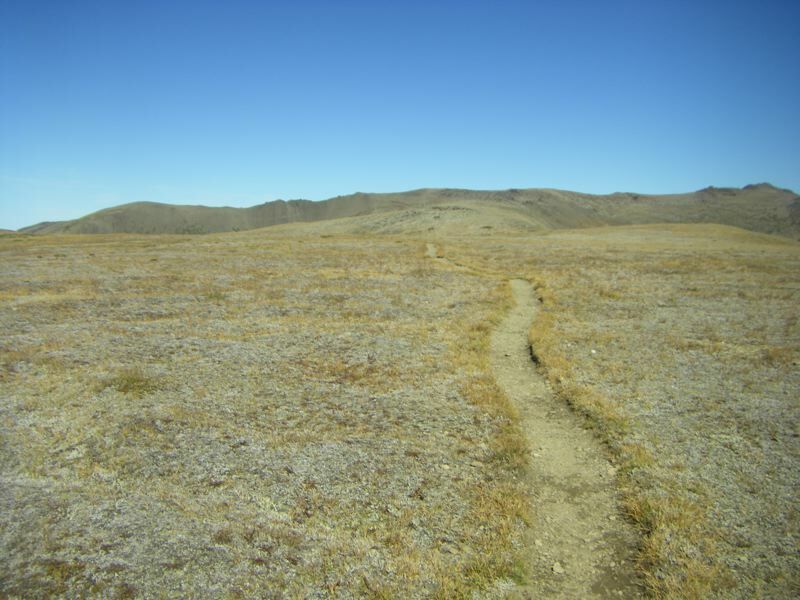 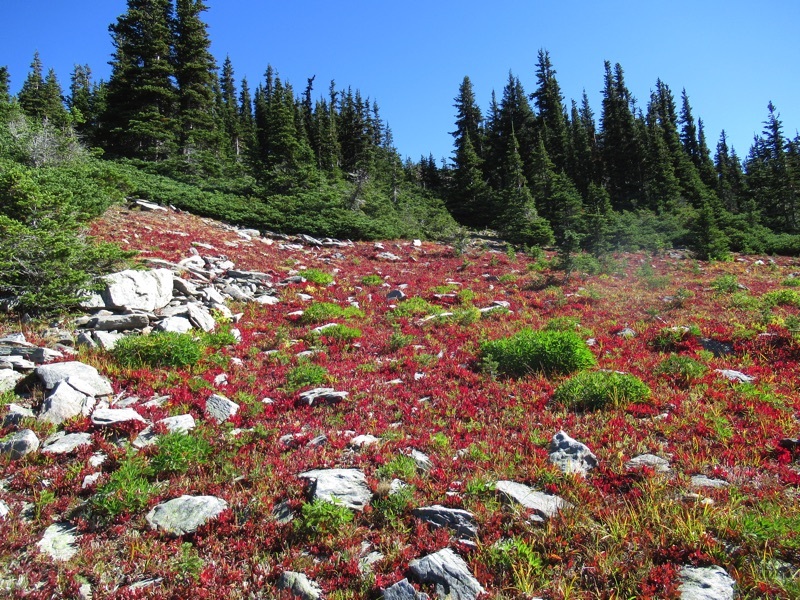 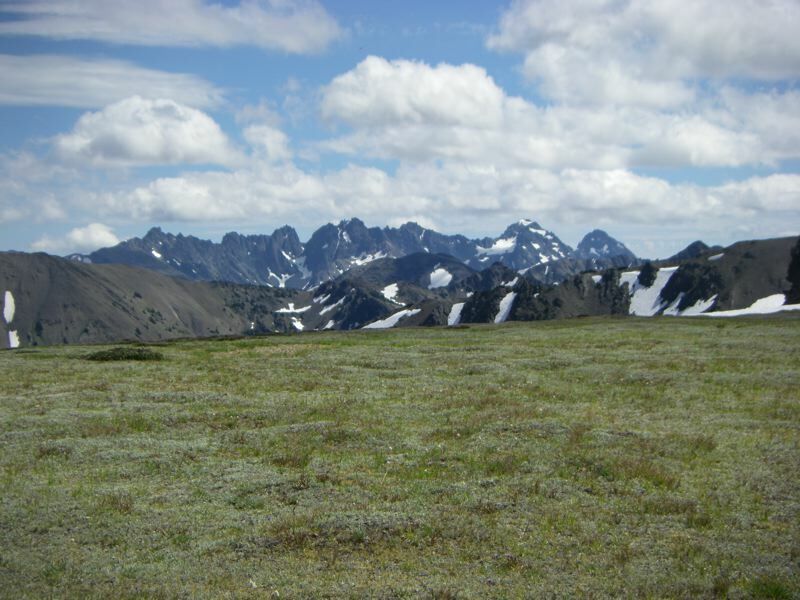 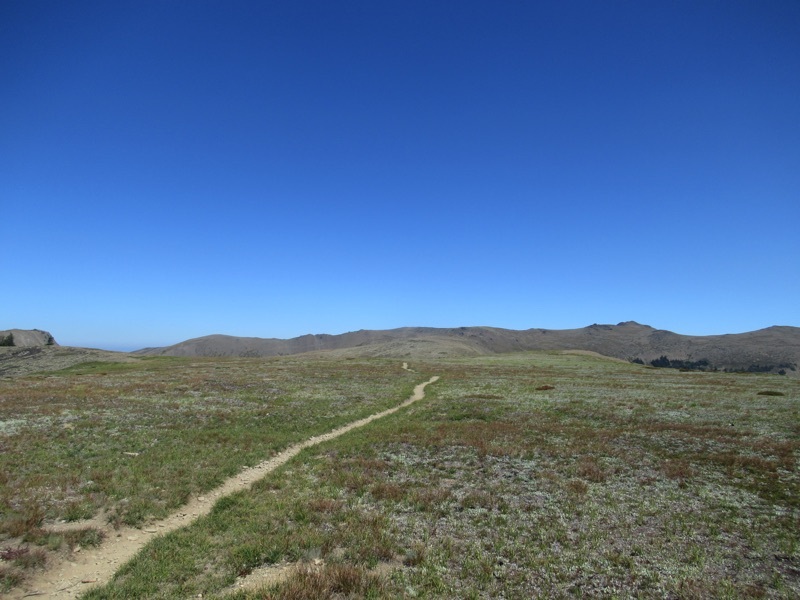 The high country here is wild and austere with dusty trails, cracked rocks and a profusion of wild flowers. 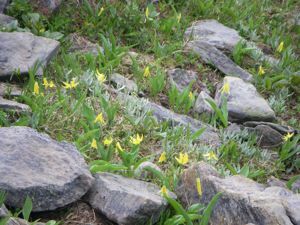 There was some phlox and a few glacier lilies left, but there were so many flowers that we'll have to have a separate post just for them. Some years, the alpine lakes in the valleys below are covered with snow, but this year, the snows have melted early, so they are all full of water and almost like distant mirrors. 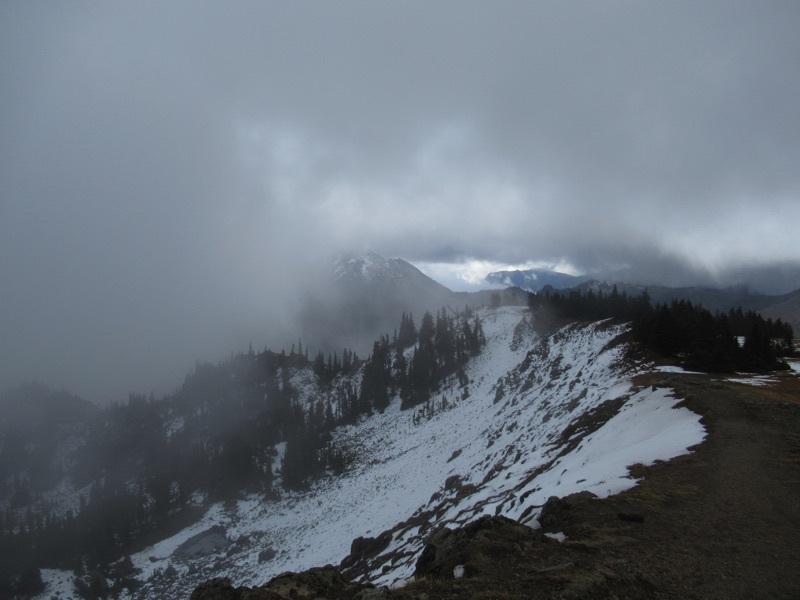 Obstruction Point Road has already closed and the weather has been changeable. Instead of the usual September sun, our skies seem to be visitors from October. 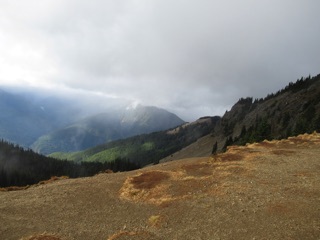 We hiked the Hurricane Hill Trail on a quiet day and watched Mount Olympus fuss with its wreath of clouds before vanishing. 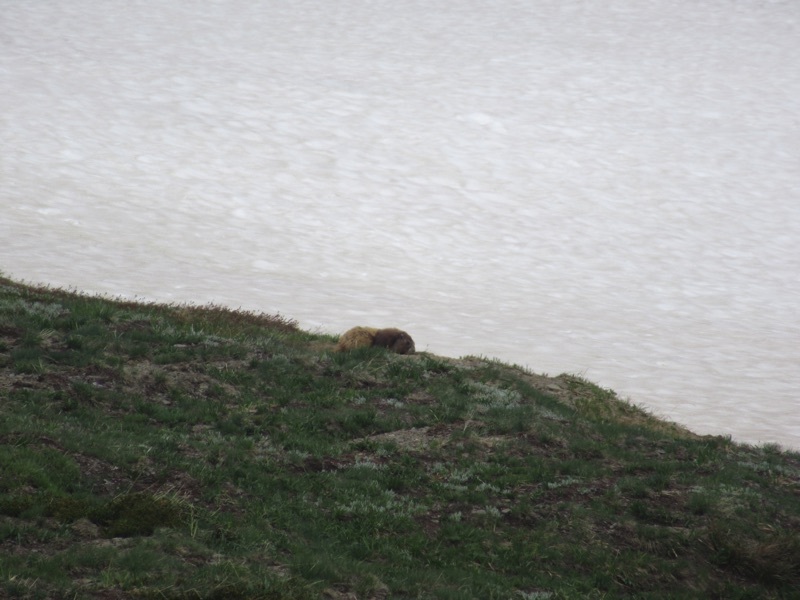 The marmots were out, but turning darker and browner for winter. 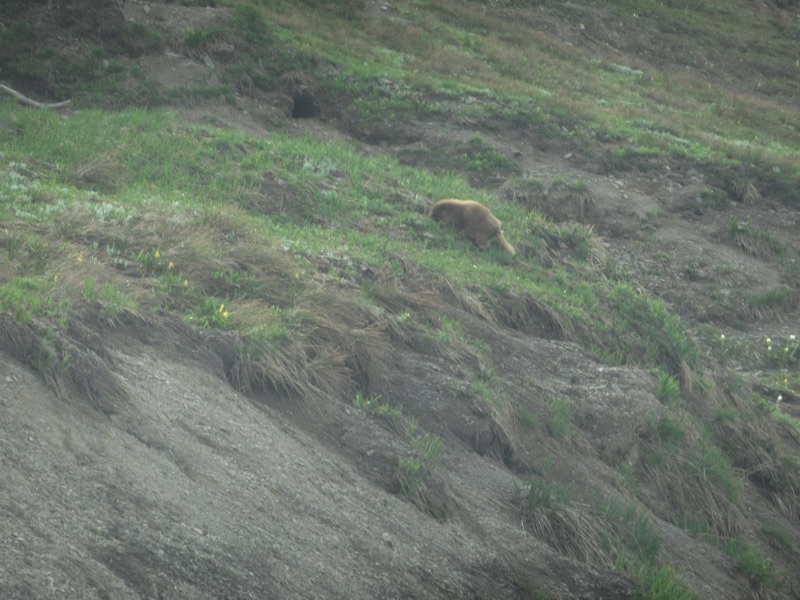 Only their hindquarters were golden. 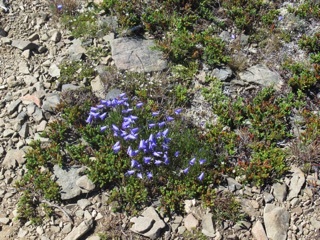 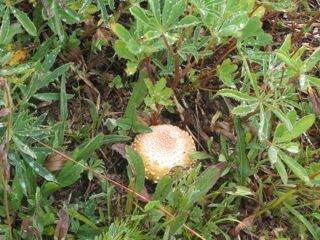 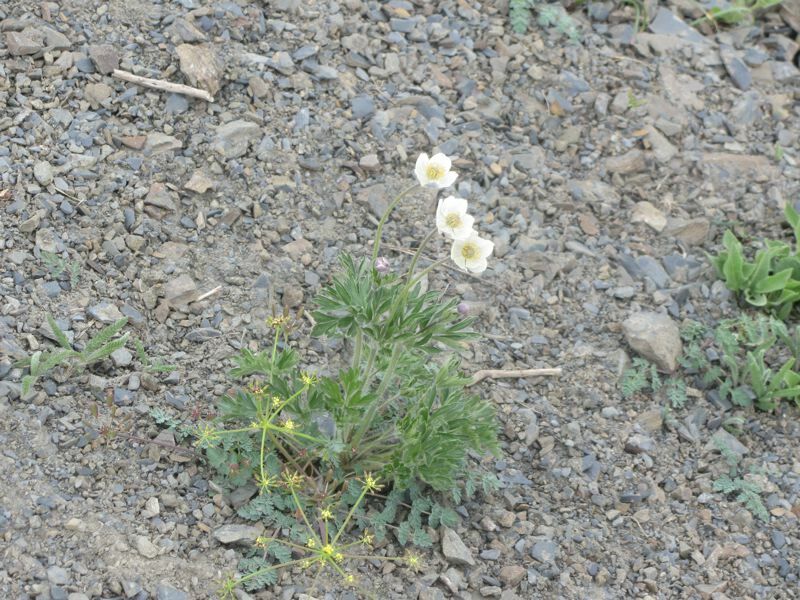 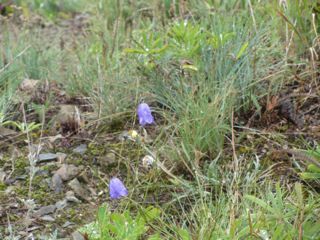 We saw only a handful of flowers, dried yarrow, a few harebells, and the like. 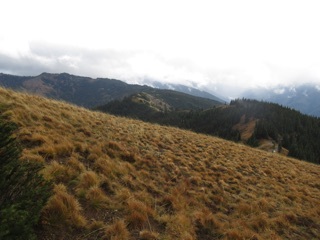 Instead we saw fall foliage with the grasses turning golden and leaves turning red and brown. Autumn is coming to Obstruction Point. It is always dry at the end of Obstruction Point Road, and the high country is always wild and open here. Already, the foliage has started to turn red, so part of our hike feels like crossing the Plains of Mars. Another view of the mountains - We will miss them when the hiking season ends. 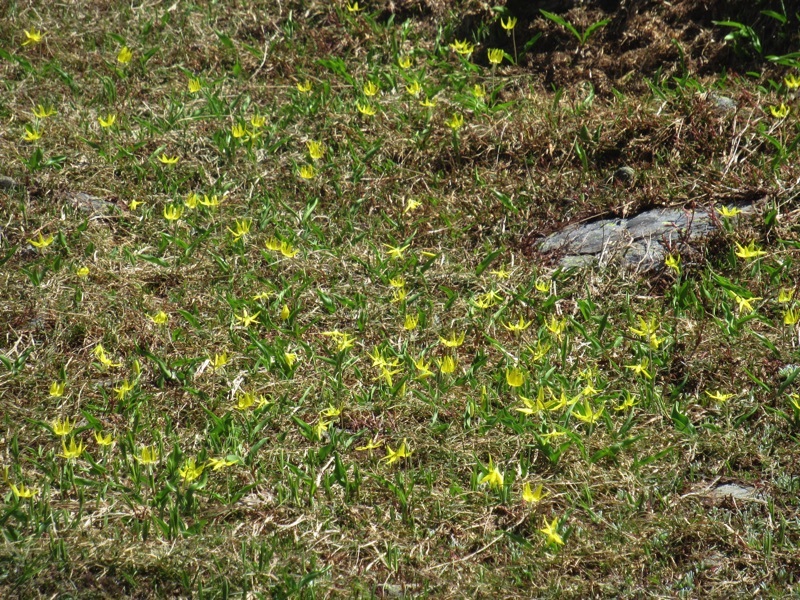 We call these mock dandelions, but we're sure no on else does. 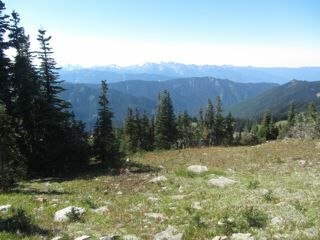 They just opened the road to Obstruction Point, so we drove out to take a short stroll. 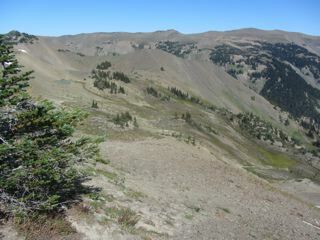 As it turned out, we hiked all the way to the "rim", the start of the big descent to Grand Lake. There was much less snow on the trail than usual, despite the early road opening. 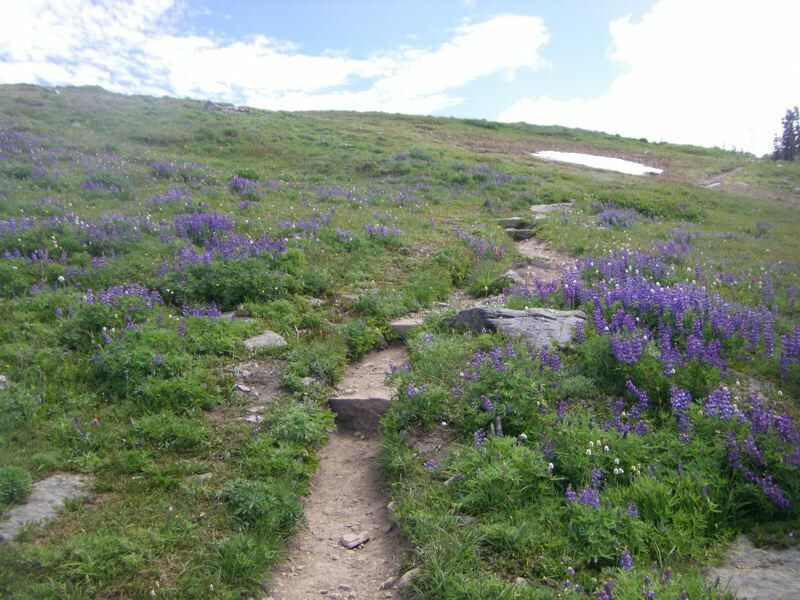 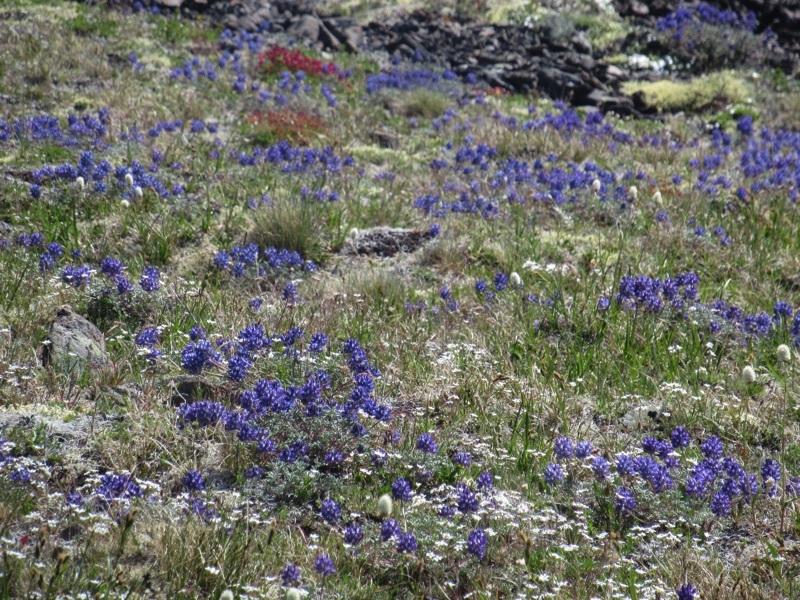 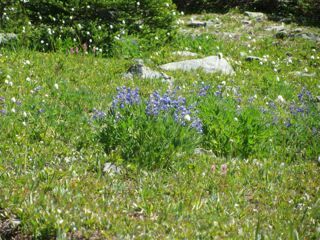 There was still some phlox and lots of lupines, and, if you looked carefully, you could see a few avalanche and glacier lilies about. 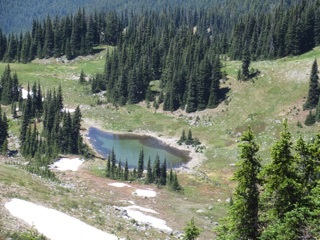 The lakes in the valley have already filled, and at least one of the tarns has already dried out. 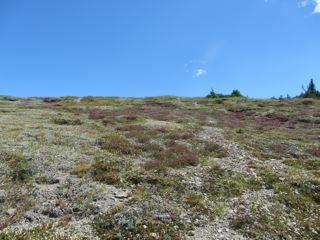 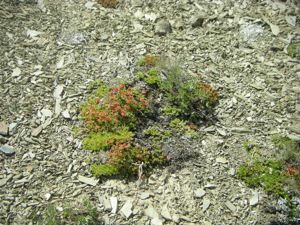 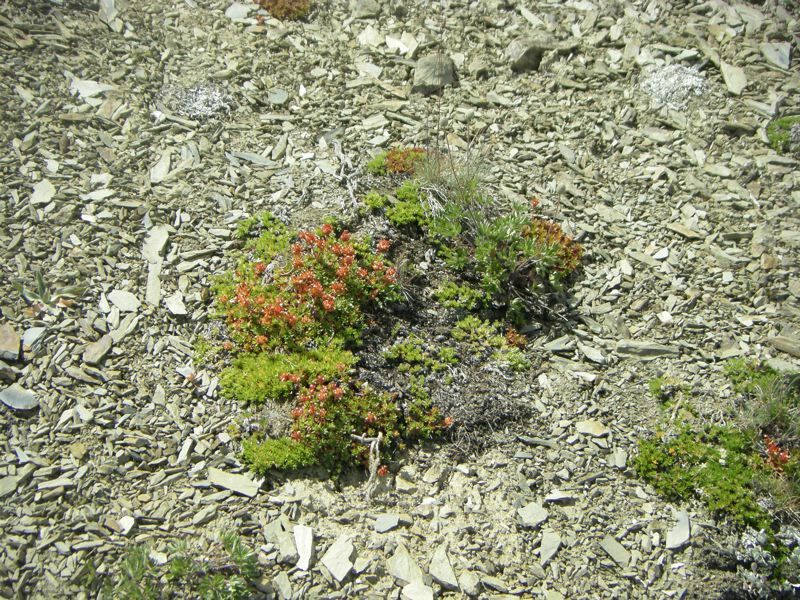 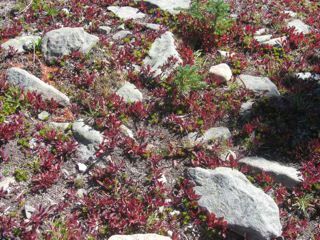 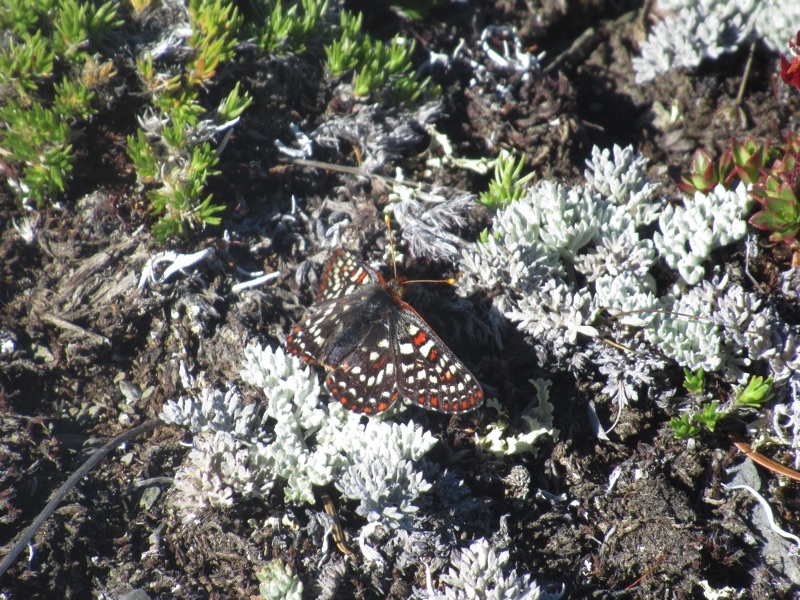 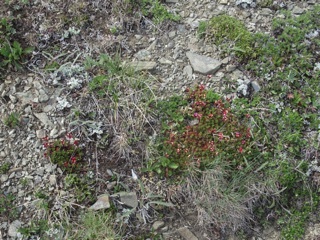 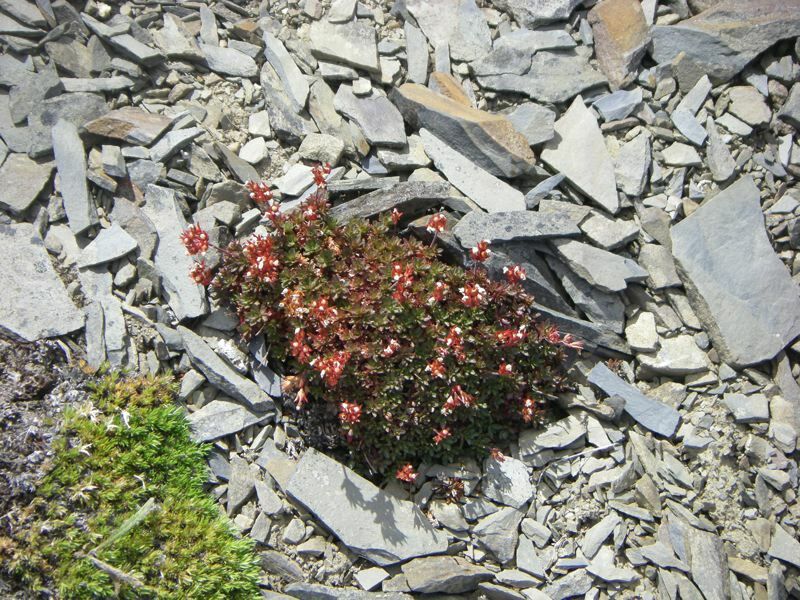 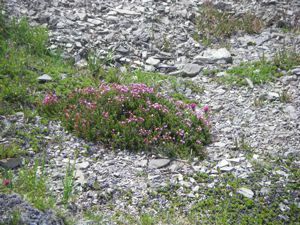 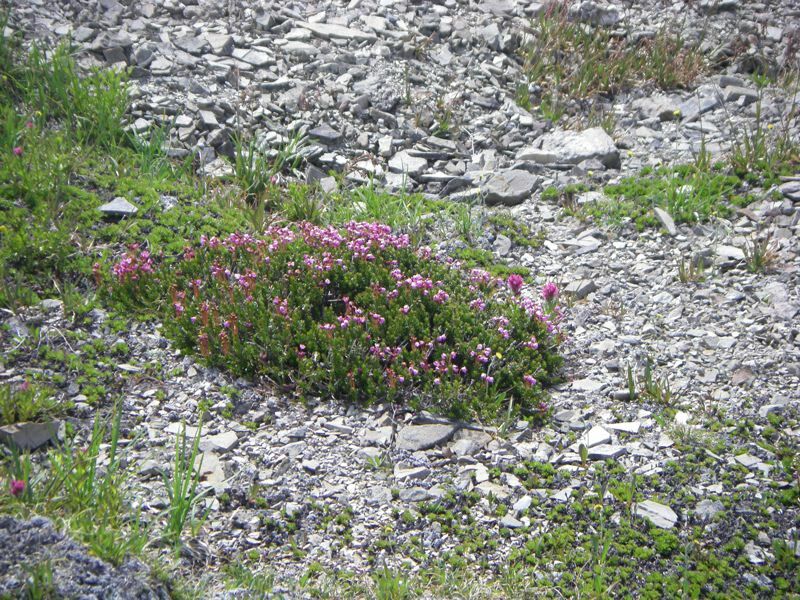 Still, there are patches of snow and a host of late season flowers including pink and red paintbrush, yarrows and hampers of dirty sock plant. 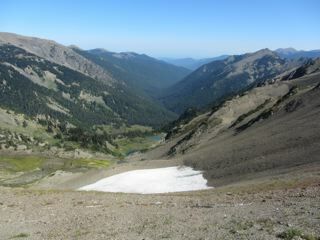 We weren't sure we could make the climb from the parking lot to the plateau, but it turned out we could. 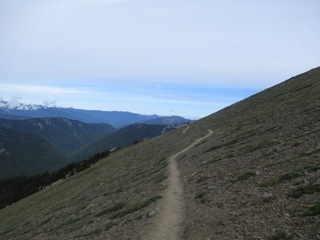 We double dog dared each other at the staircase and descended warily, expecting a hard climb back up. 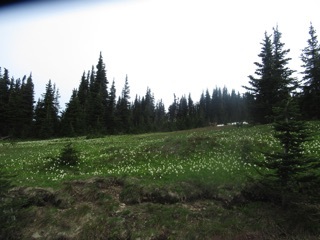 Then, how could we not cross the meadows and check out the view of the valley where the melting snow fills seasonal lakes for our entertainment. 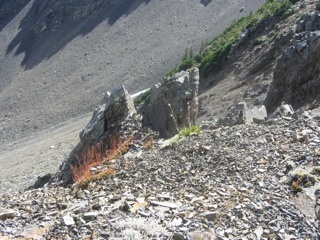 From there, we were called to climb a bit higher and continue down the trail. We made our way to the rim. 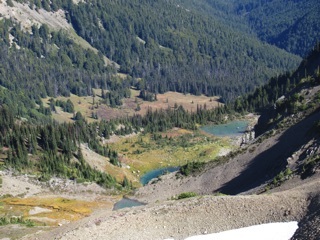 Grand Lake beckoned, but enough was enough. 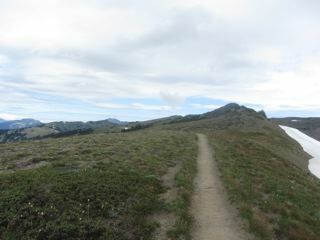 We slowly and ever so regretfully made our way back to our car. 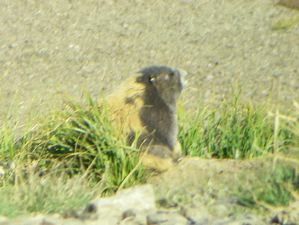 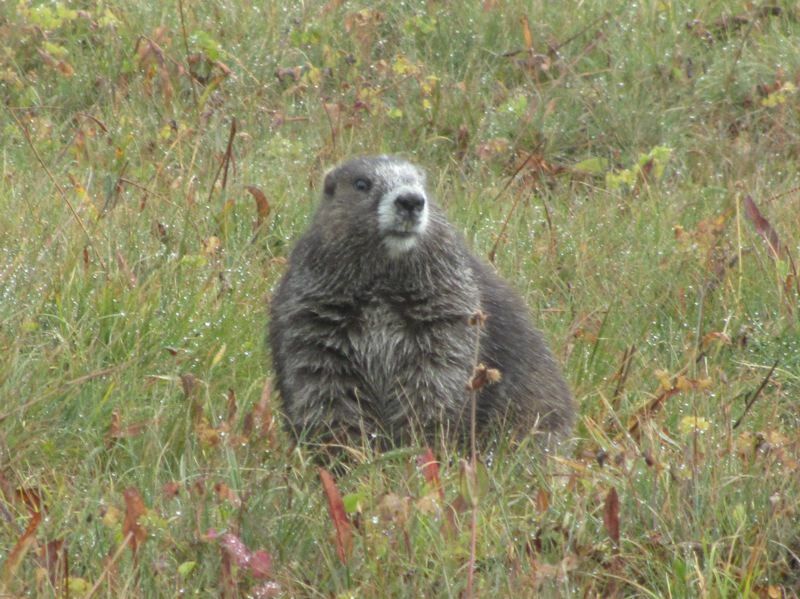 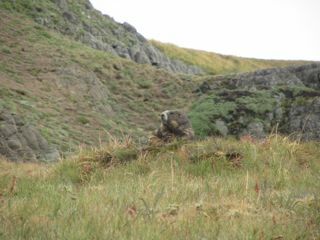 We even had a great marmot sighting on our climb up the staircase. The first glimpse was of the marmot racing up the stairs and around a bend. 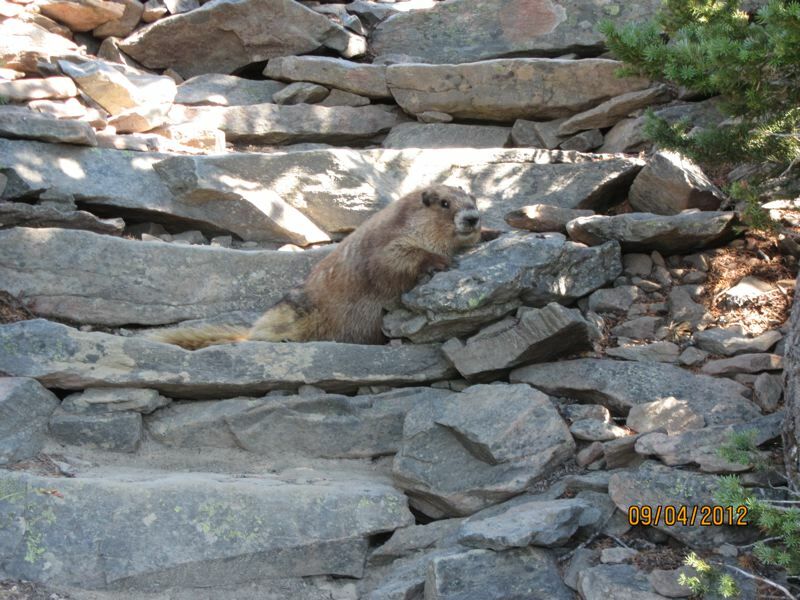 We figured he or she would be safely hidden under a rock or bush by the time we labored up the steps, so you can imagine our surprise to find the little guy right on the steps relaxing and enjoying the shade. 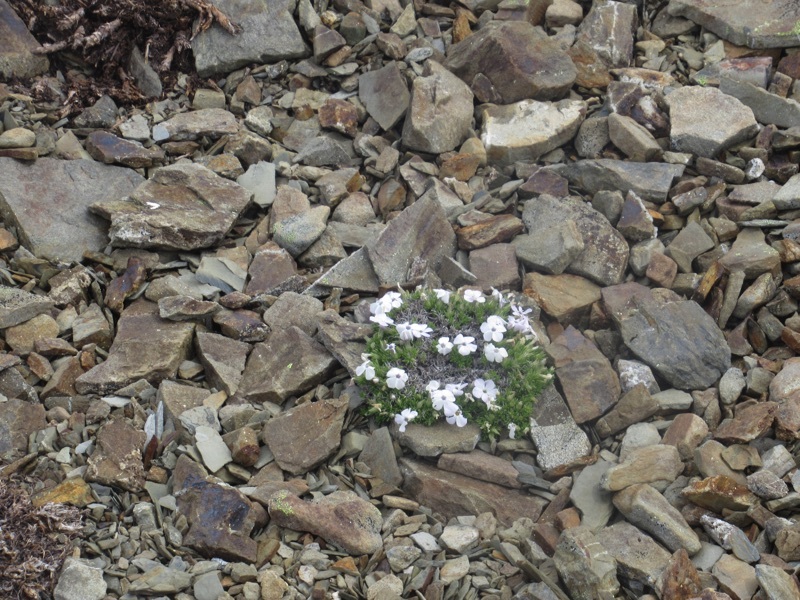 It can be overwhelming at times. 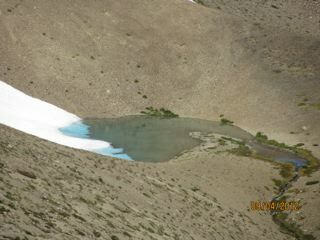 Last year's snow is still melting. 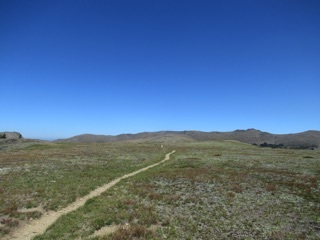 The fields of Mars beckon. 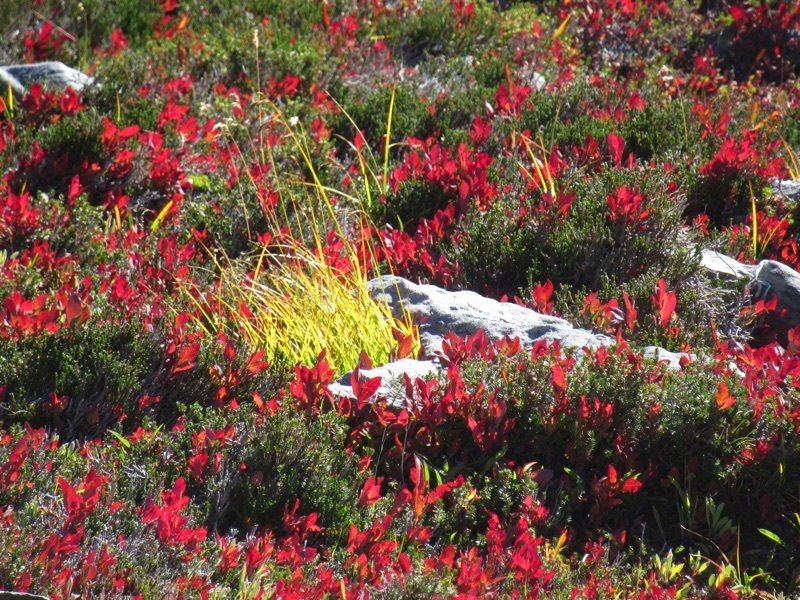 The foliage here turns a brilliant red. 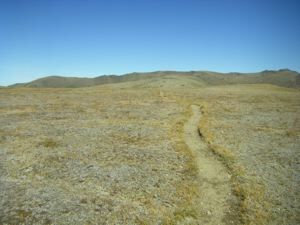 The land is dry already. 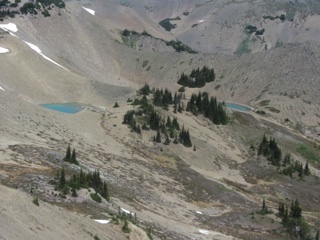 The road to Obstruction Point has been open for a while now. We managed to make our way out and took a little walk, stopping just before the big descent to Grand Lake below. There wasn't very much snow on the trail, but there was lots of snow still melting all about. 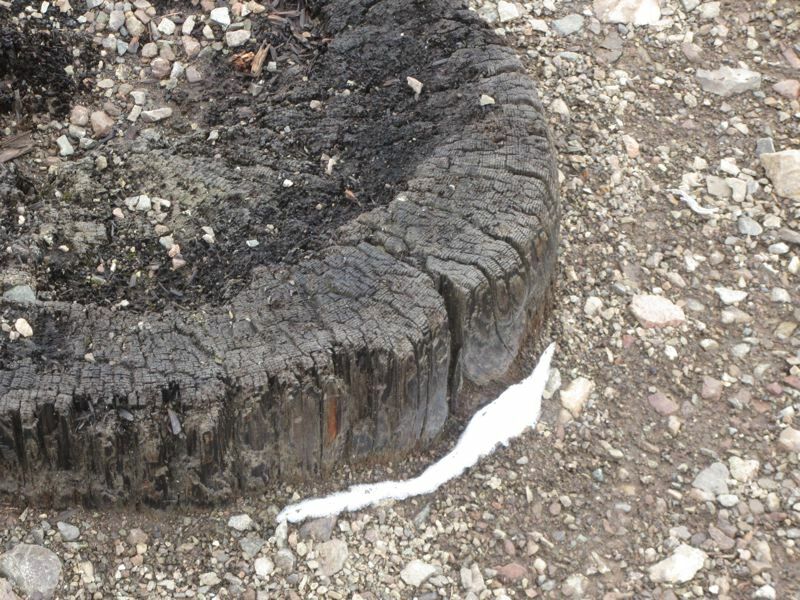 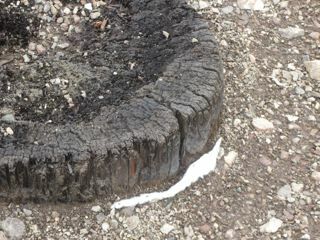 The melting snow patterns were unusual this year, either that, or the snow has lingered. 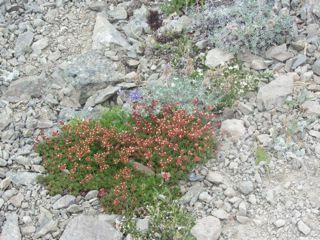 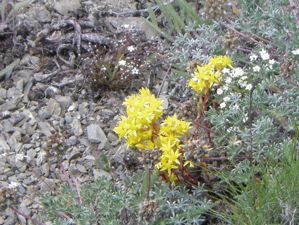 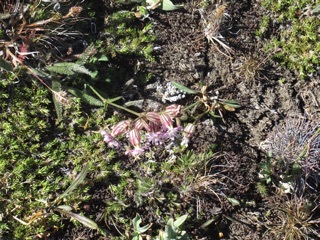 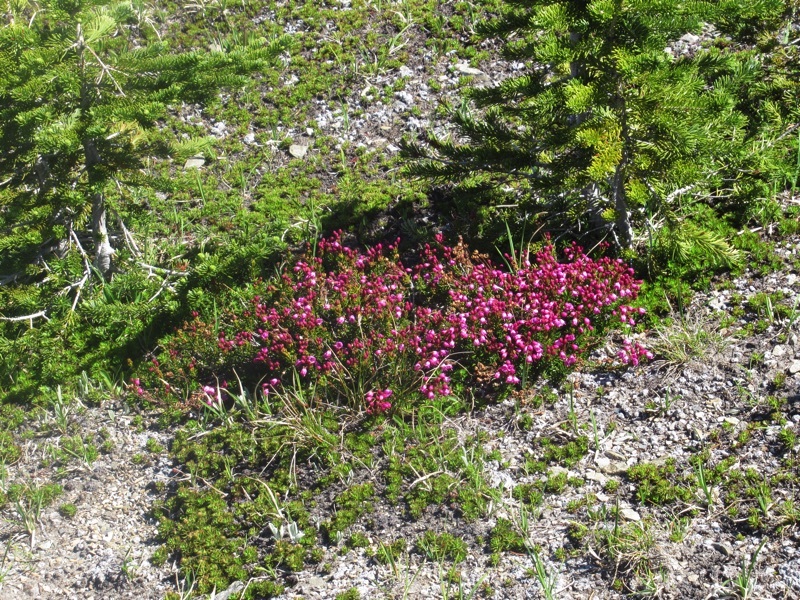 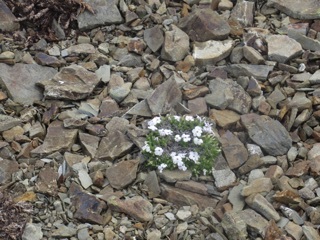 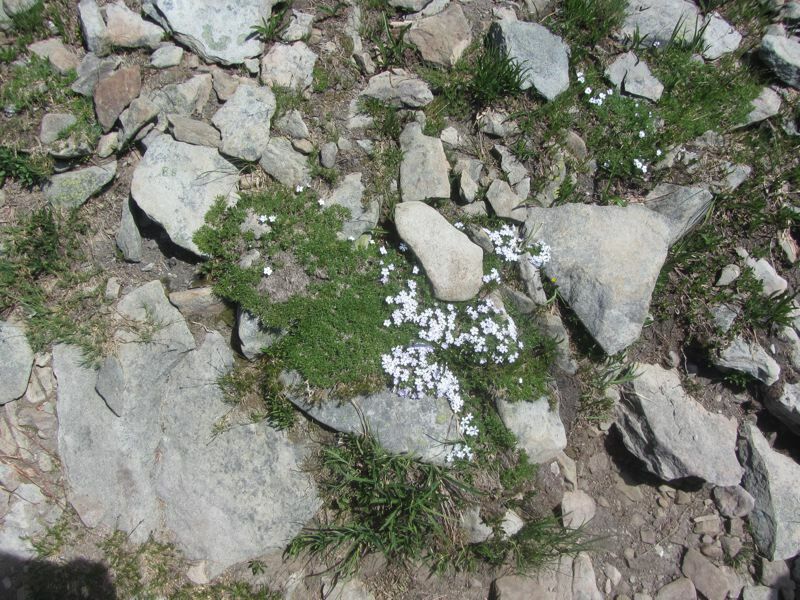 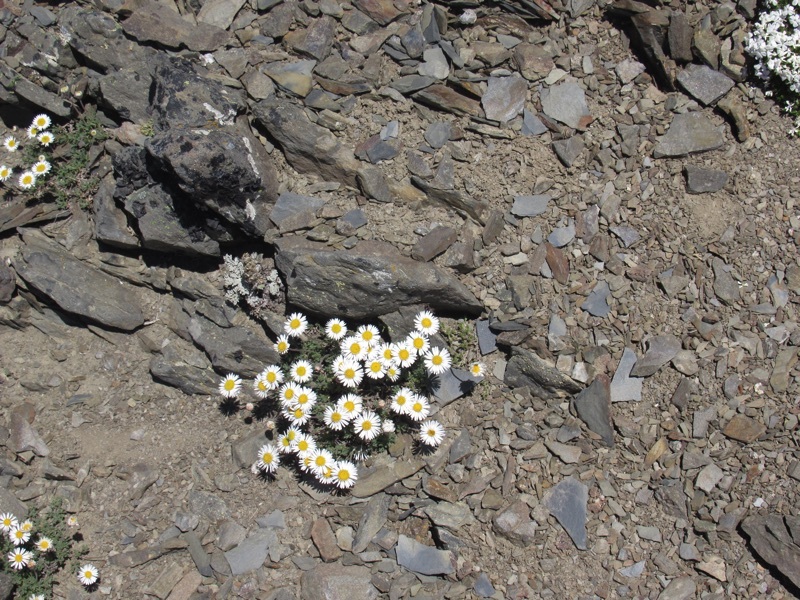 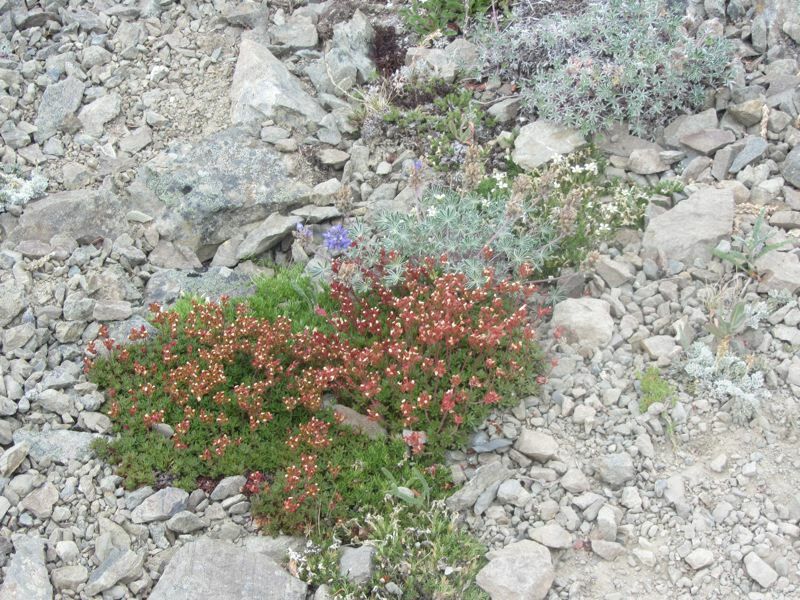 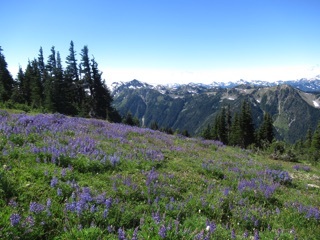 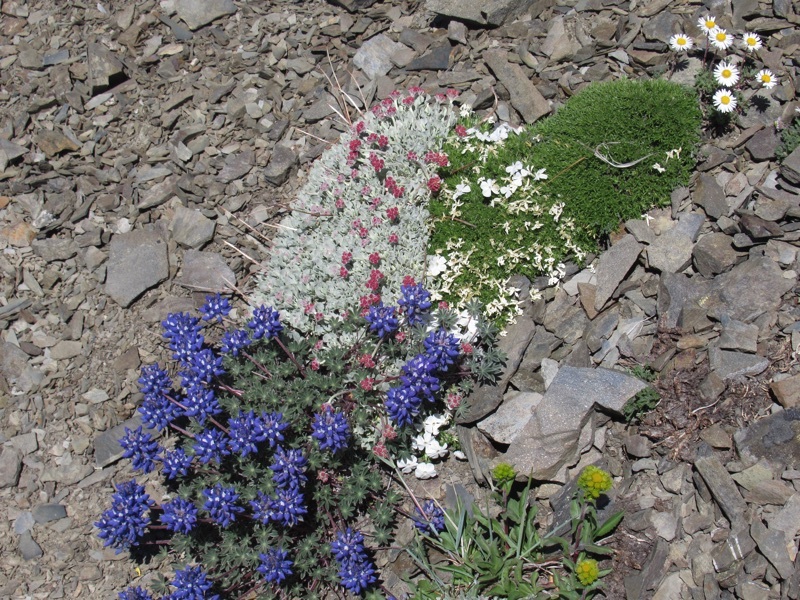 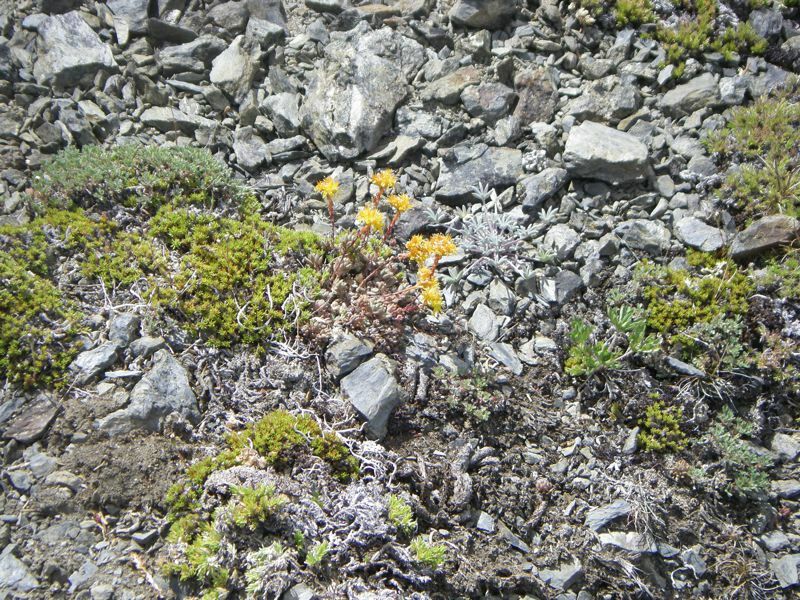 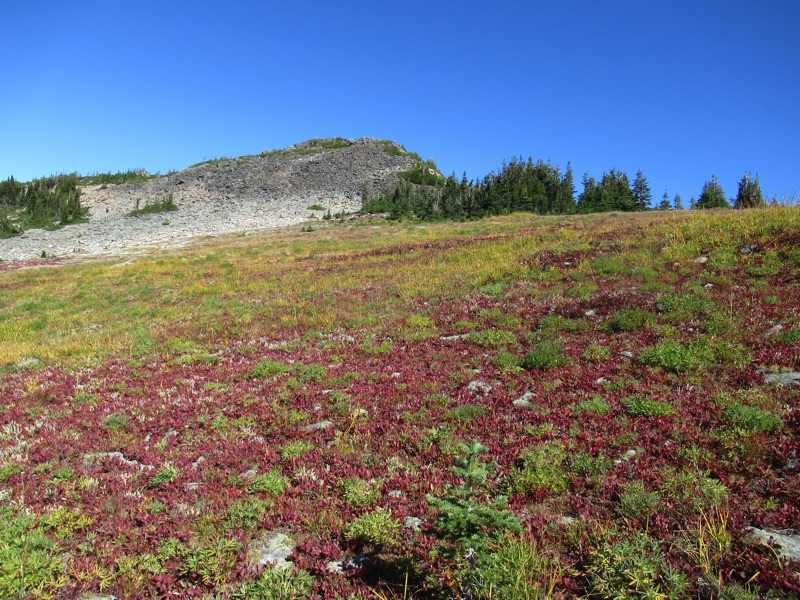 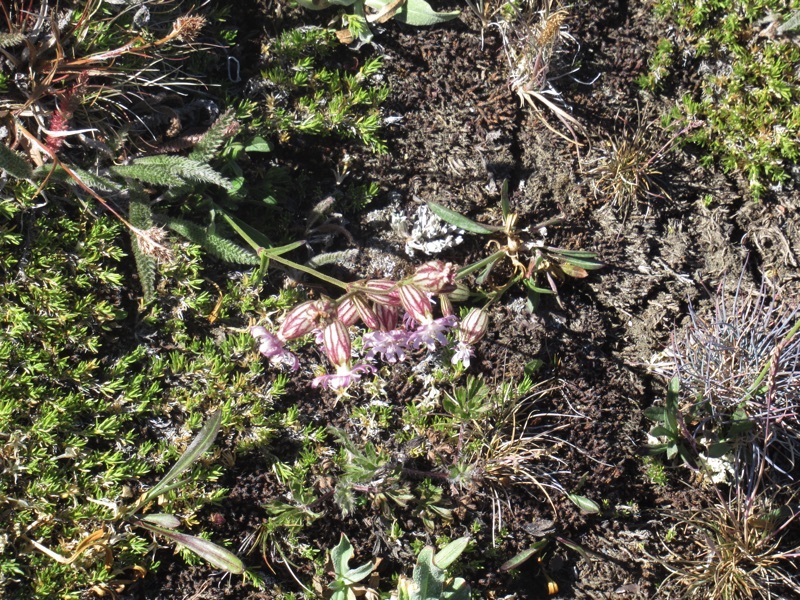 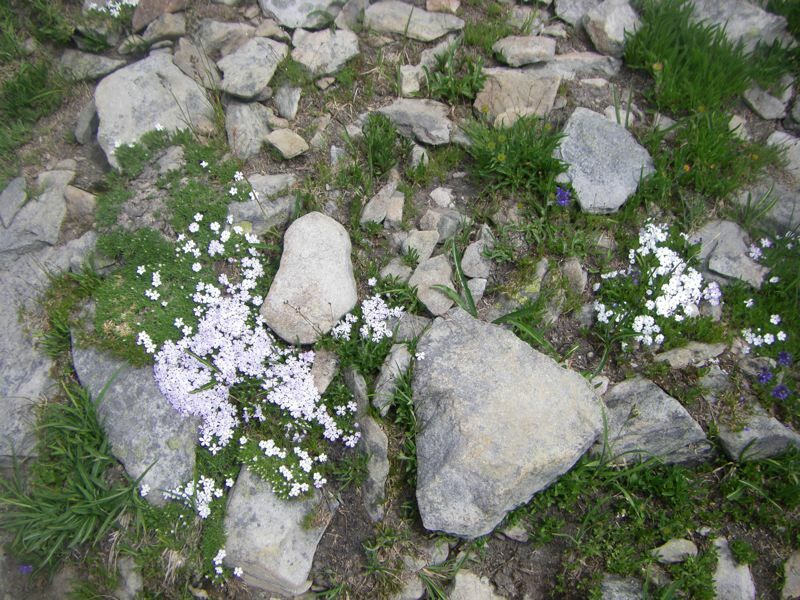 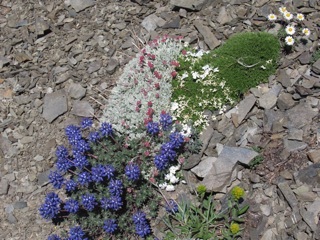 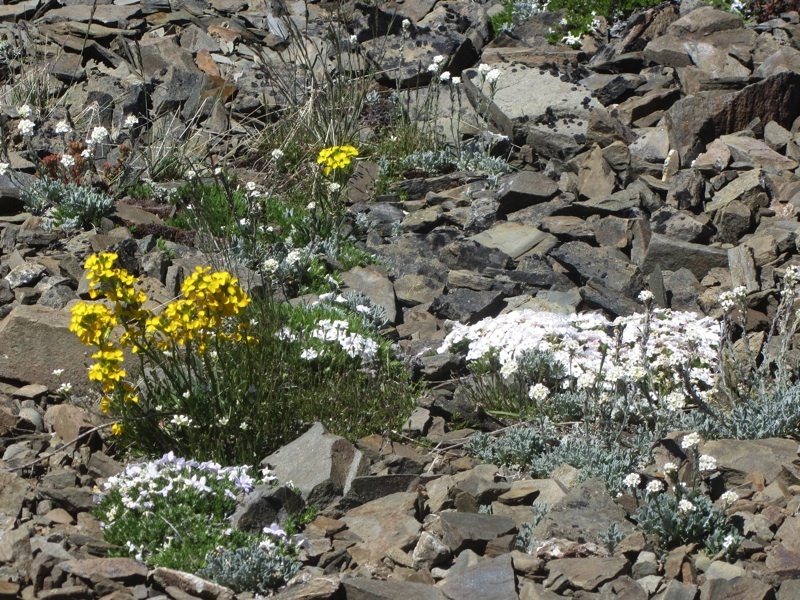 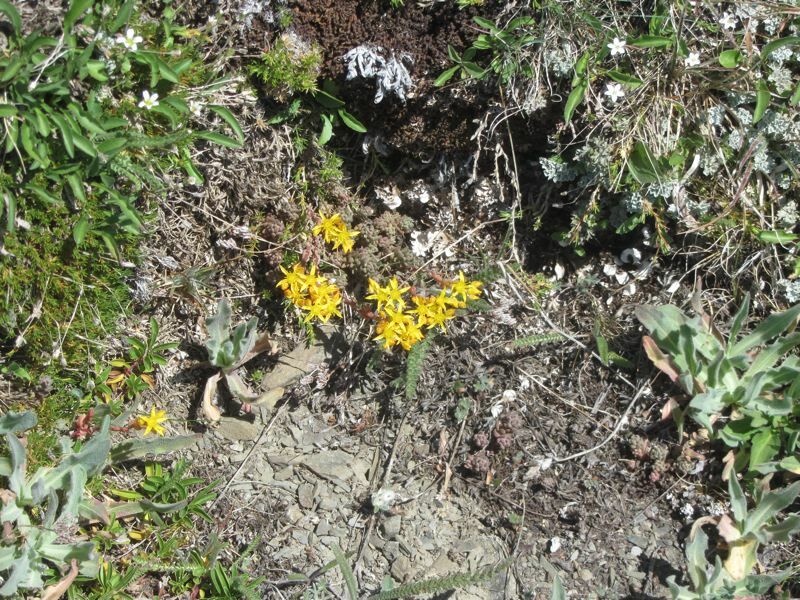 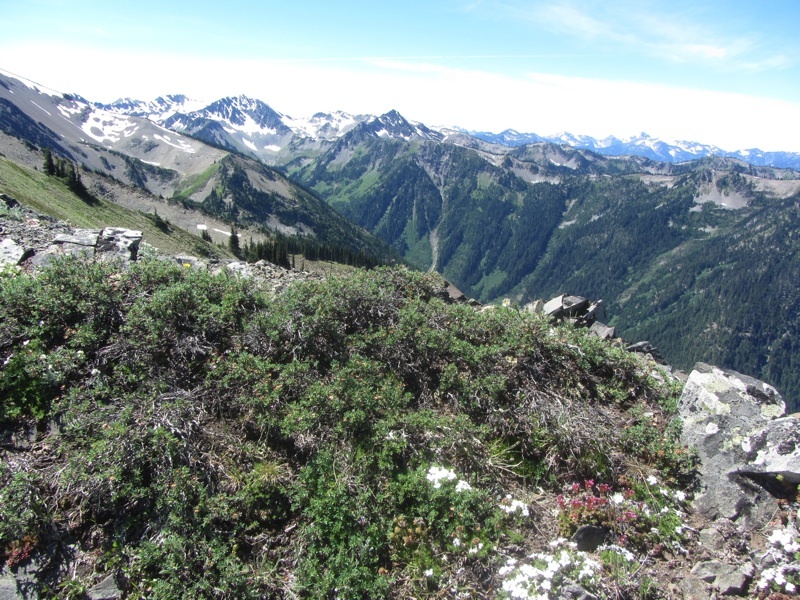 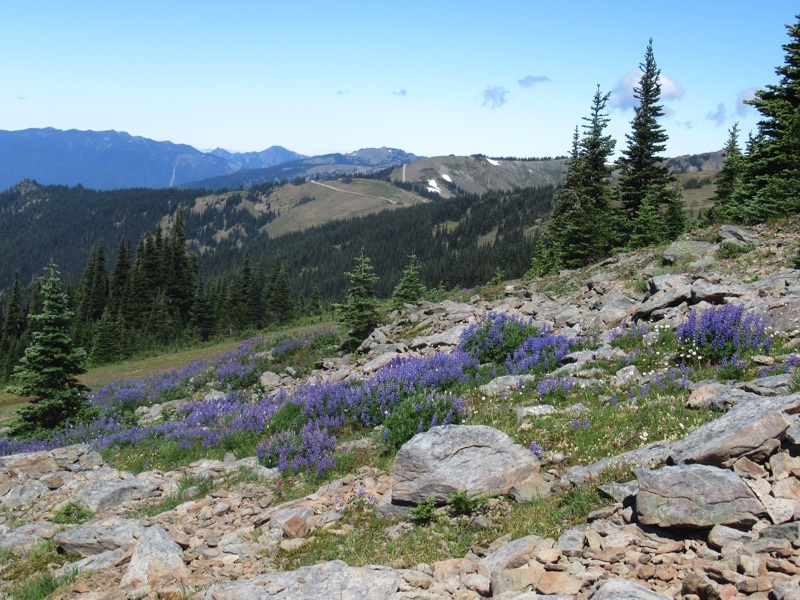 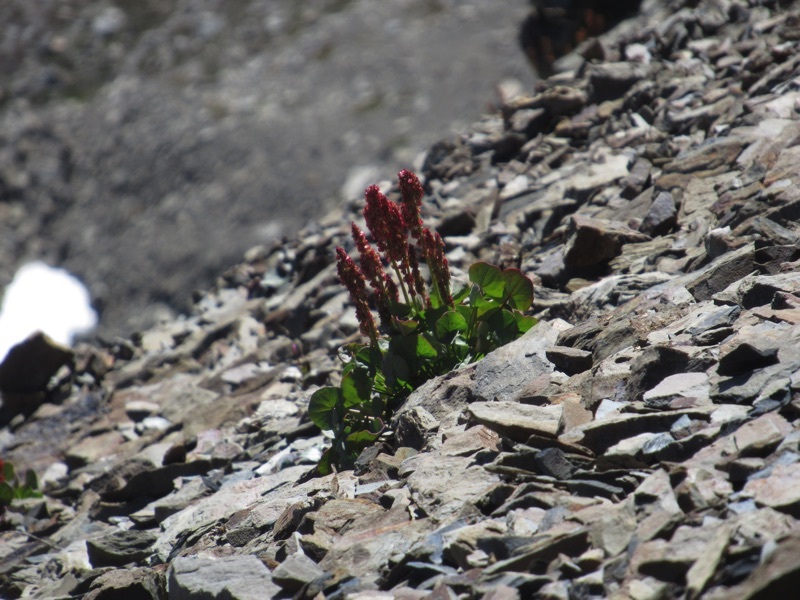 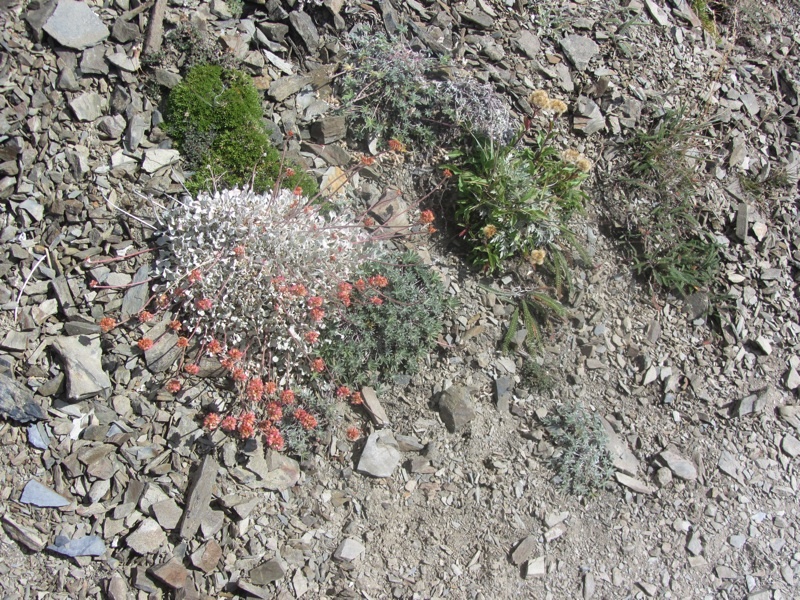 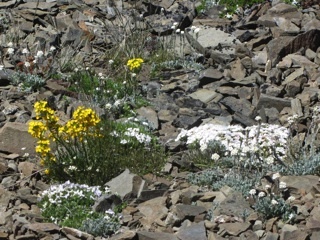 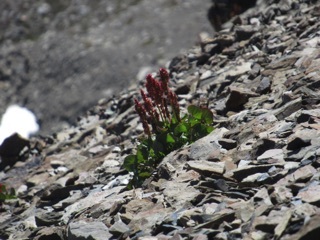 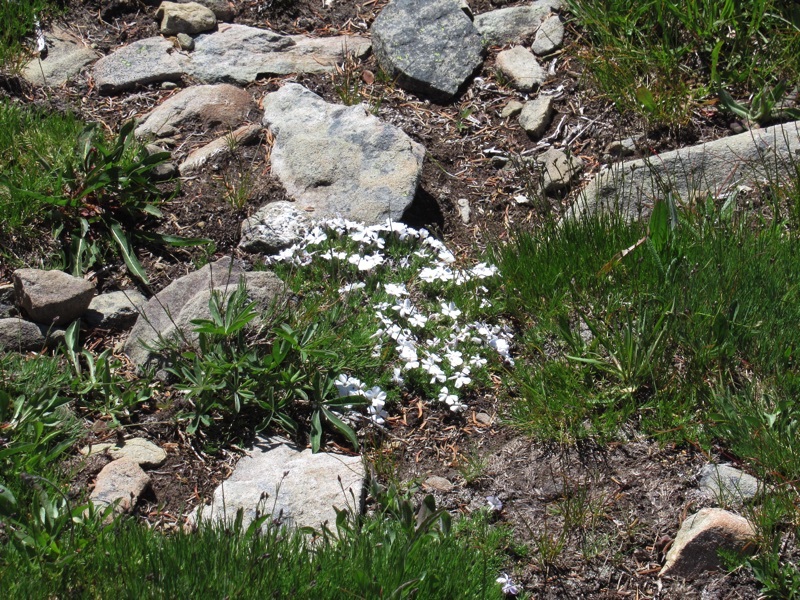 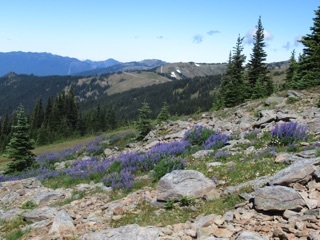 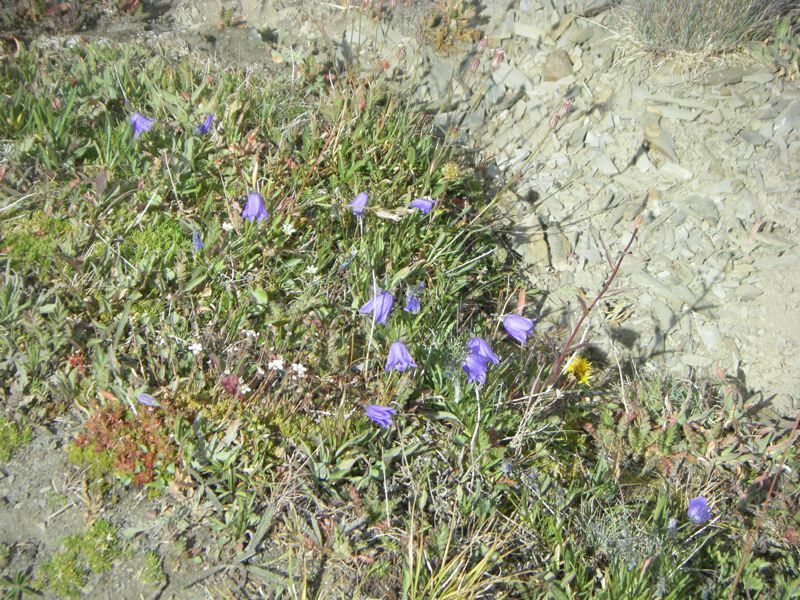 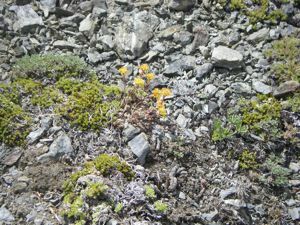 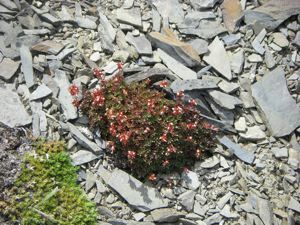 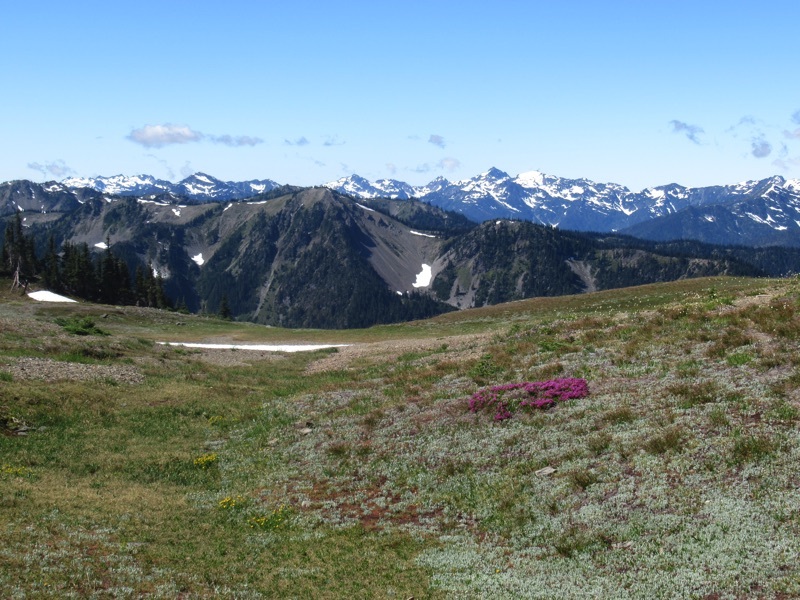 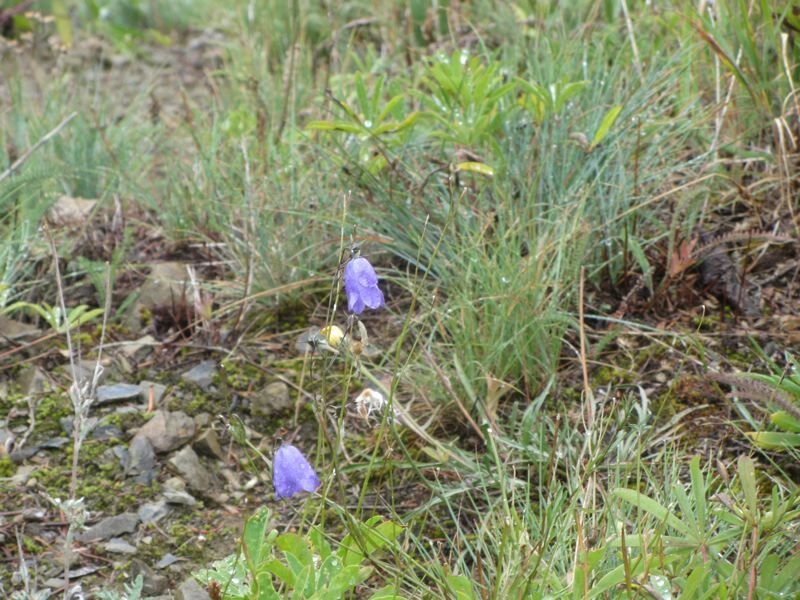 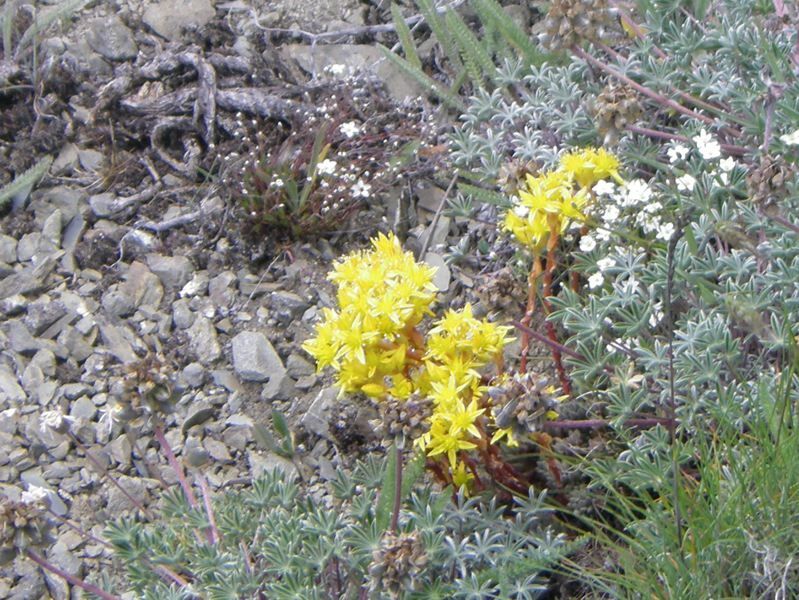 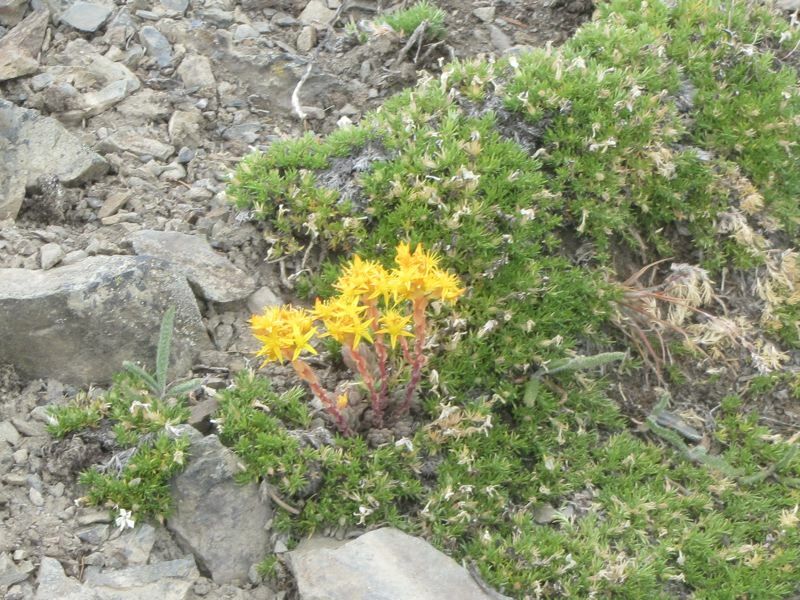 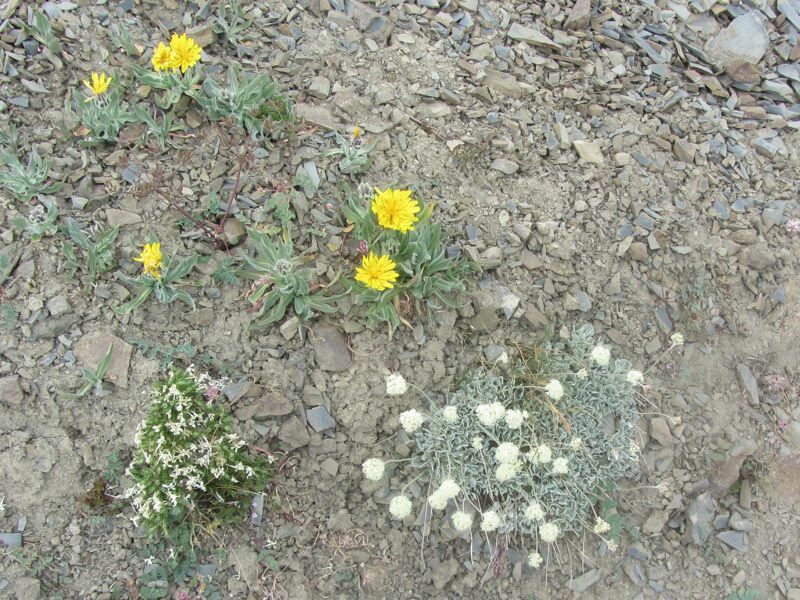 There were so many wonderful alpine flowers at Obstruction Point that we took too many pictures to fit in one post. 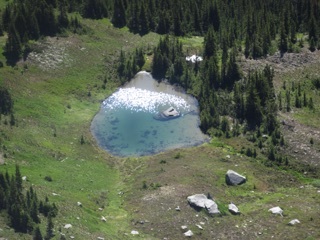 Think of this as the overflow post. 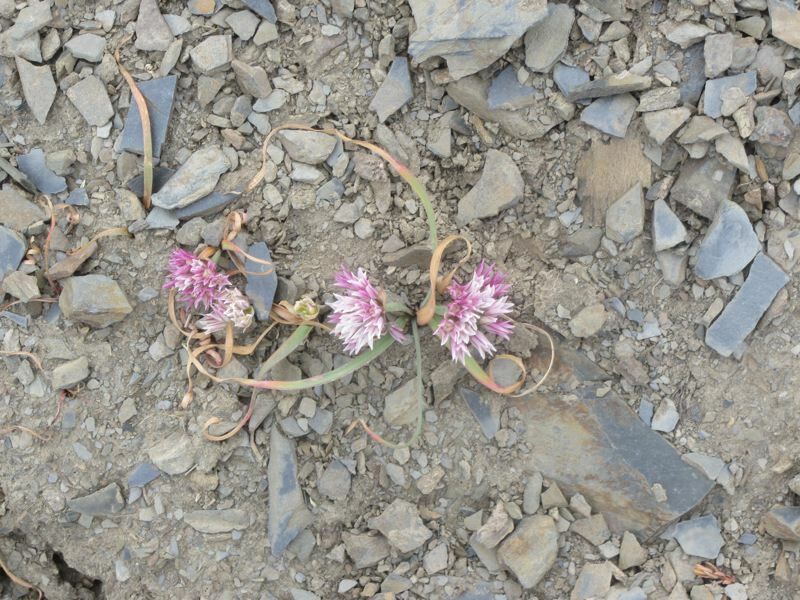 Ghost flower - We made that up. We really do need to take a course or something.